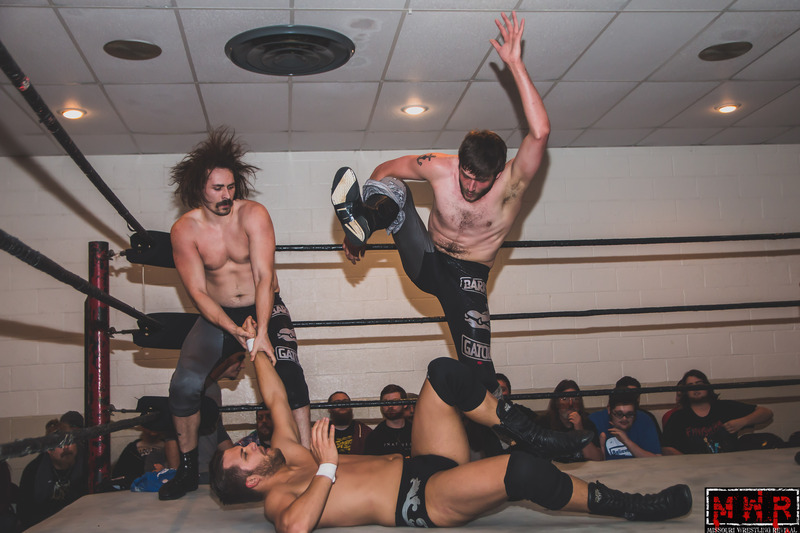 2016 may have been the single wildest season in the history of PWCS! 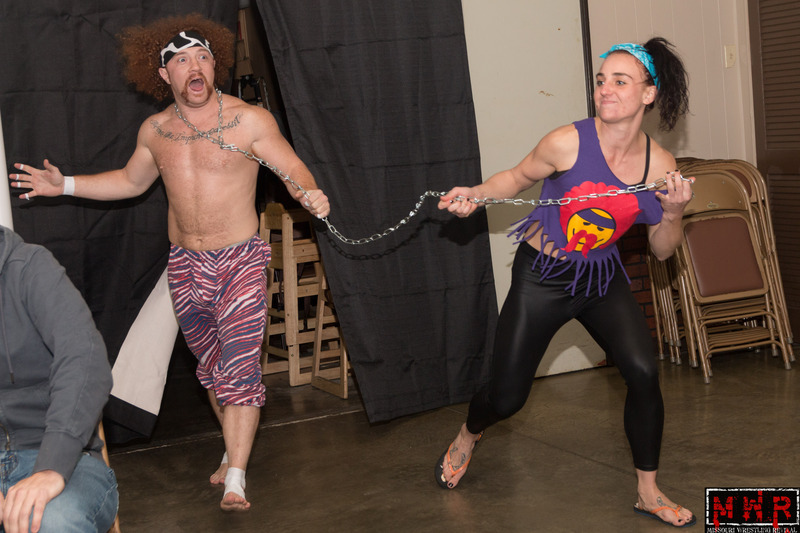 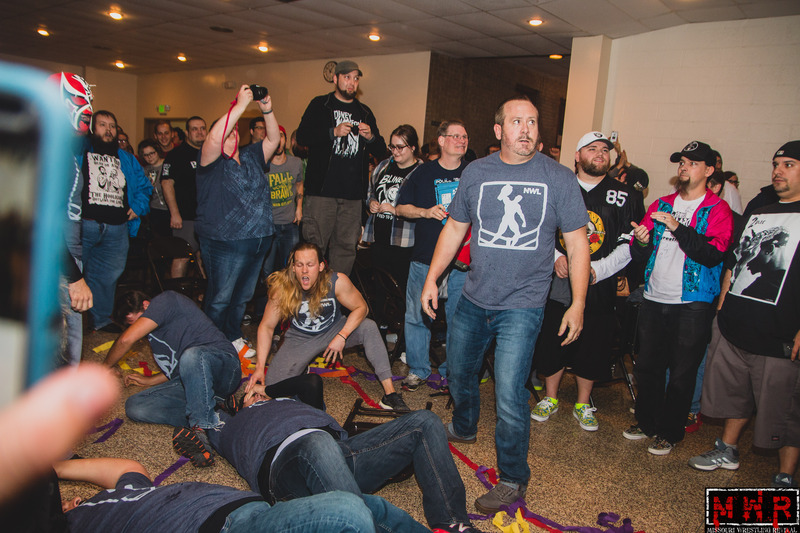 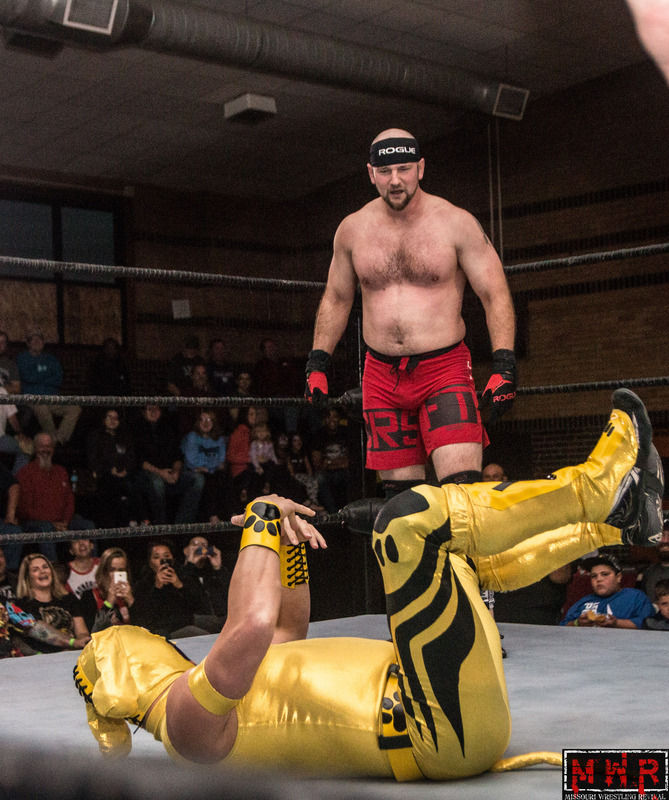 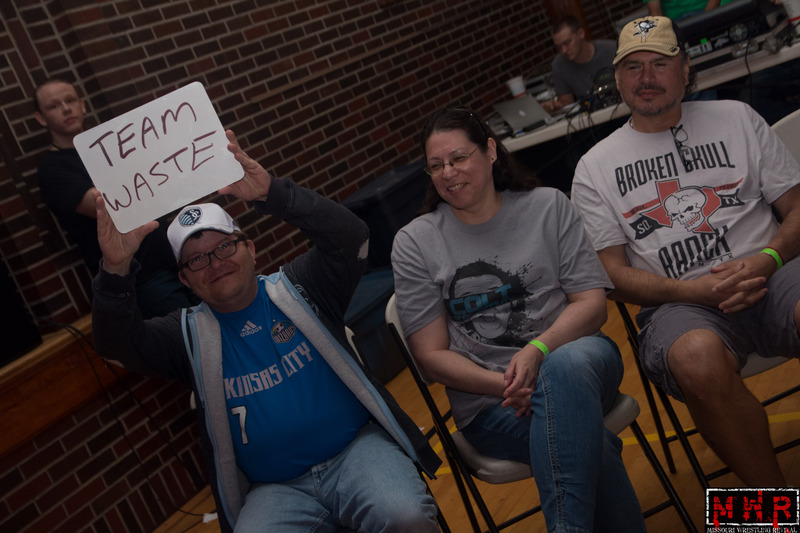 A season full of bitter rivalries, tearful goodbyes, and the best wrestling in St. Louis culminated with Danny Adams leading the Ego Busters to the 2016 PWCS Championship! 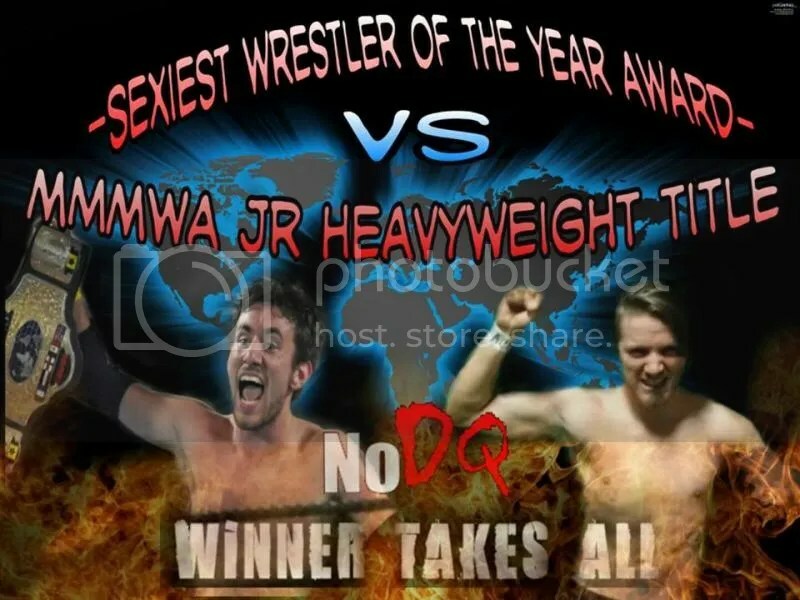 Also signed, a very special main event. 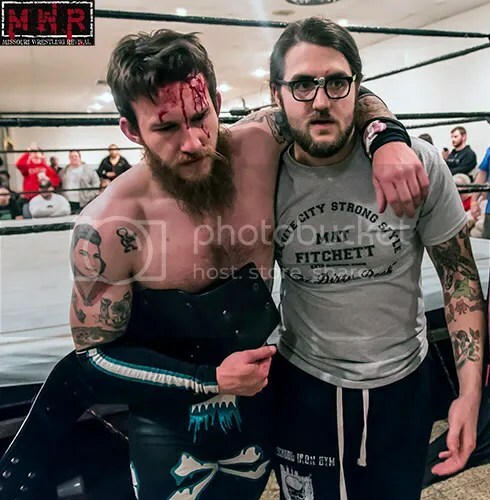 “The Miracle Worker” Davey Vega will put his newly earned PWCS Gateway Heritage Championship on the line against his tag partner and best friend “The Dirty Rook” Mat Fitchett! 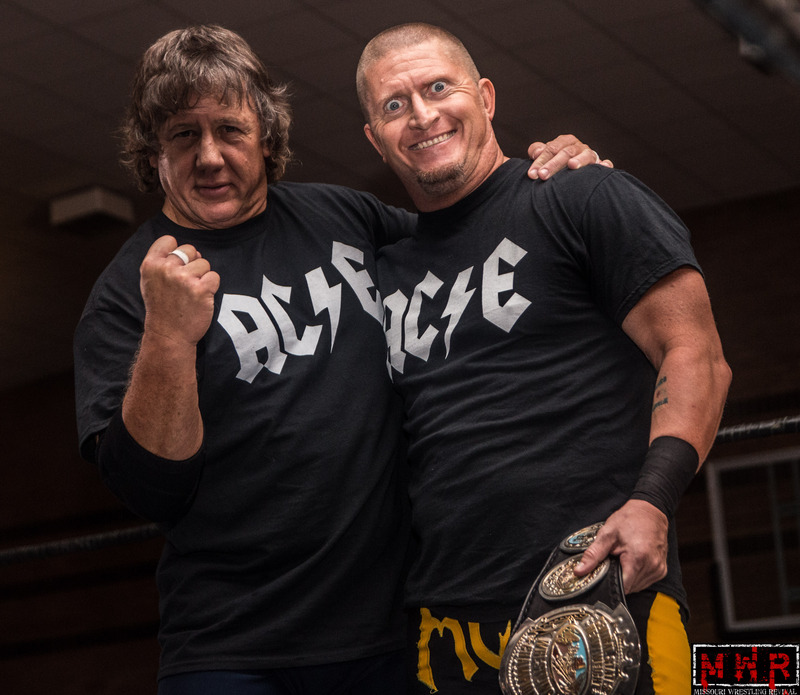 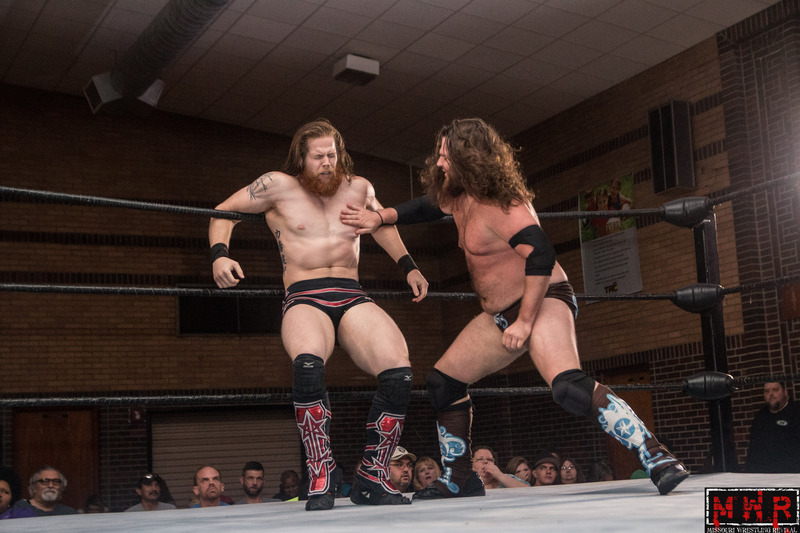 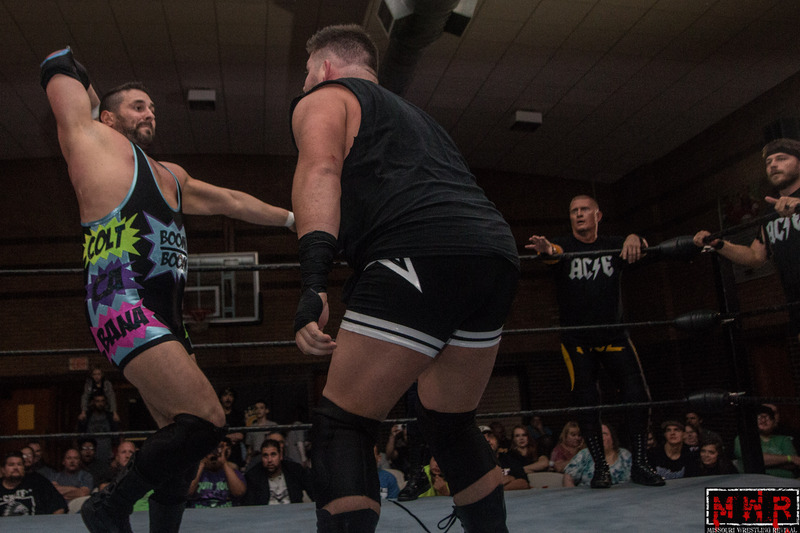 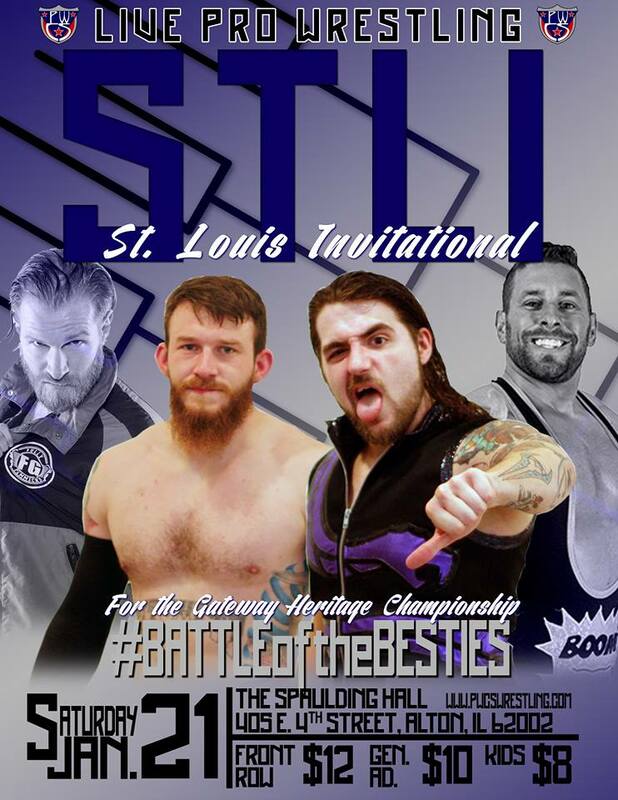 These two pillars of St. Louis have never faced off in the area and are set for a marquee match January 21st for PWCS’s new MVP prize, the Gateway Heritage Championship. 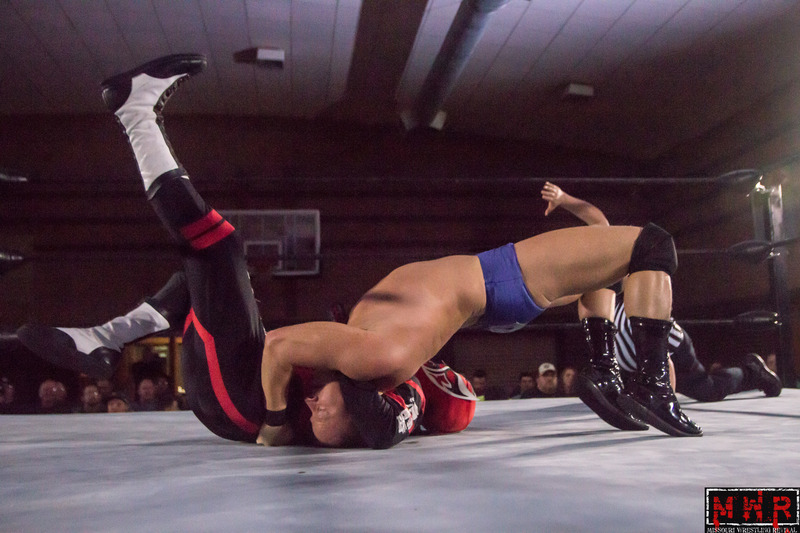 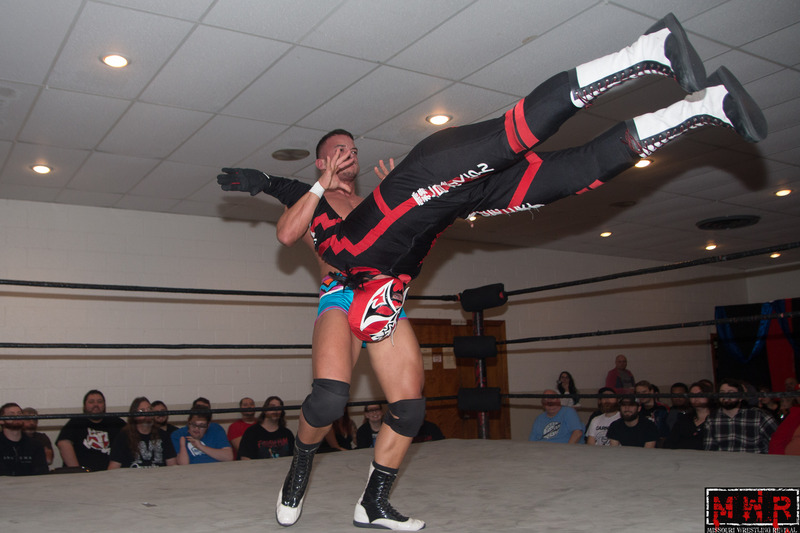 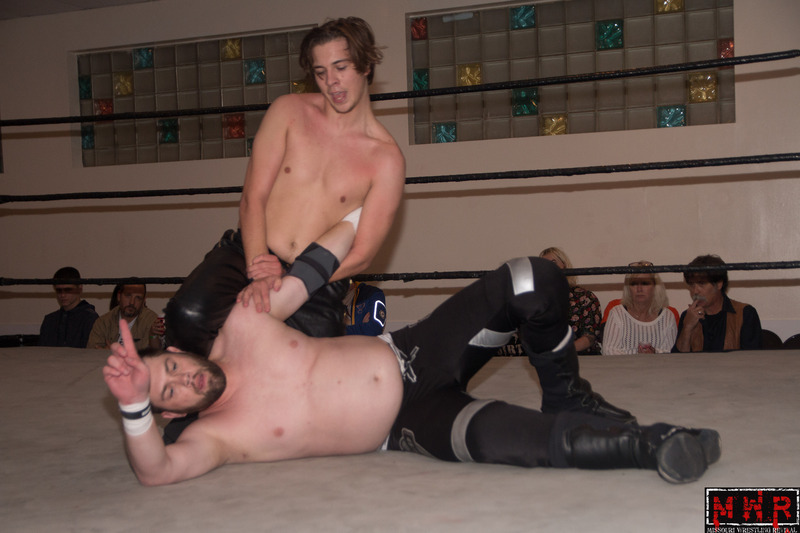 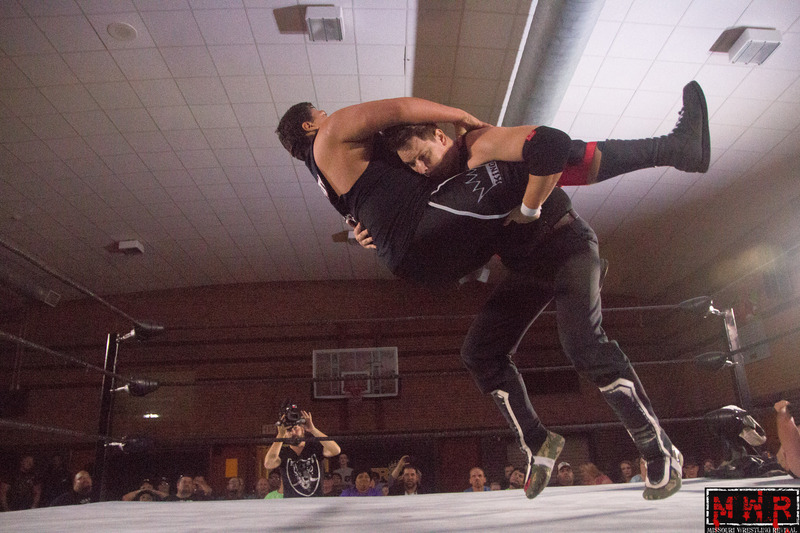 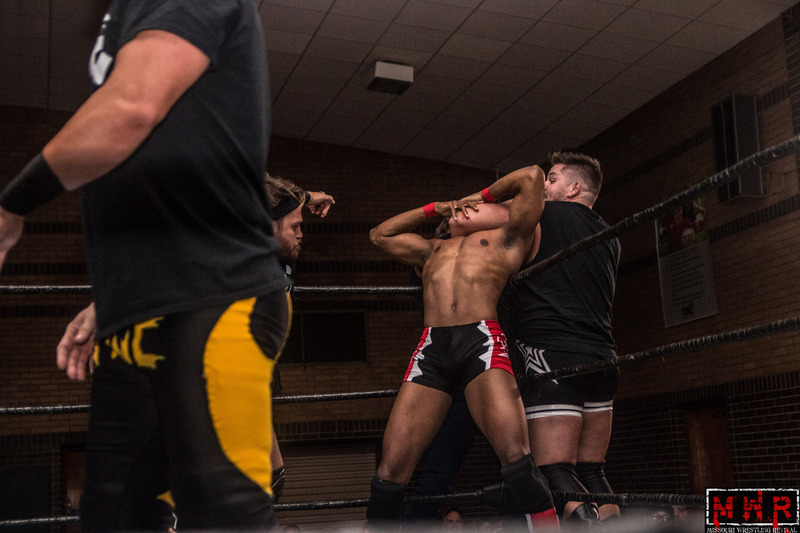 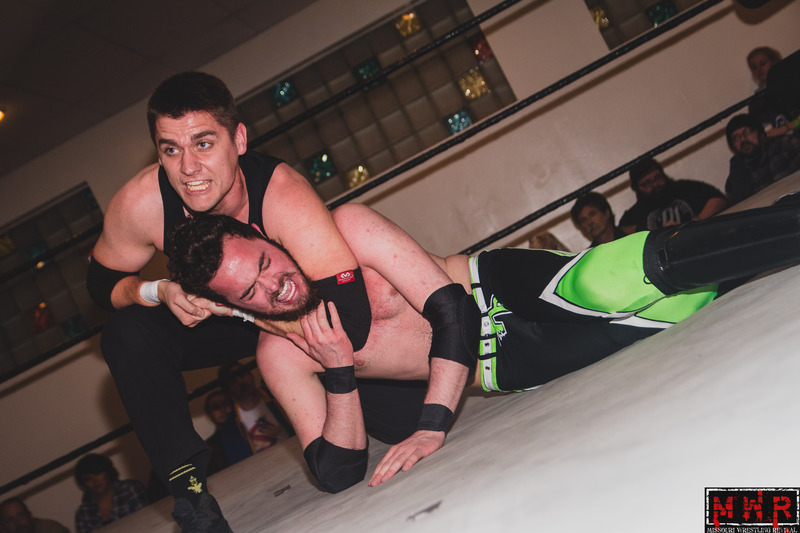 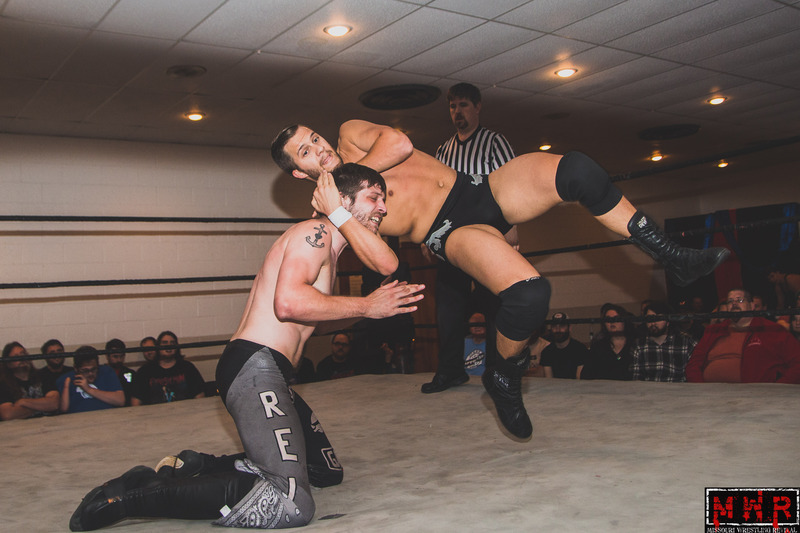 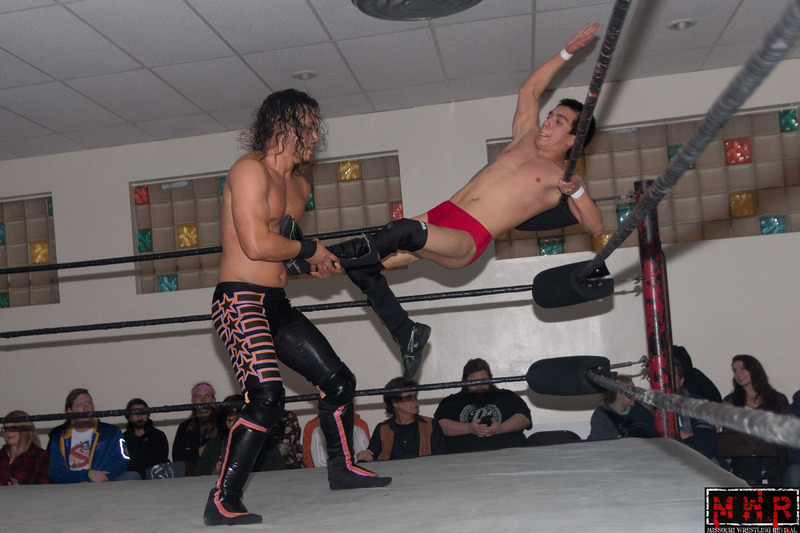 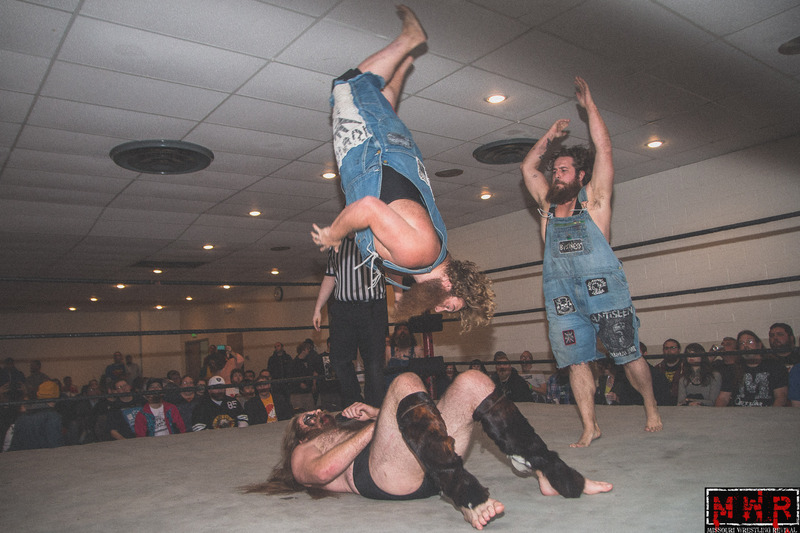 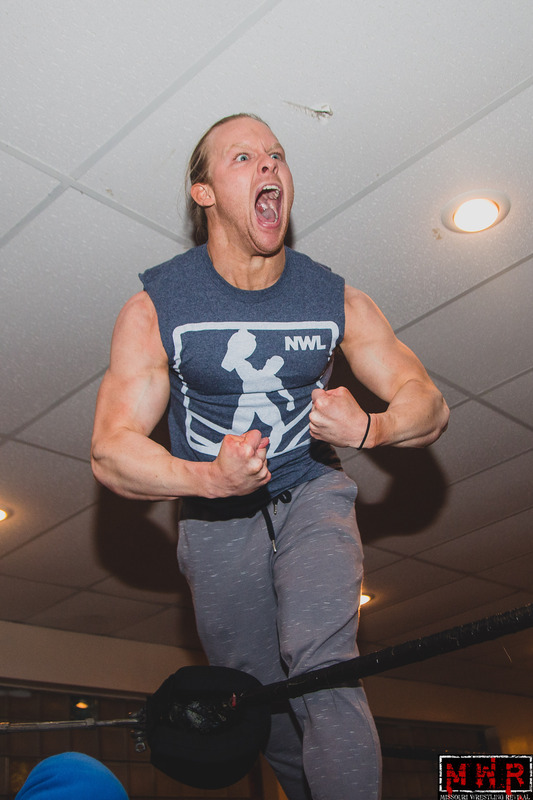 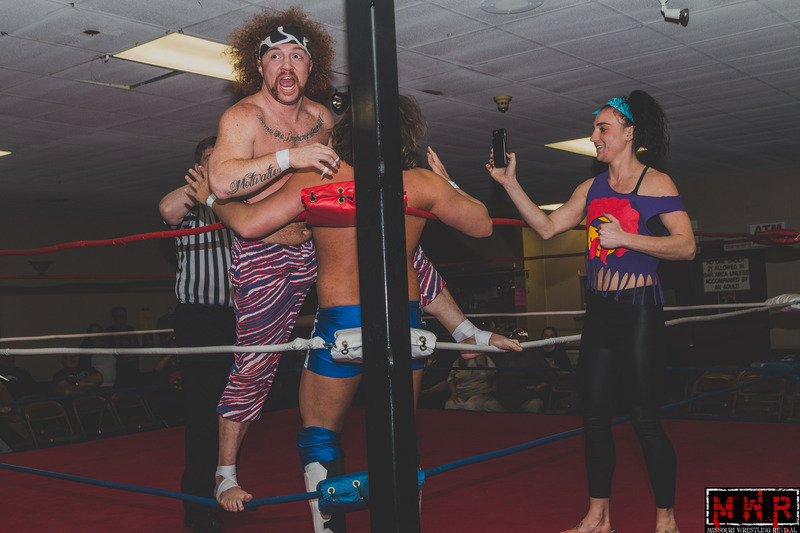 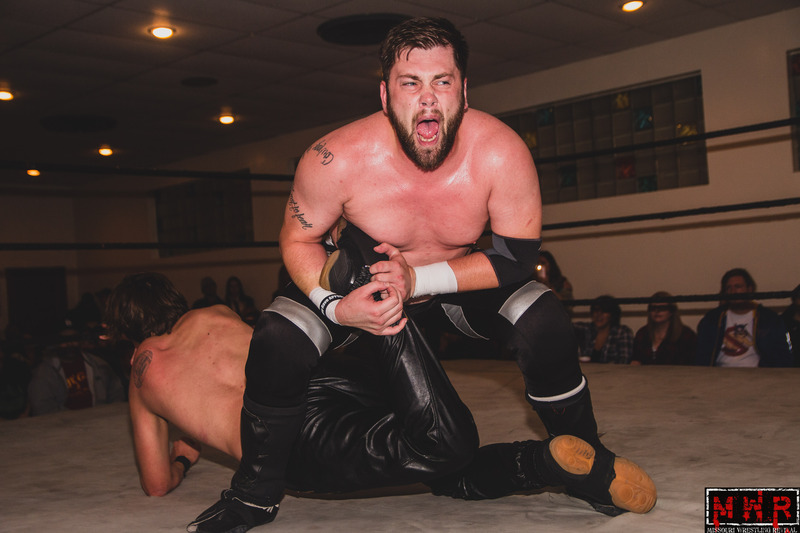 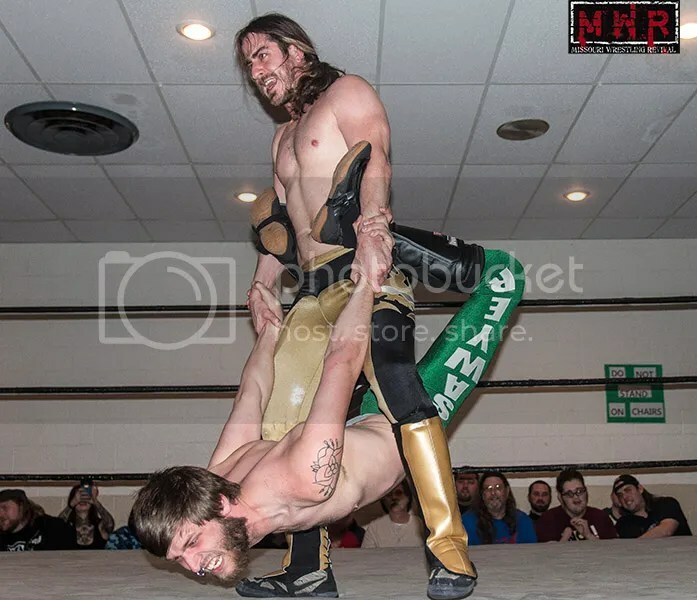 Leone Mephisto was beside himself, almost to the point of insane about the attention that the Midwest heartthrob Brandon Aarons had received heading into the tournament to crown the new Pro Wrestling Epic Championship in Pontoon Beach, Illinois. 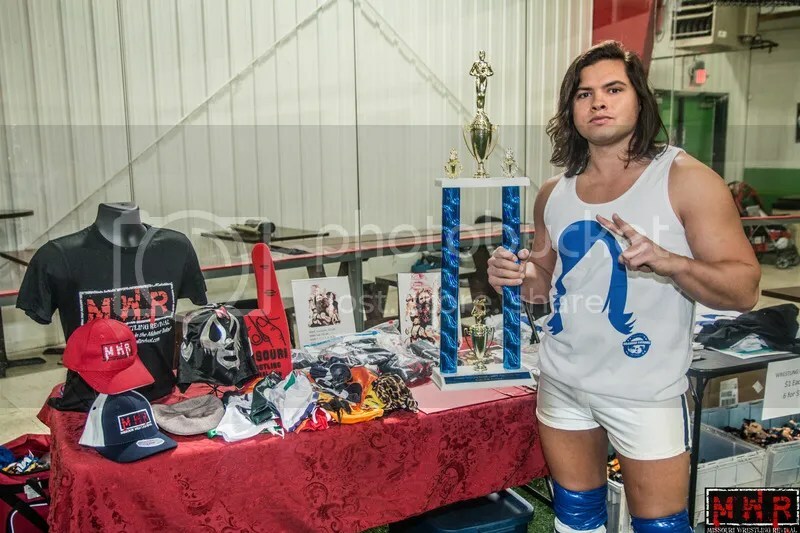 In February, thousands of fans flocked to the Missouri Wrestling Revival web site to vote him as the 2015 MWR Sexiest Male of the Year. 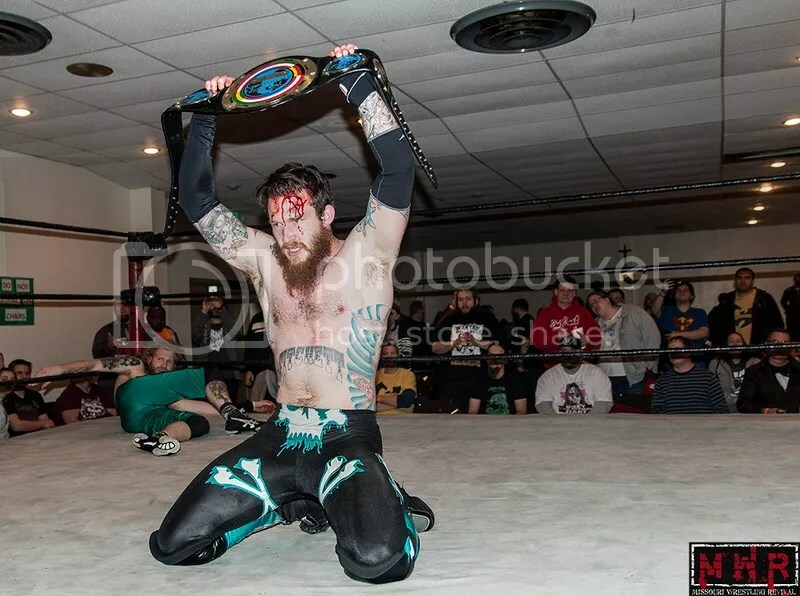 When MWR took the time to feature Aarons prior to the event on the site with 10 questions on his career and the upcoming tournament, Mephisto took exception that he was not mentioned at all as a threat to the title. 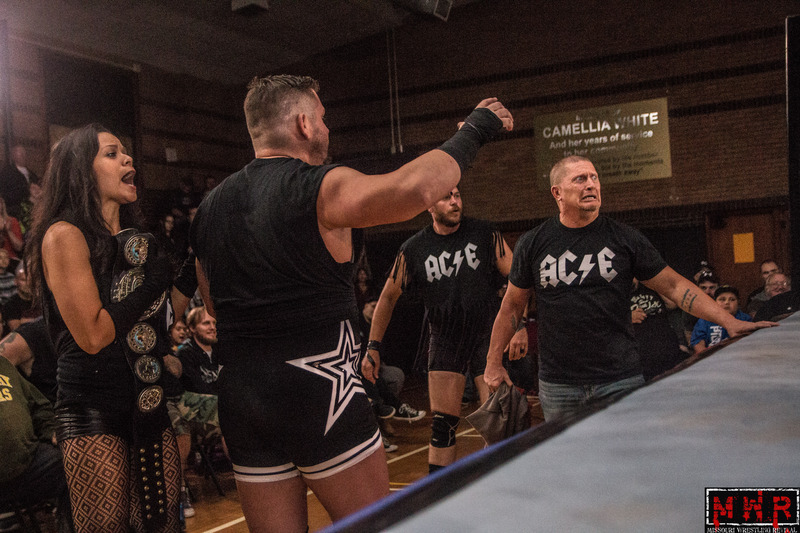 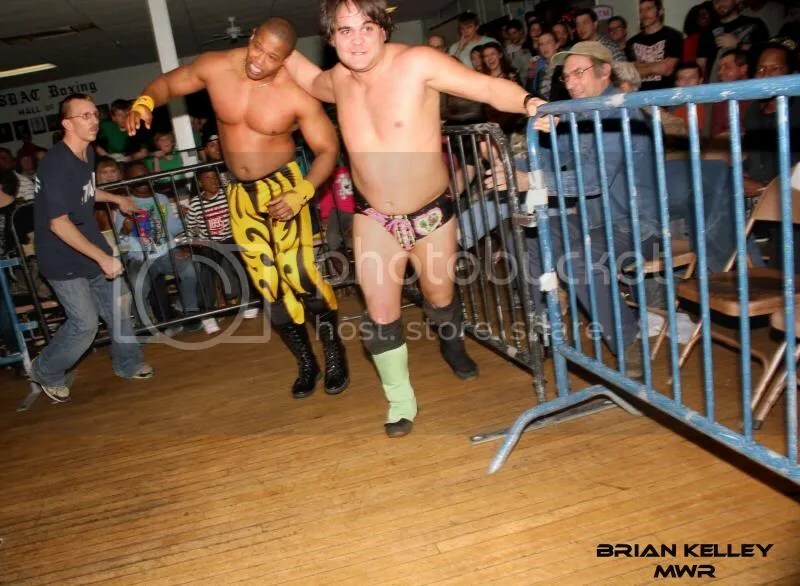 Any other time an opportunity to be honored by the fans with a trophy, would be a wonderful experience, but when it was announced to Aarons that he would be presented with the trophy prior to his match against Steven Kennedy, there was some buzz from several of the other wrestlers that felt that Aarons’ needed to be knock off of his pedestal. 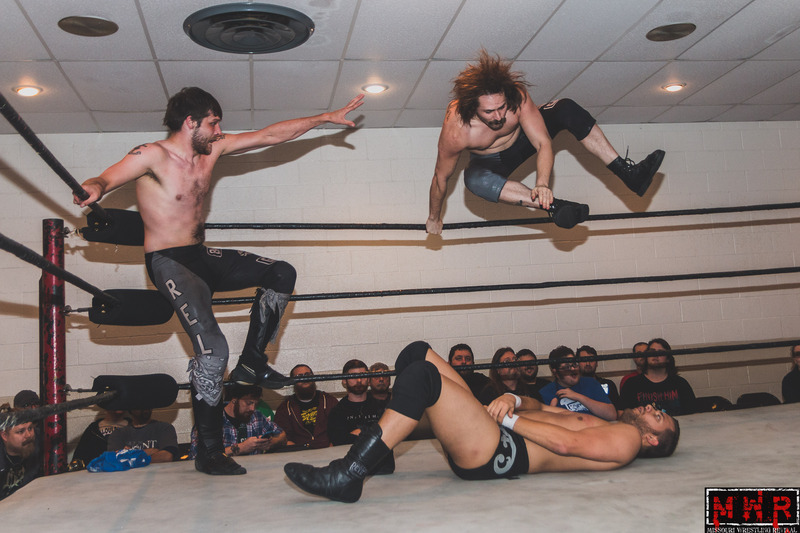 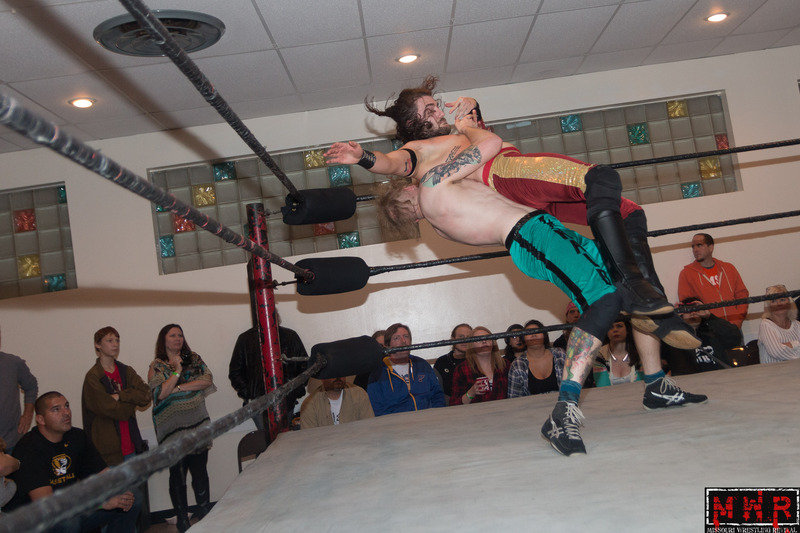 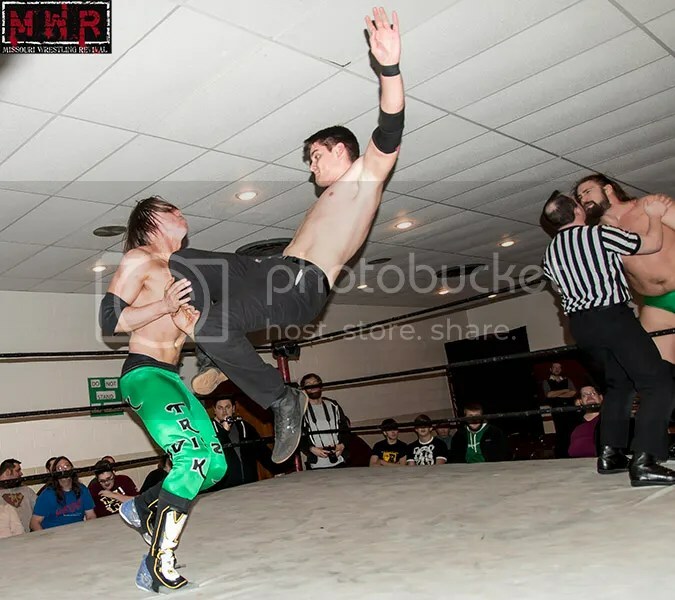 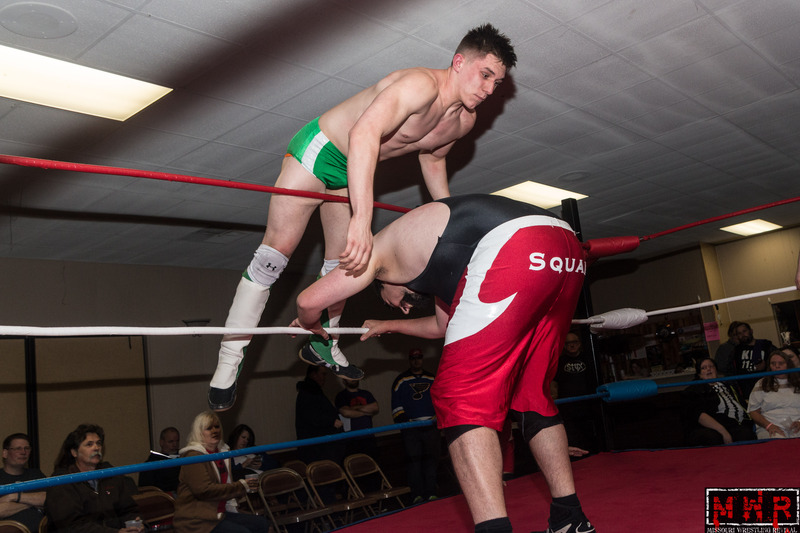 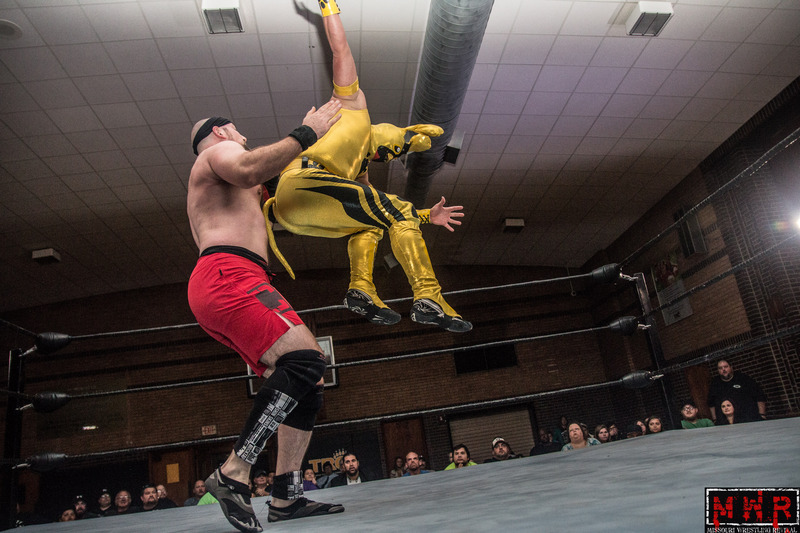 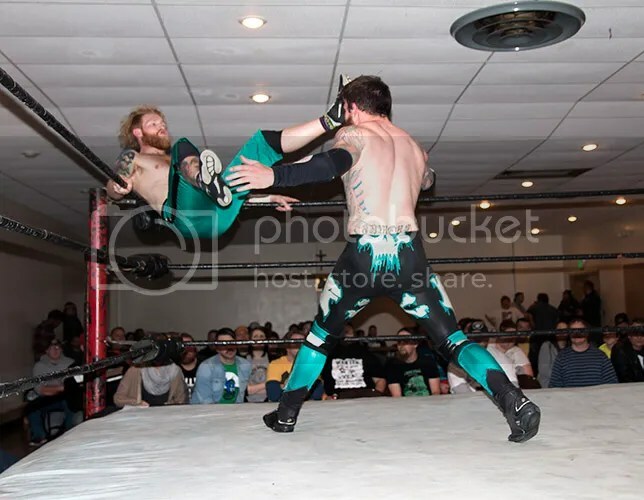 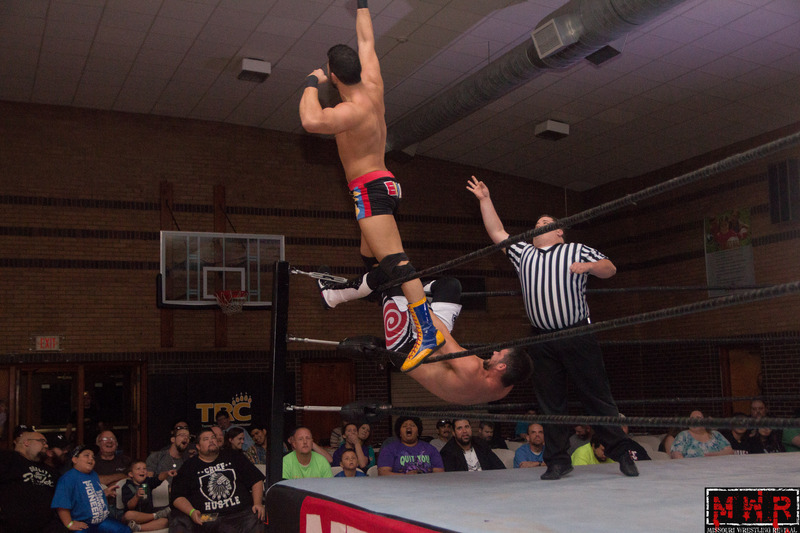 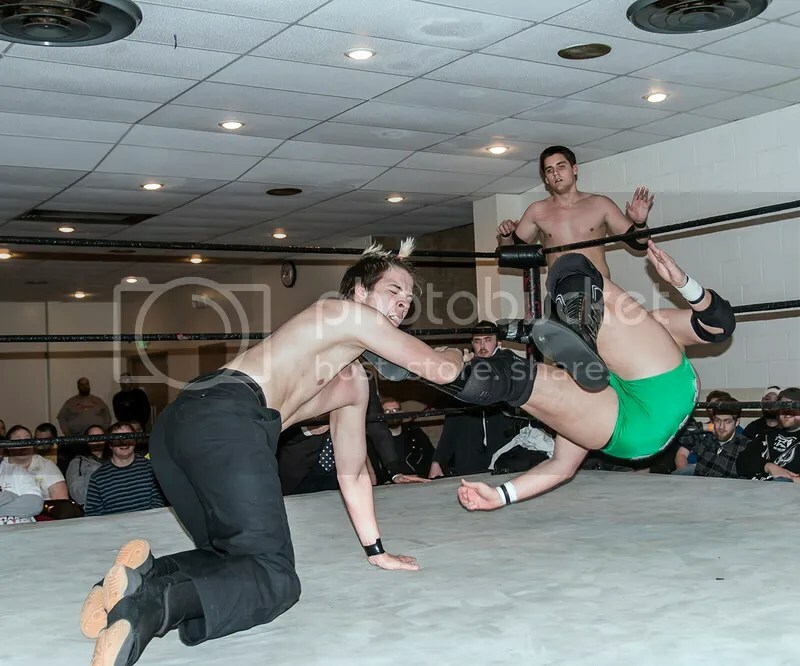 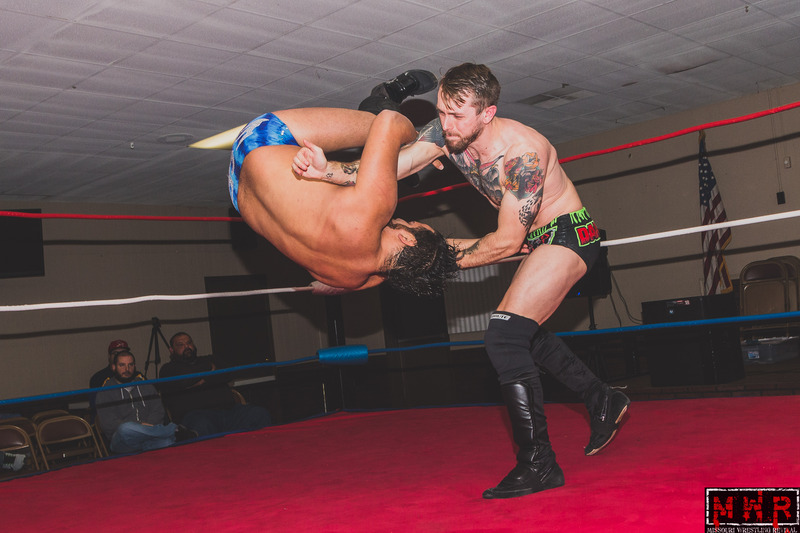 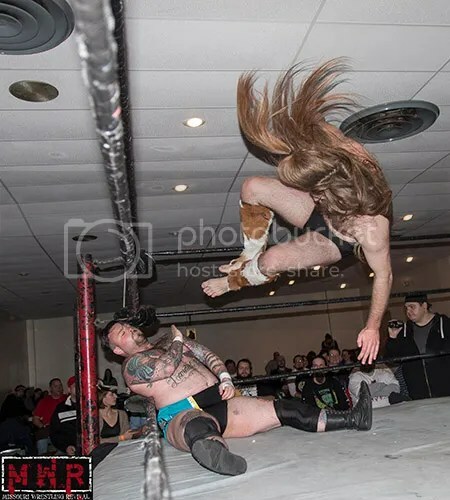 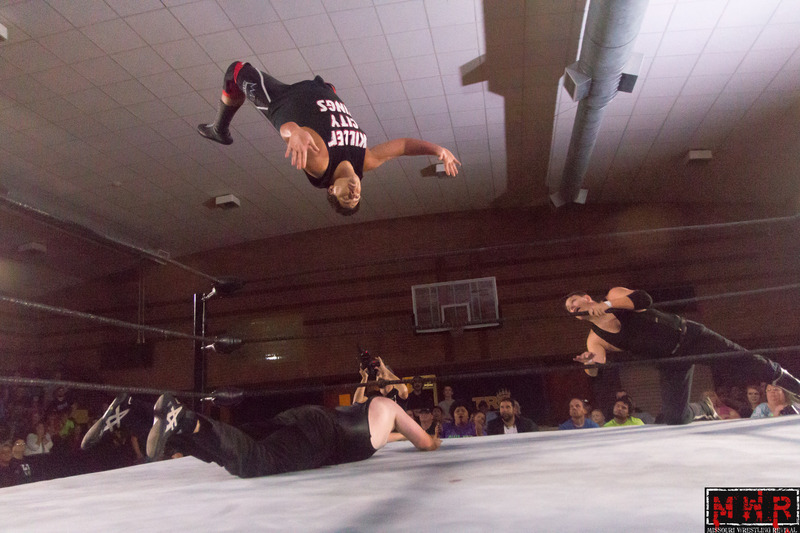 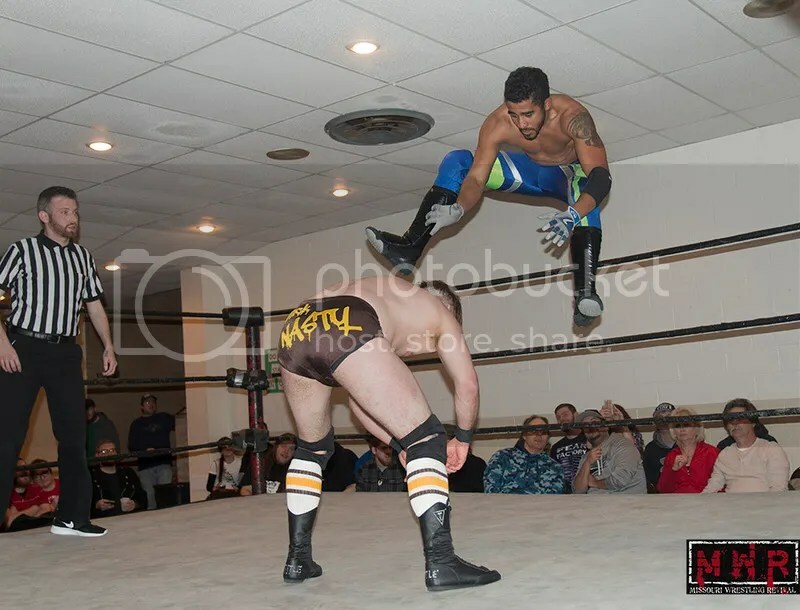 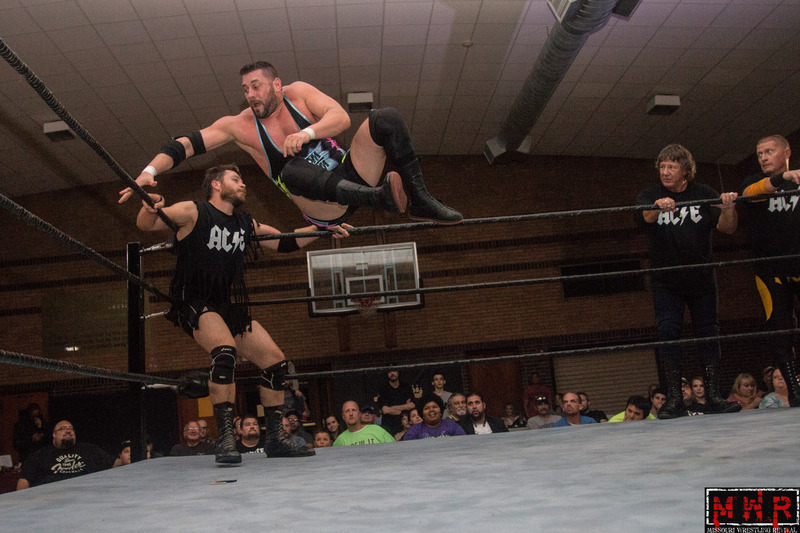 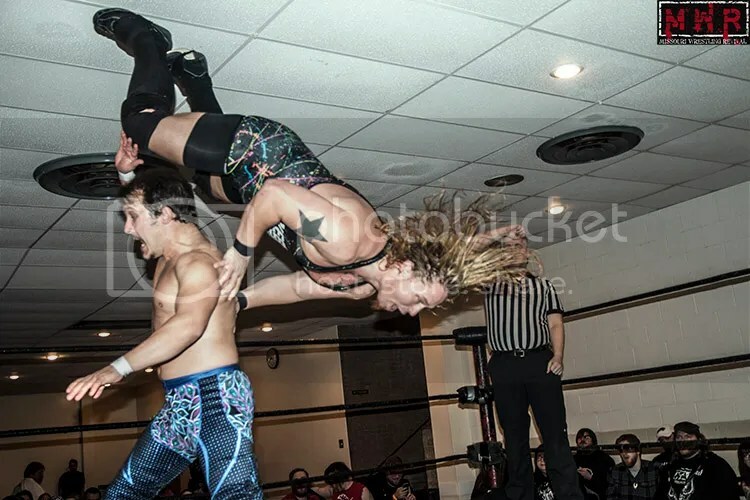 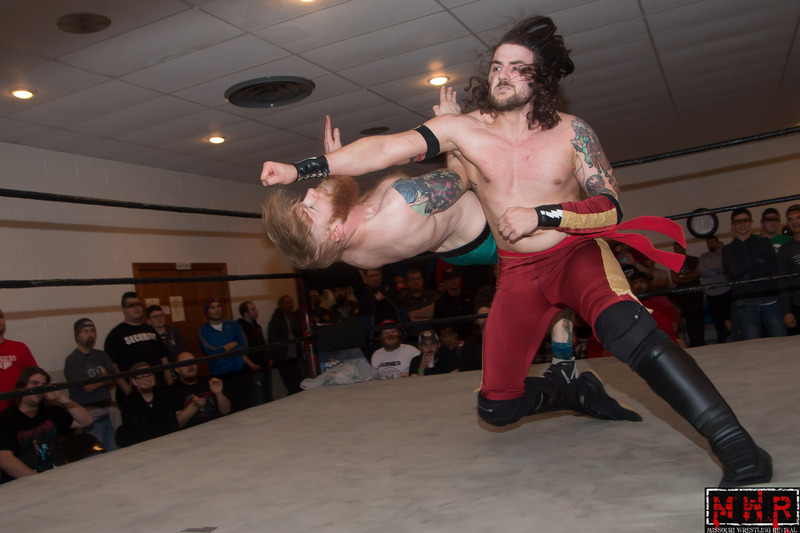 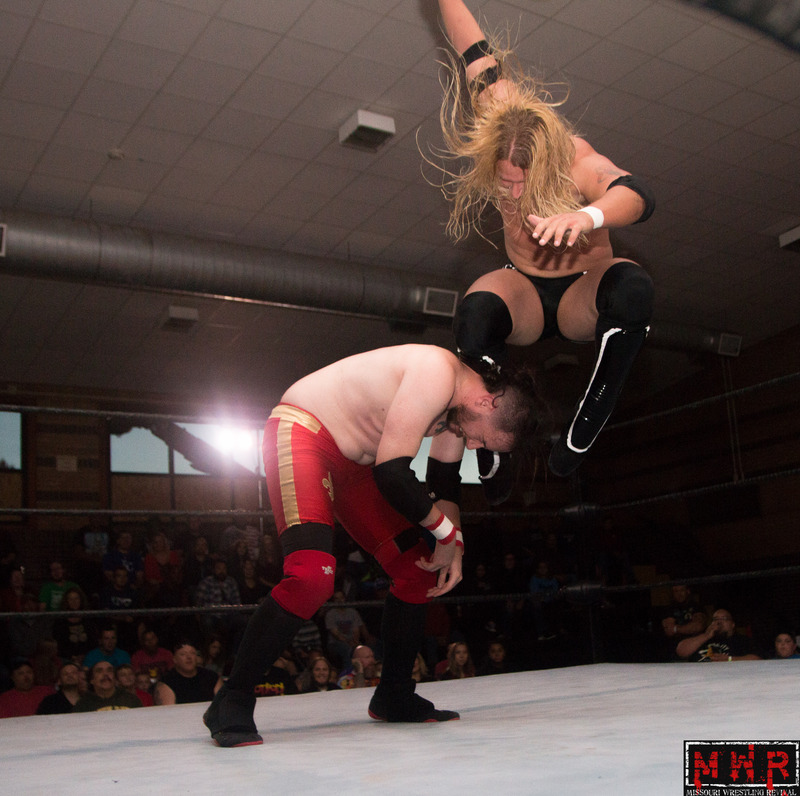 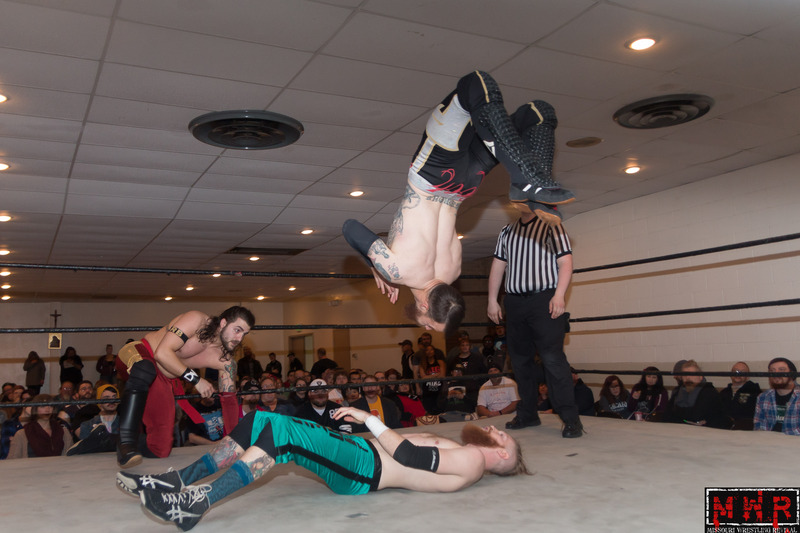 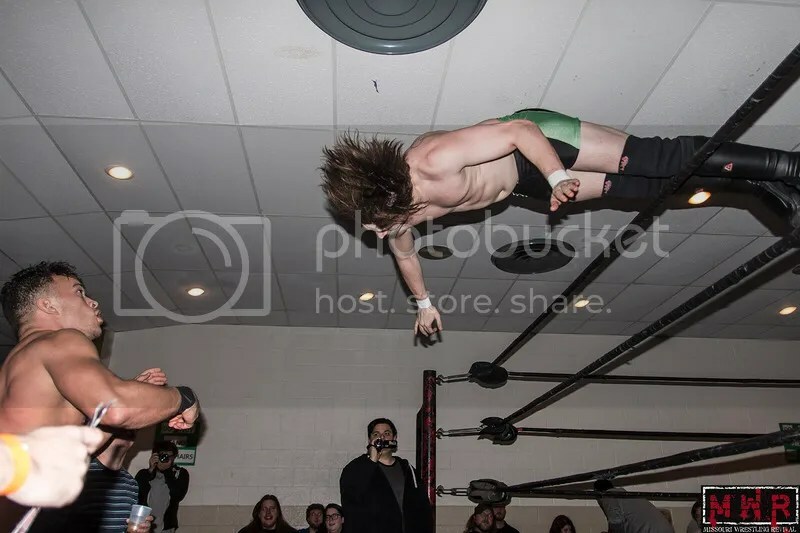 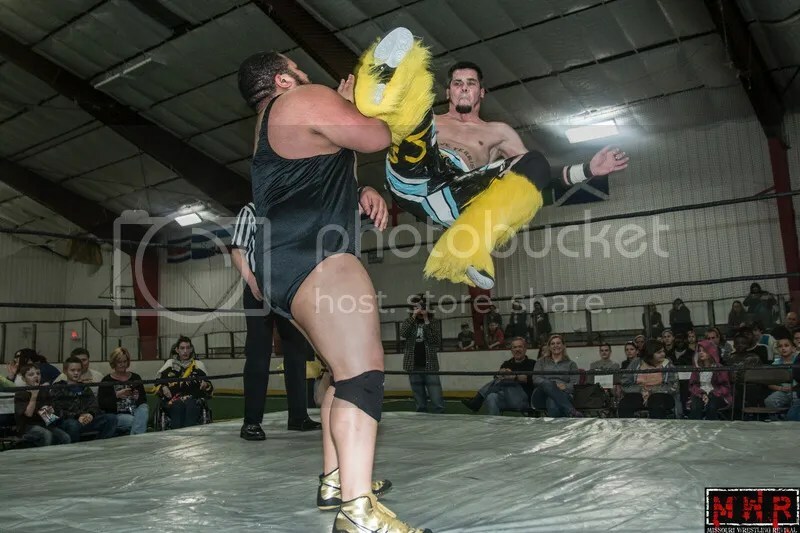 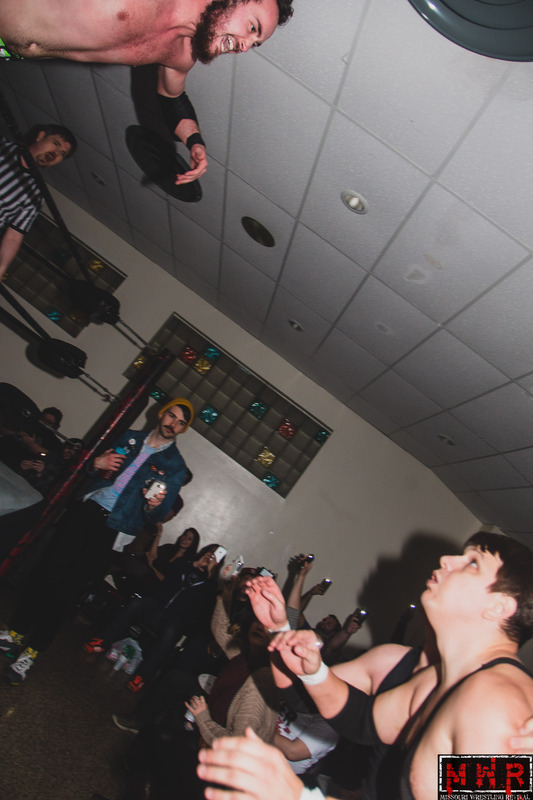 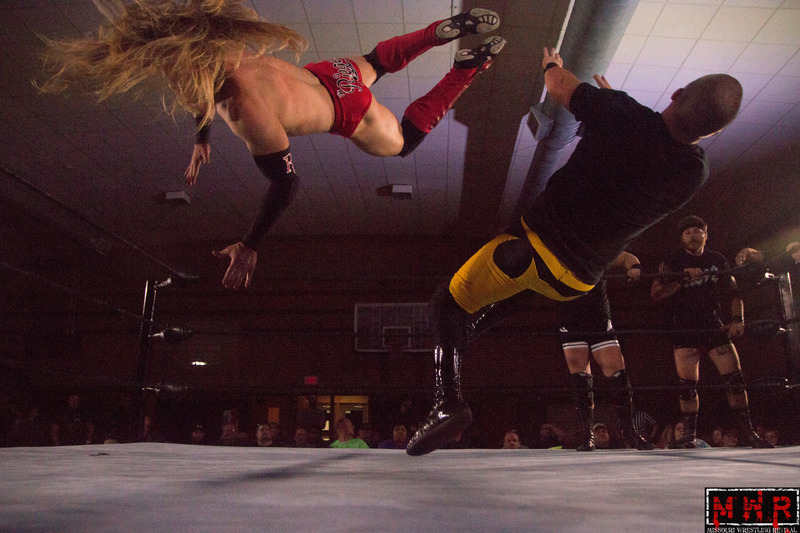 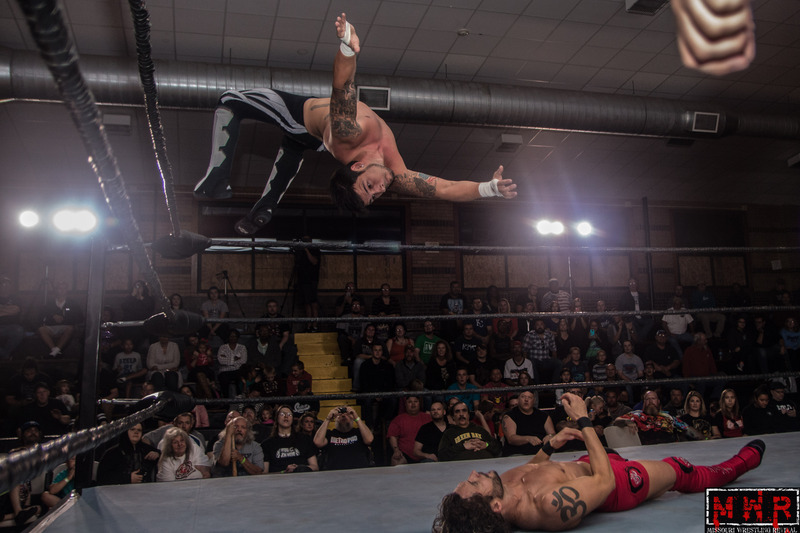 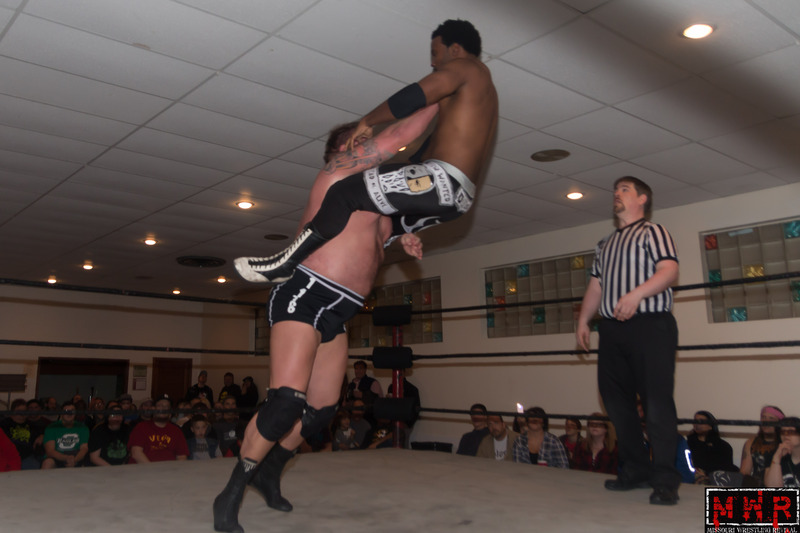 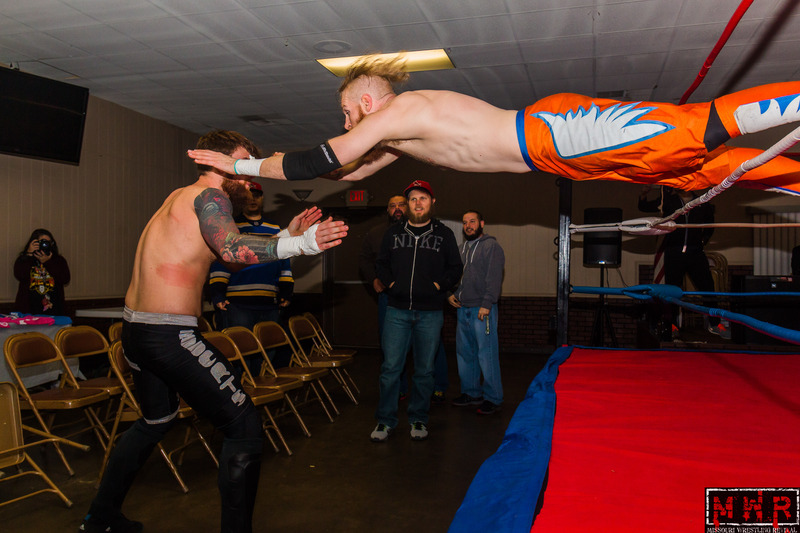 In the first round, the high flyer Billy McNeil used his speed and experience to defeat the Sean Orleans protégé Laurence Johnson via a frog splash from the top rope to head into the finals of the PWE tournament. 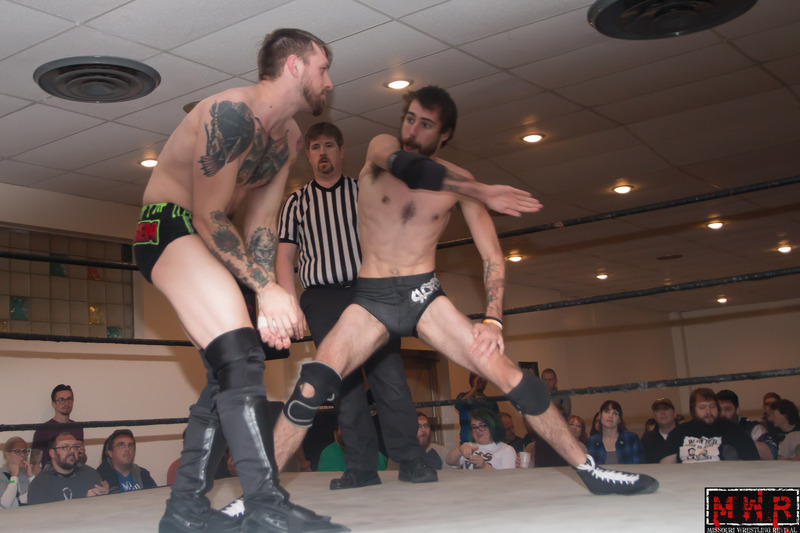 The second match would feature Danny Adams and Curt Stallion in what could be their biggest match up to that point. 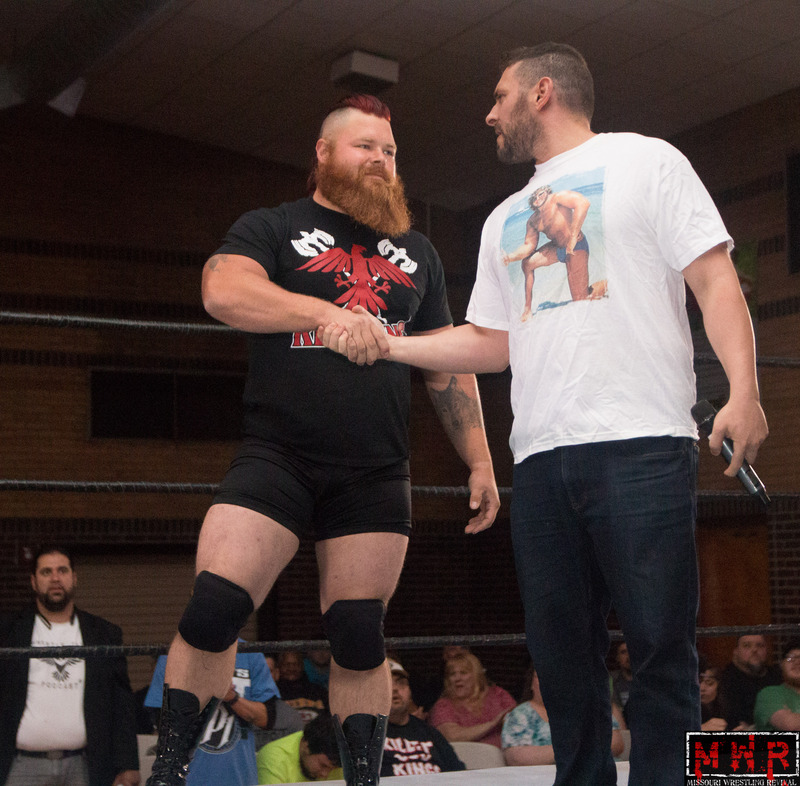 On this night, Adams would get the victory to move forward in the tournament, but there is no doubt that you have heard the last of Stallion. 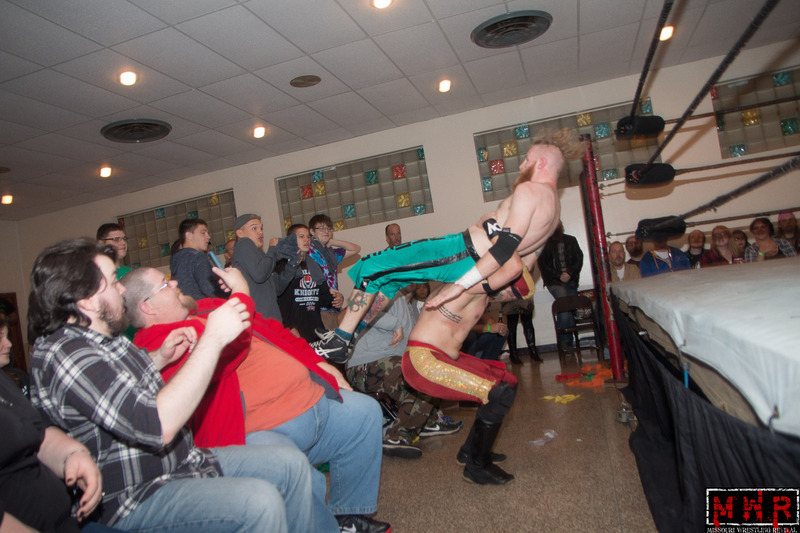 Leone Mephistos crazed obsession with Brandon Aarons was apparent from the moment he came to the ring for his match against Everett Connors. 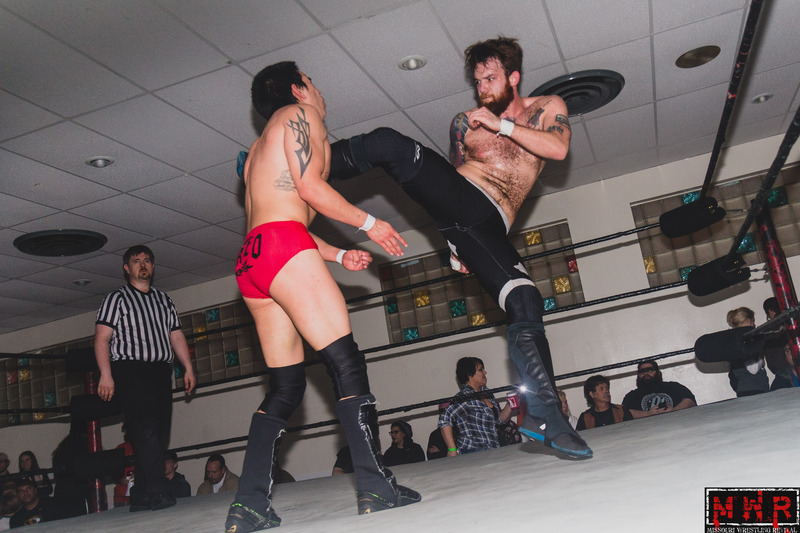 Mephisto continued to call him Brandon, before and after of the dismantling of the rookie for the win. 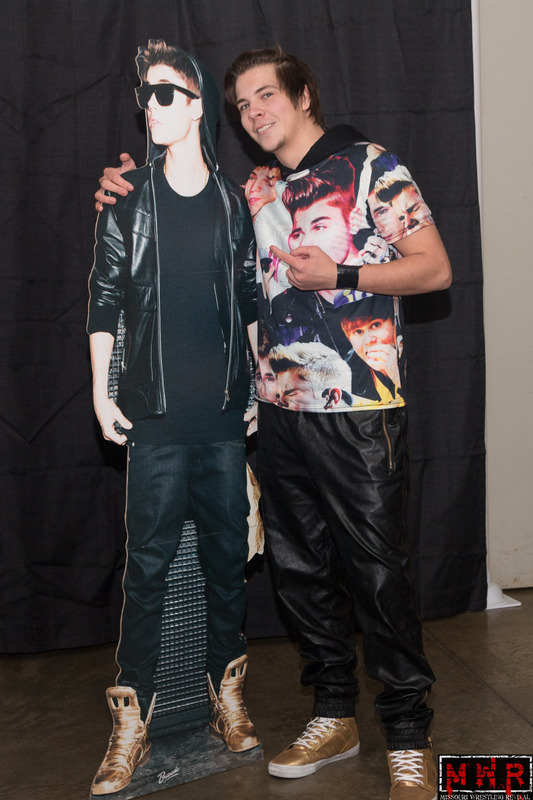 Mephisto was not the only one that took exception to Aarons getting attention. 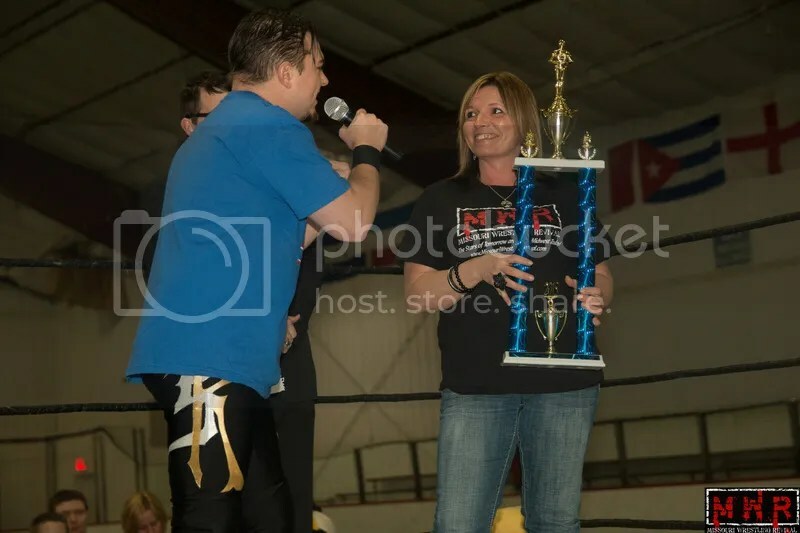 As MWR Fan relations Dubray Tallman was presenting the MWR Sexiest Male trophy to Aarons, Steven Kennedy came to the ring demanding to know why he was not declared to be the winner. 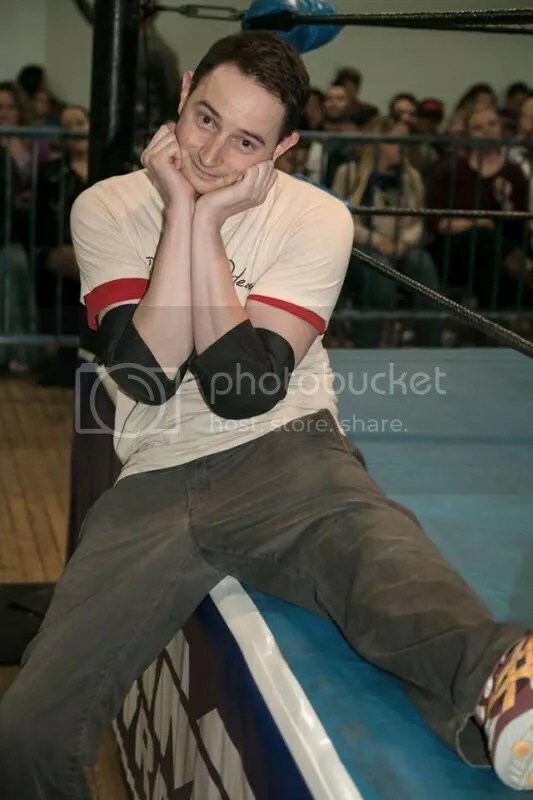 Even though he was told that he was not even nominated to be named the Sexiest Wrestler, Kennedy would hear none of it. 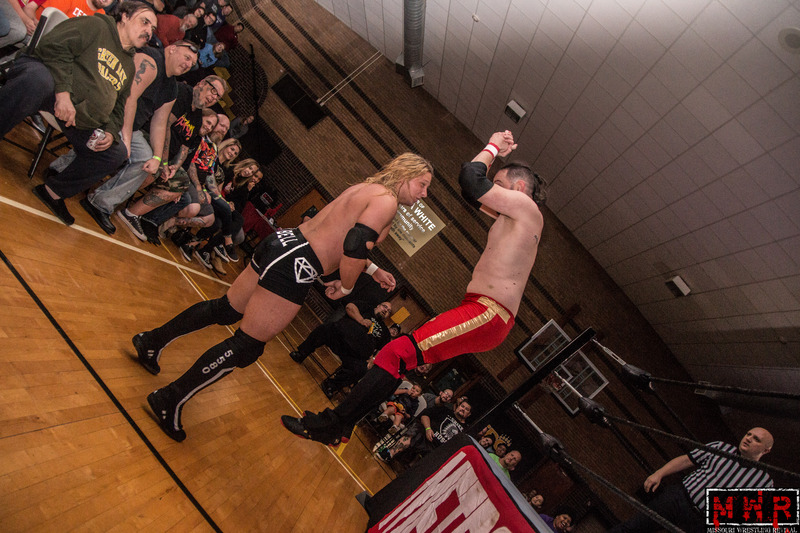 Within moments the battle was on for the final spot in the championship main event match. 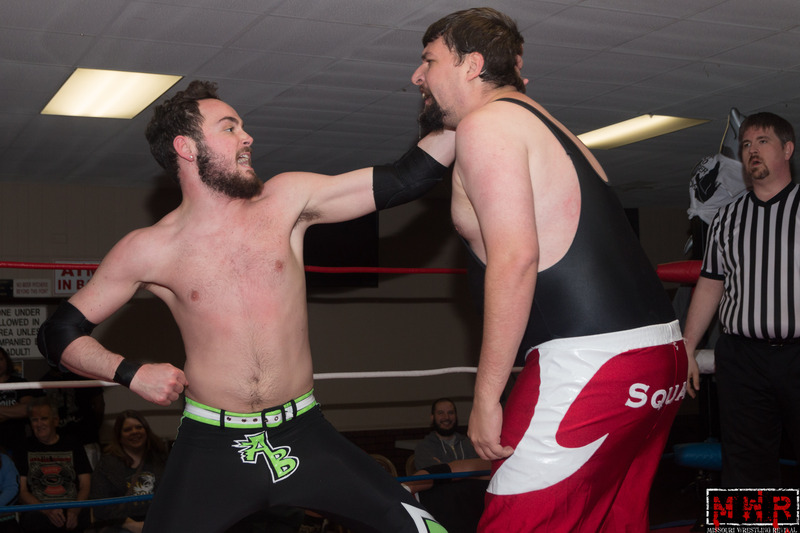 The two had battled many times before and knew each others tendencies as they matched each others moves with a counter strike. 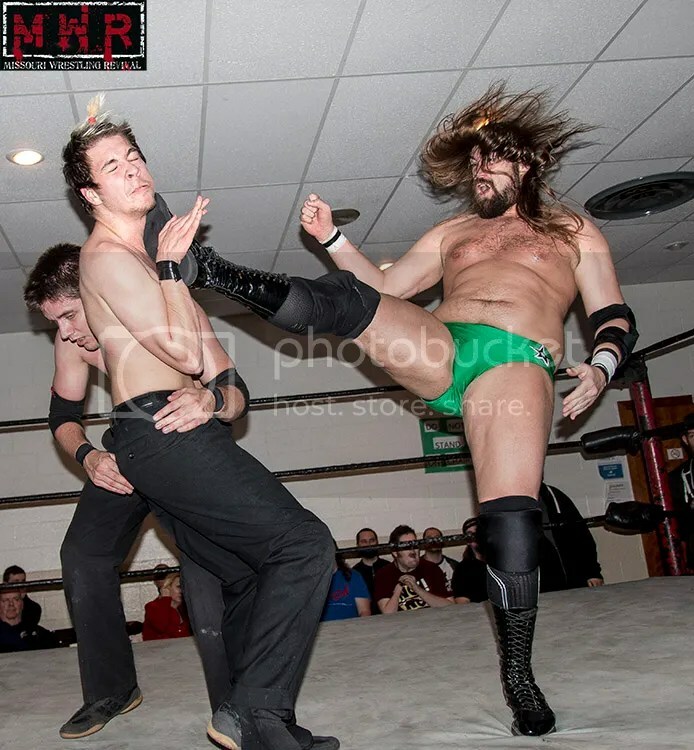 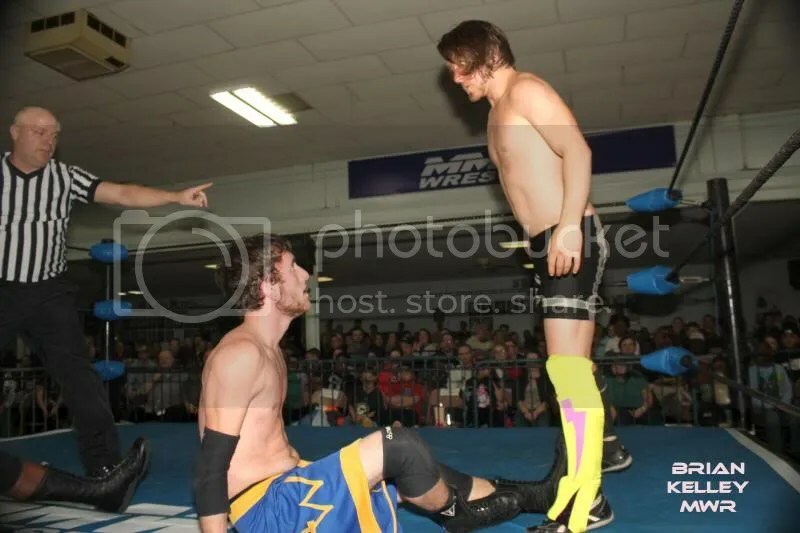 In the end it would be a vicious super kick from Aarons as Kennedy was on his knees that would send the Sexiest Wrestler of the year to the finals. 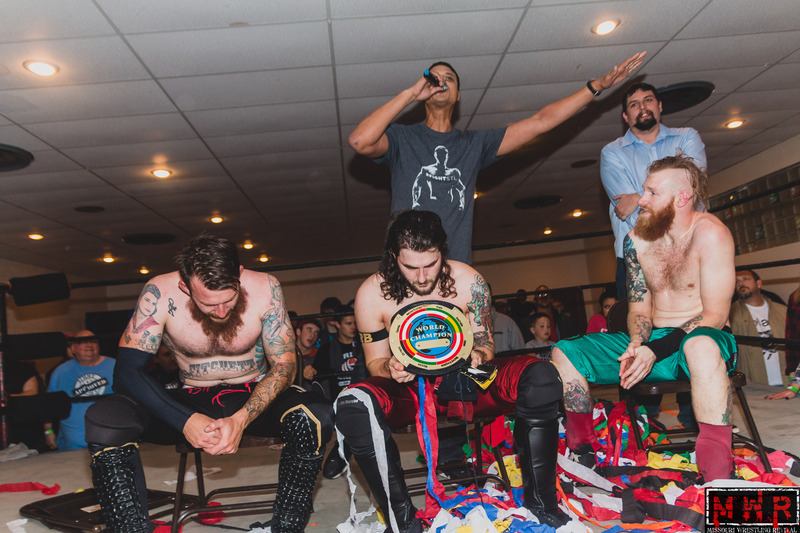 The final four way match would be an elimination style until one man was standing and thus would be named the new Pro Wrestling Epic Champion. 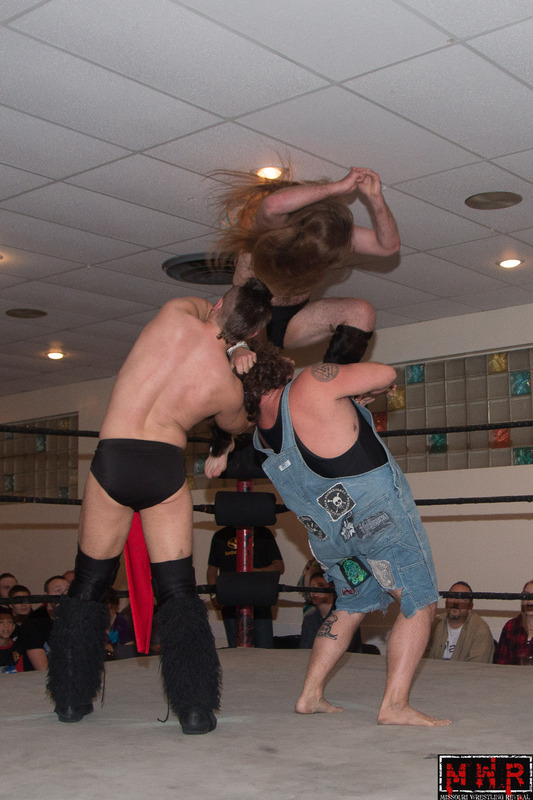 With a vengeance Mephisto attacked Aarrons as McNeil and Adams tore into each other. 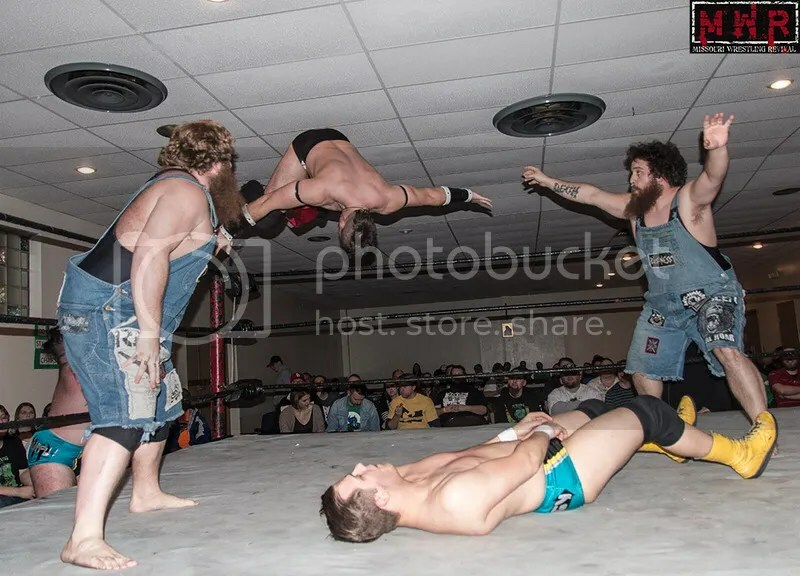 McNeil would soar early from the ring onto all 3 men on the outside to get the edge, but his night would be over just as quick when Adams used his feet for leverage on the ropes to illegally eliminate McNeil. 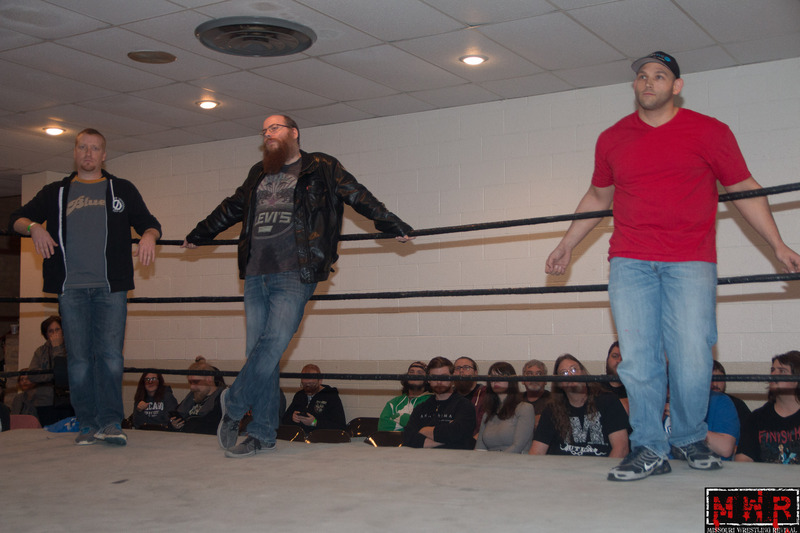 Aarons was in deep trouble as Mephisto and Aarons made a pact to take him out two on one. 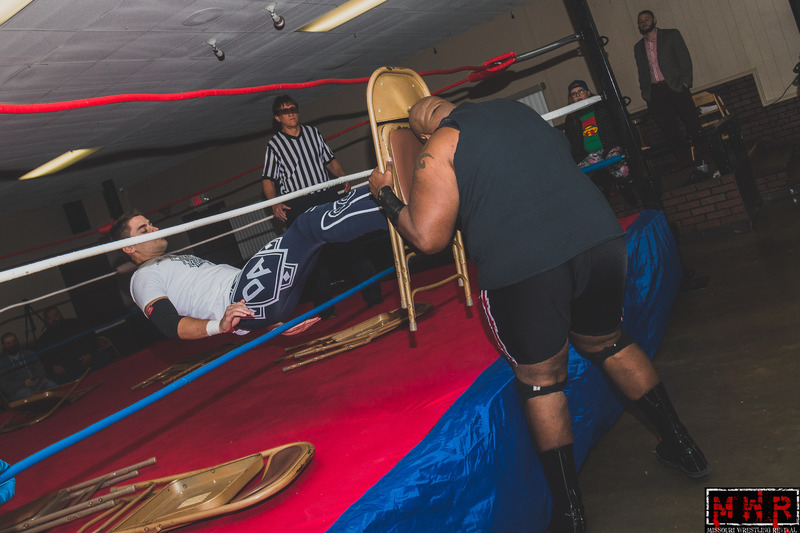 The two delivered heavy punishment in and out of the ring, including chair shots that left the star battered and bloodied. 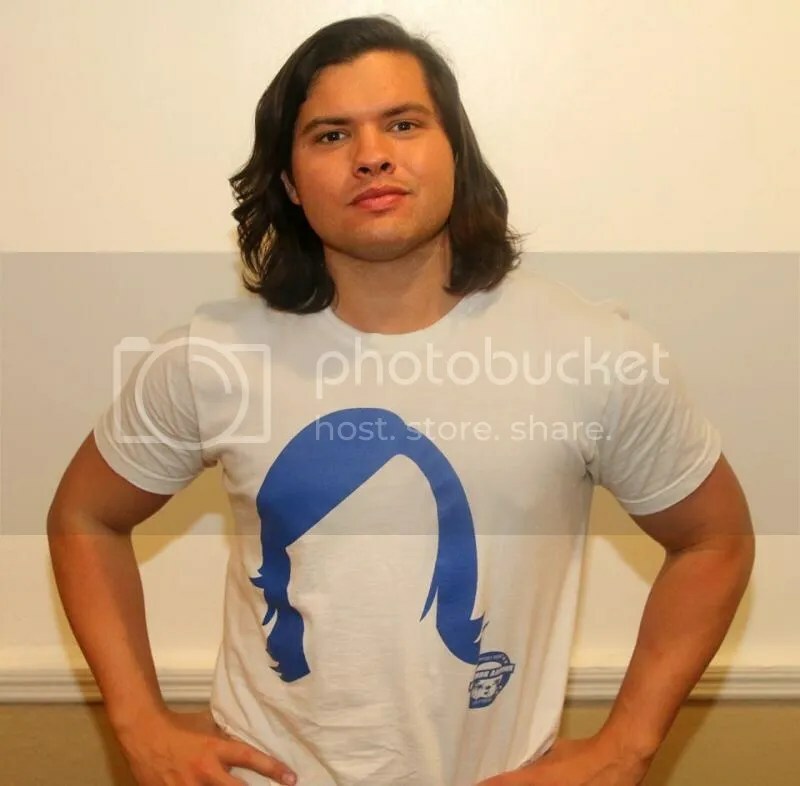 Yet, it would be Mephisto’s obsession that would leave an opening for Aarons to strike. 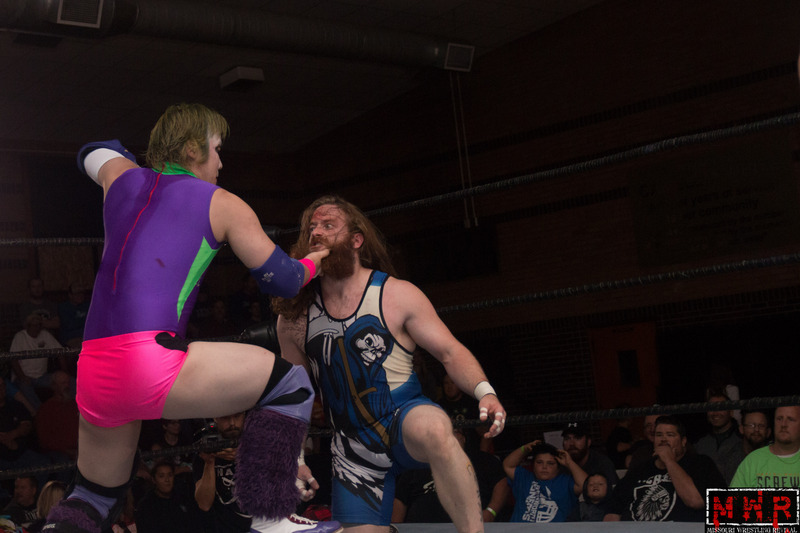 As Adams went to eliminate Aarons, Mephisto stopped Adams, yelling that he was the one that had to eliminate him. 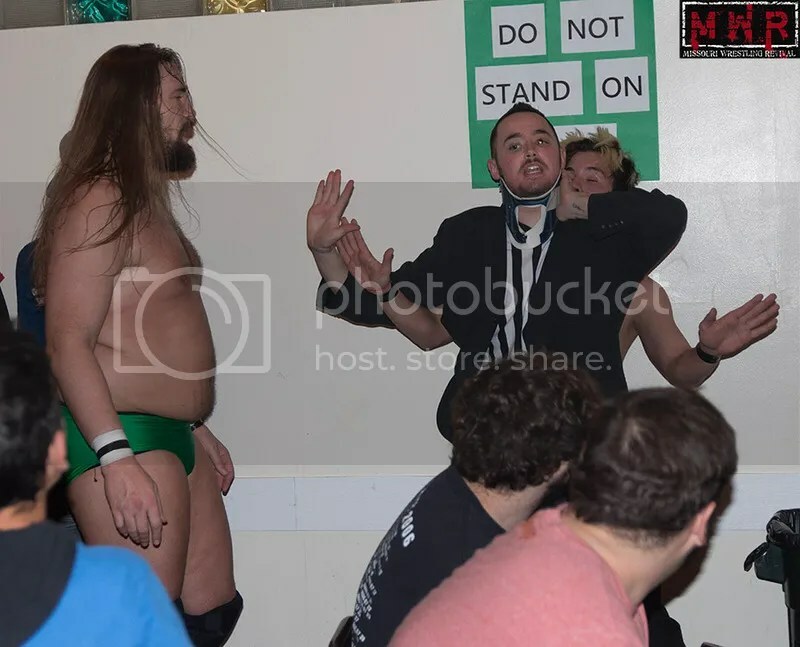 Adams was not happy about at all, and the friendship was over. 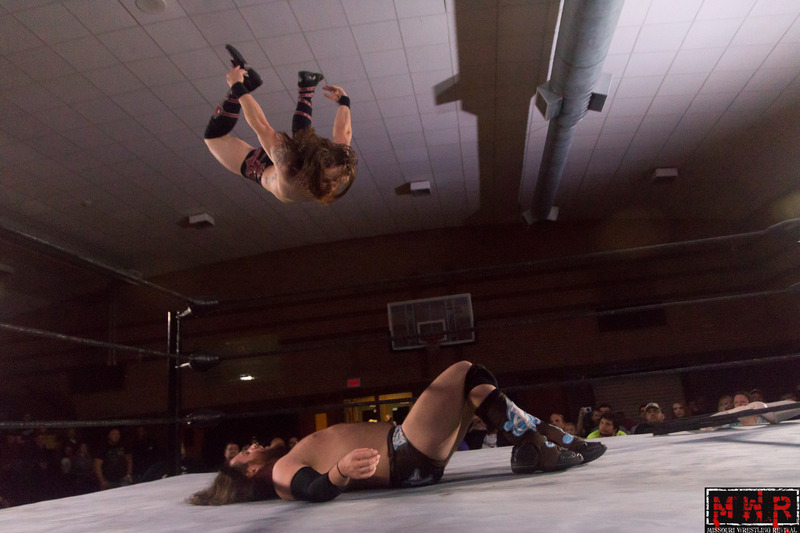 During the battle between Adams and Mephisto, Adams was able to get the edge once again only to have Aarons surprise him with a small package to end Adams quest for the PWE title. 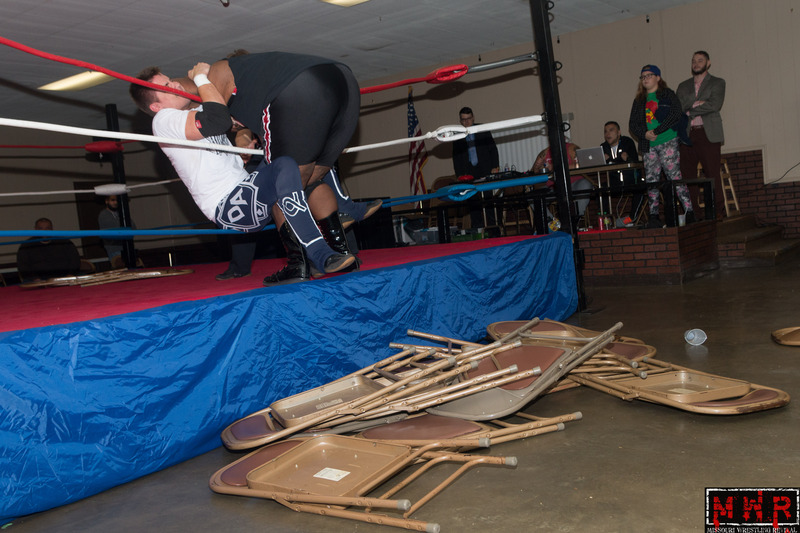 Once eliminated, Mephisto’s psychotic tendencies came into play as he slid Adams a chair and instructed him to finish Aarons off. 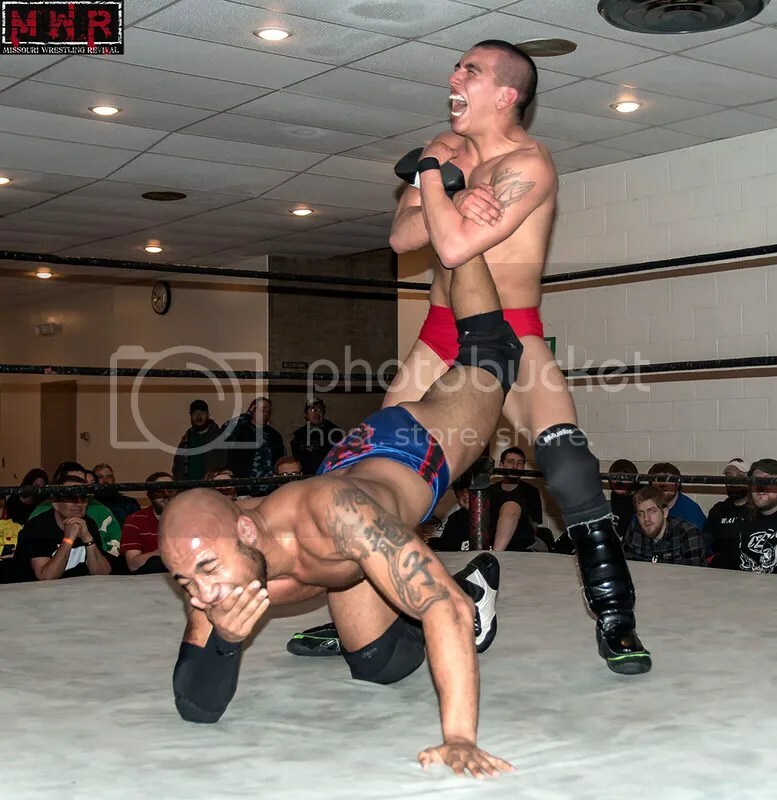 At first , it seemed as if Adams would decline the offer to administer the pain, but with Mephisto in his ear he snapped and began brutally beating a bloodied helpless Aarons as Mephisto looked on with a smile on his face. 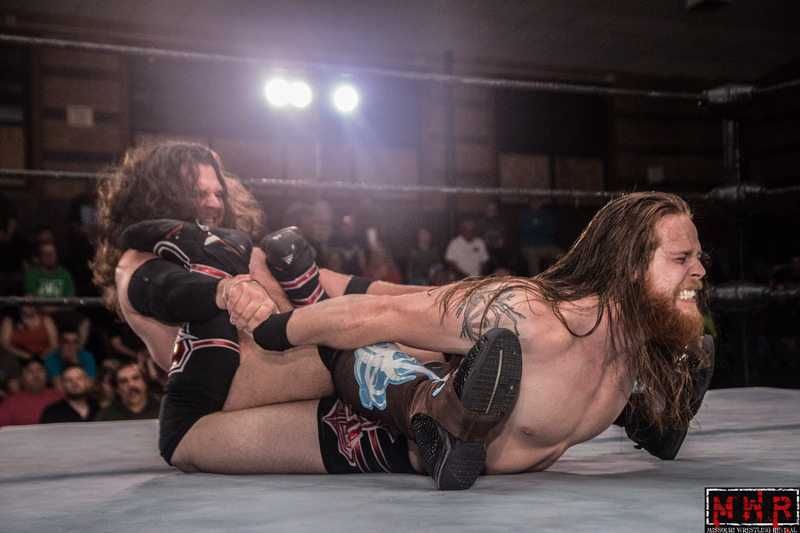 After Adams was finished with his assault, Mephisto went for what he was hoping be the final pin of the match, but Aarons wouldn’t give up. 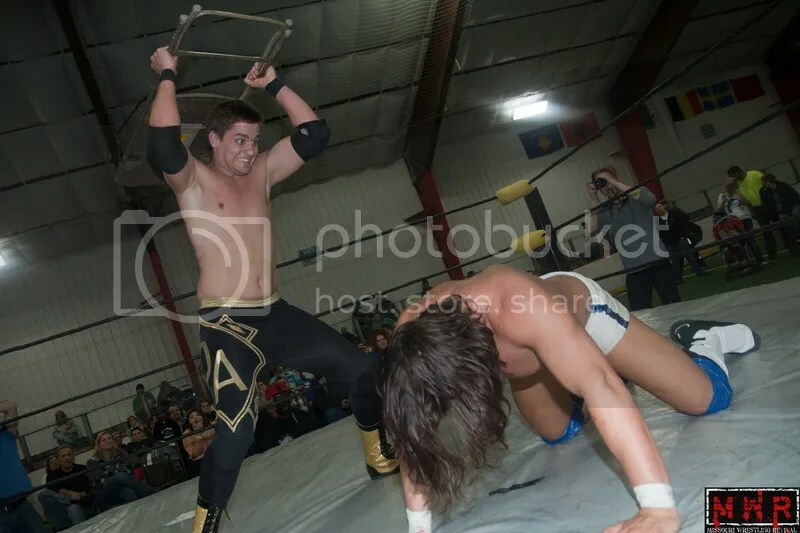 Mephisto did not miss a beat as he continued his brutality on Aarons as he drove him from the apron head first through chairs that had been set up early on during the match on the outside of the ring. 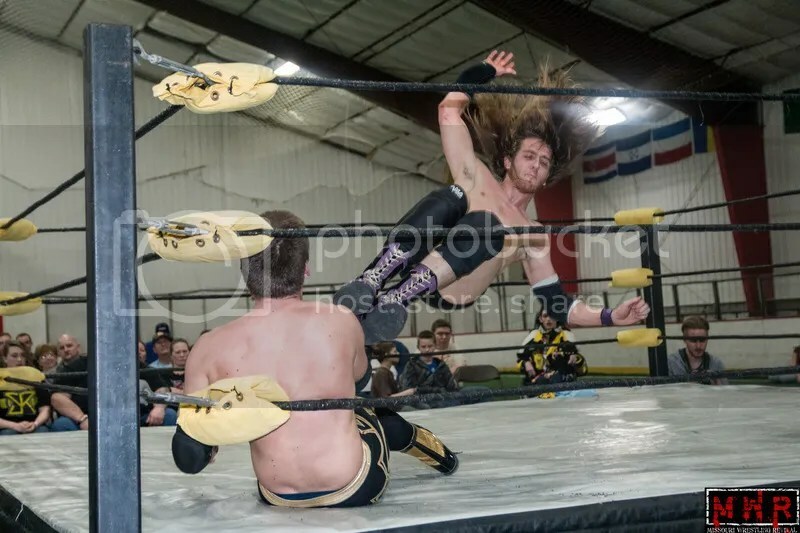 As the fans looked on shocked and in disbelief Mephisto drug Aarons lifeless body into the ring only to again see their hero refuse to give up kicking out after a long 2 count. 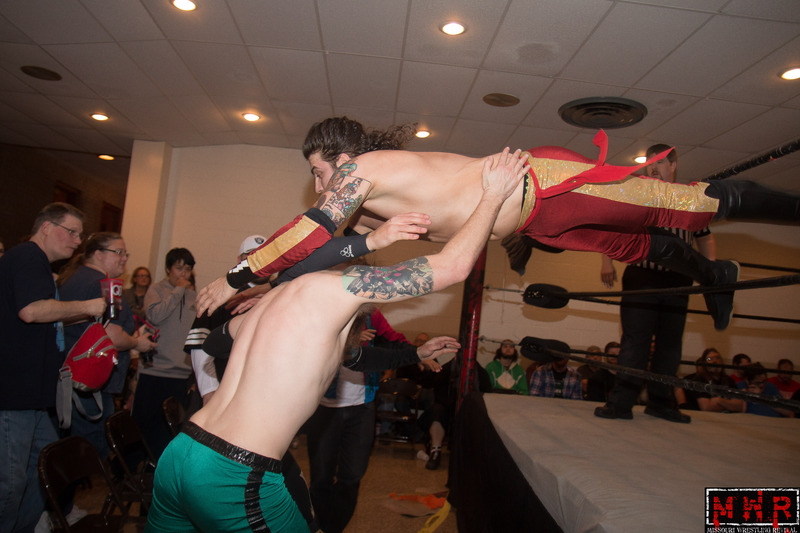 Mephisto full of rage and hate, now with Aarons blood smeared on his face, went to the top rope and attempted an aerial assault in the form of a moonsault. 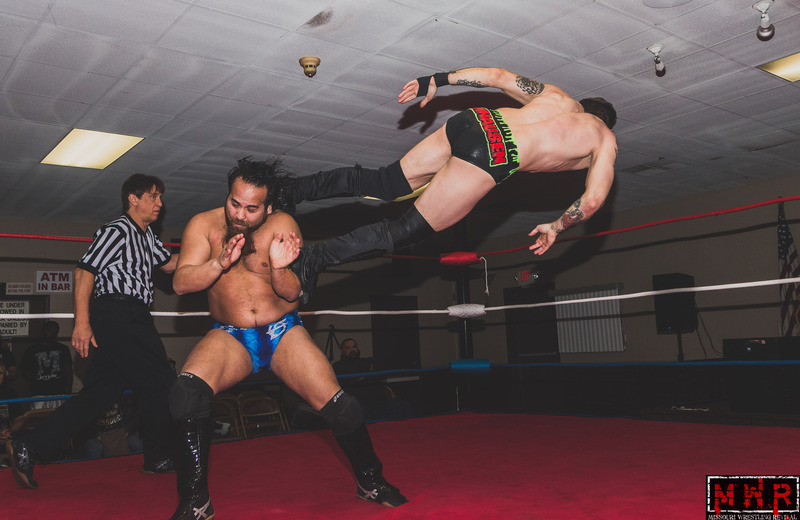 Aarons quick thinking ,even with a possible concussion, avoided the move hitting a short range Superkick as soon Mephisto came to his knees, this time however it was Mephisto who wouldn’t give up proving that he could take it just as much as he could dish it out. 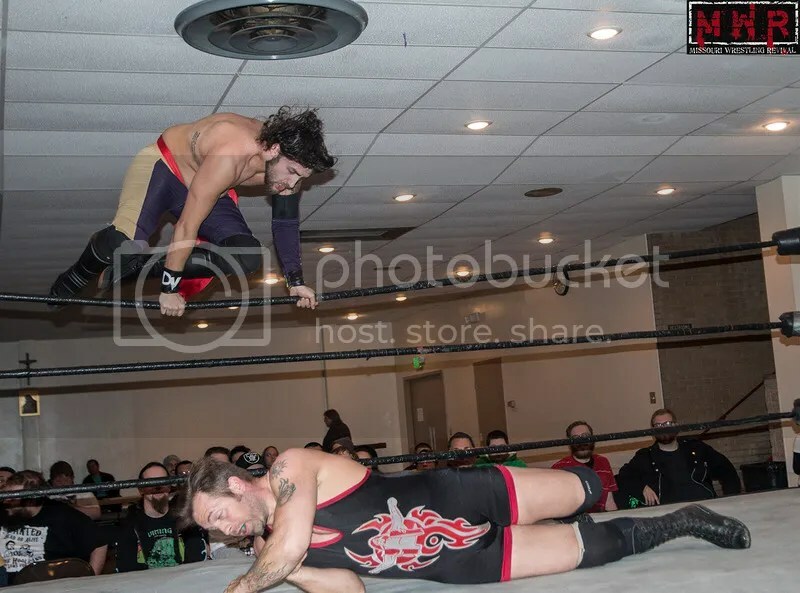 Aarons attempted to pick Mephisto to deliver a burning hammer for the win, only to receive a shot below the belt which nearly set up Mephisto to deliver the same move that defeated Everett Connors early in the night. 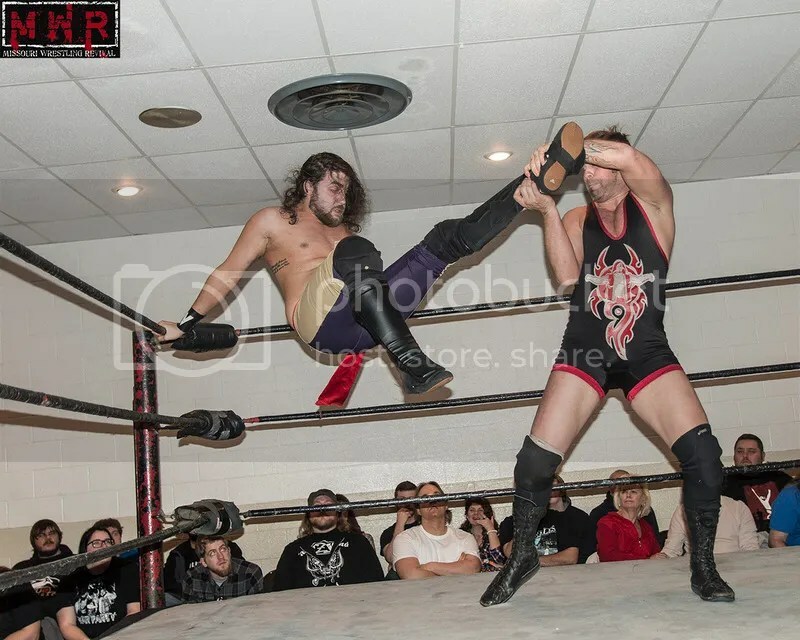 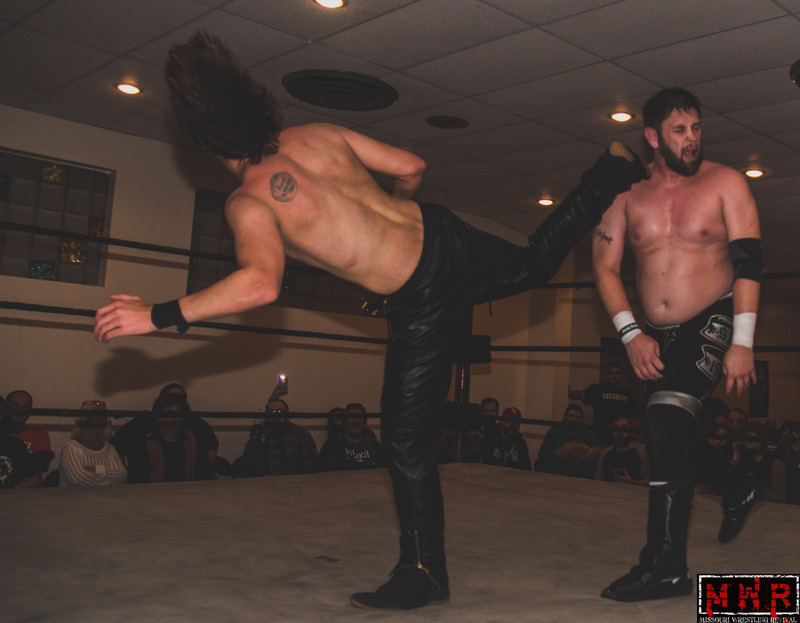 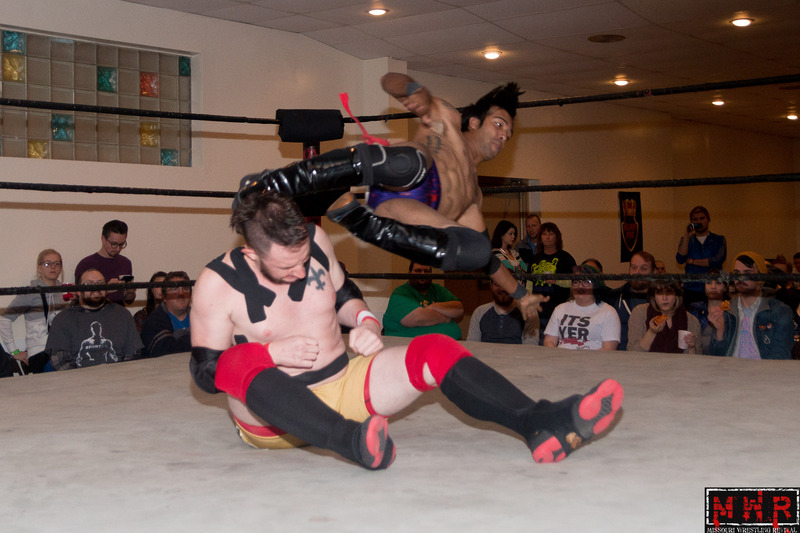 Aarons agility allowed him to avoid the move and rock Mephisto with one last Superkick sending him into the ropes. 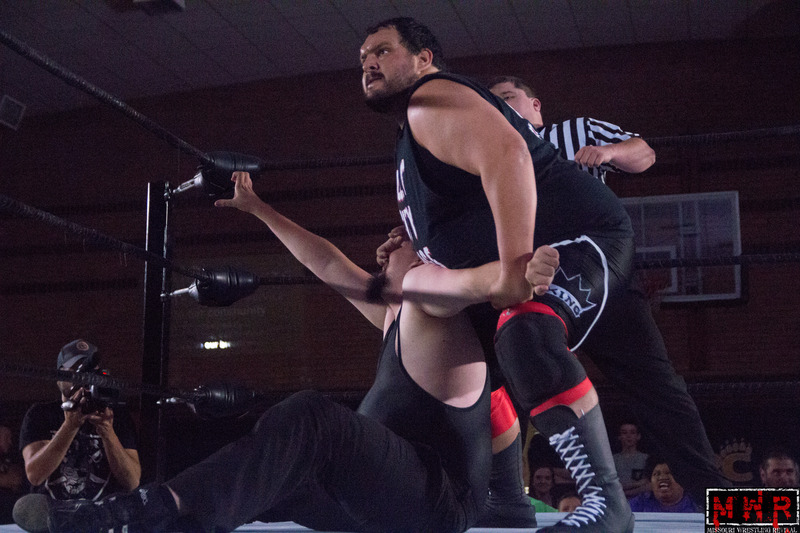 Though Mephisto was reeling he still struggled to latch onto Aarons to regain the advantage. 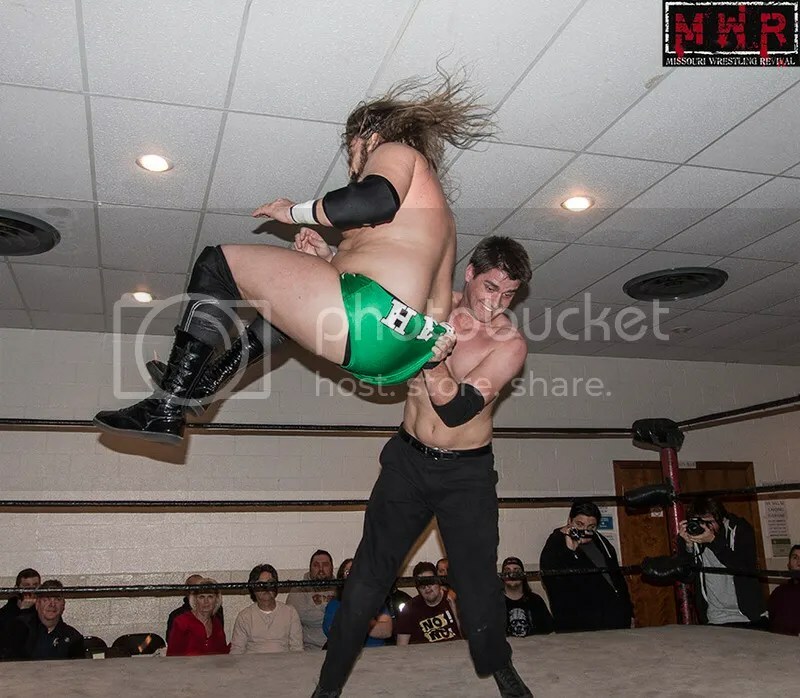 Yet, it would be Aarons who would counter by locking in a beautiful Cobra Clutch Style Suplex that finally allowed him to defeat the man who had been taunting him for months and secure Himself as the New PWE Champion! 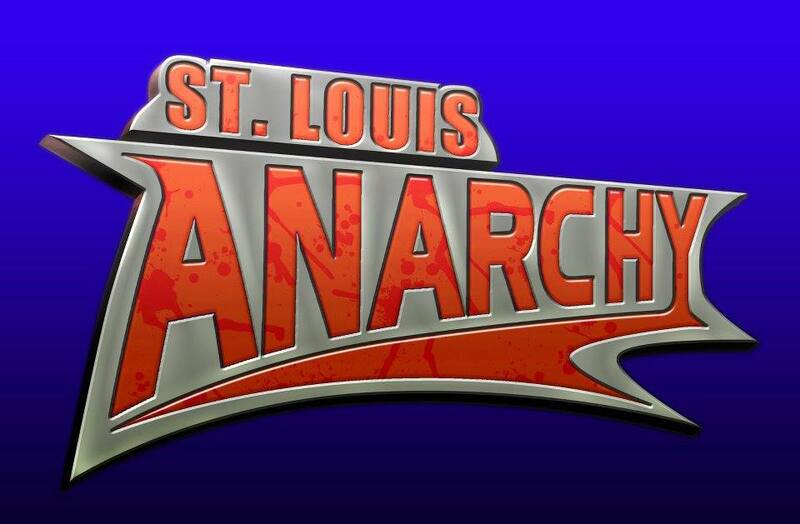 A new commissioner would be revealed. 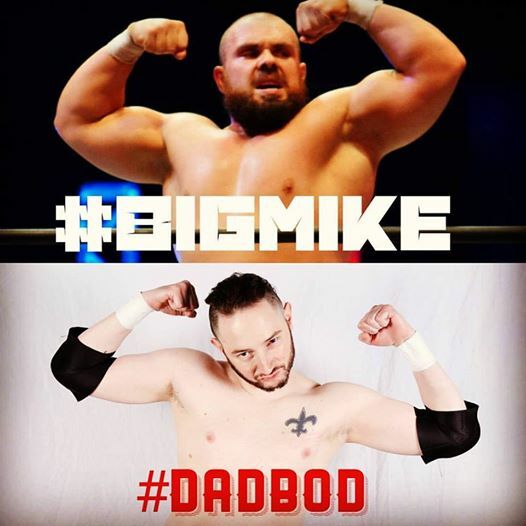 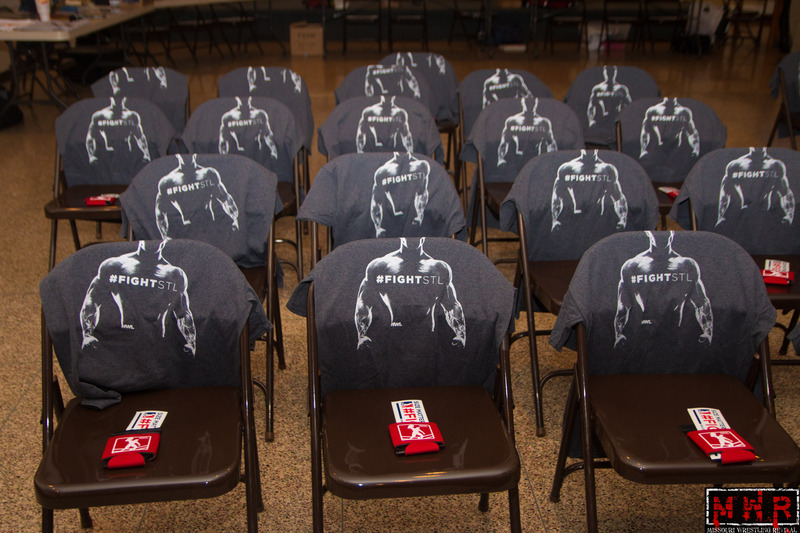 A massive newcomer would make his in-ring debut. 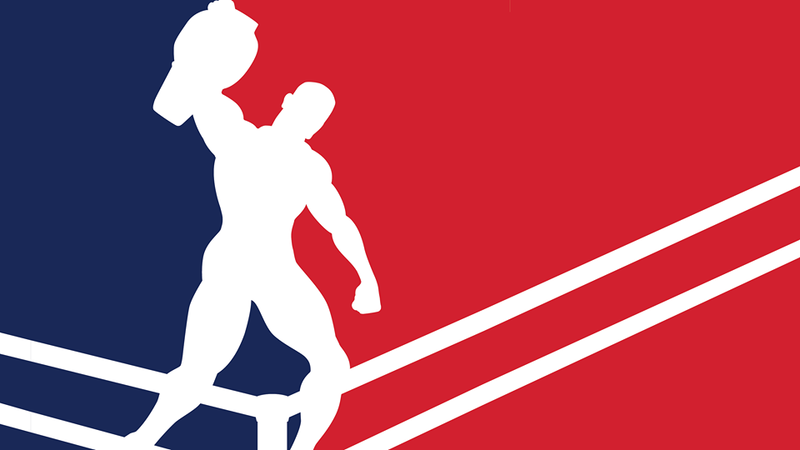 Several championships would be defended. 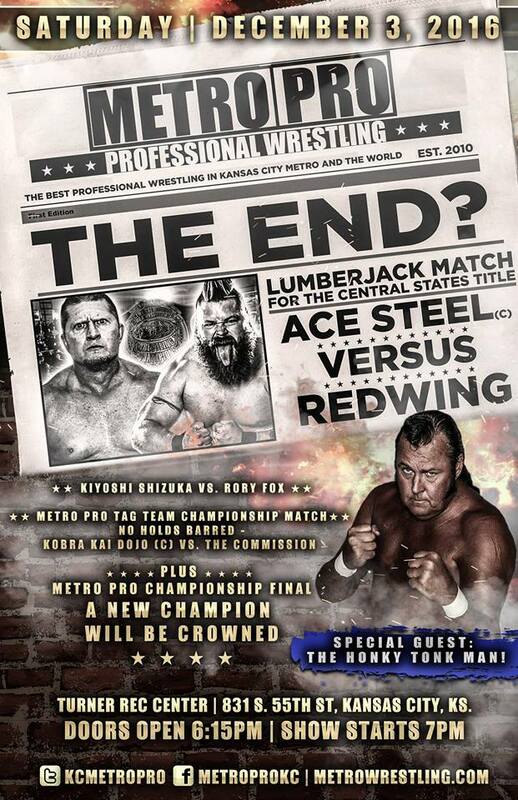 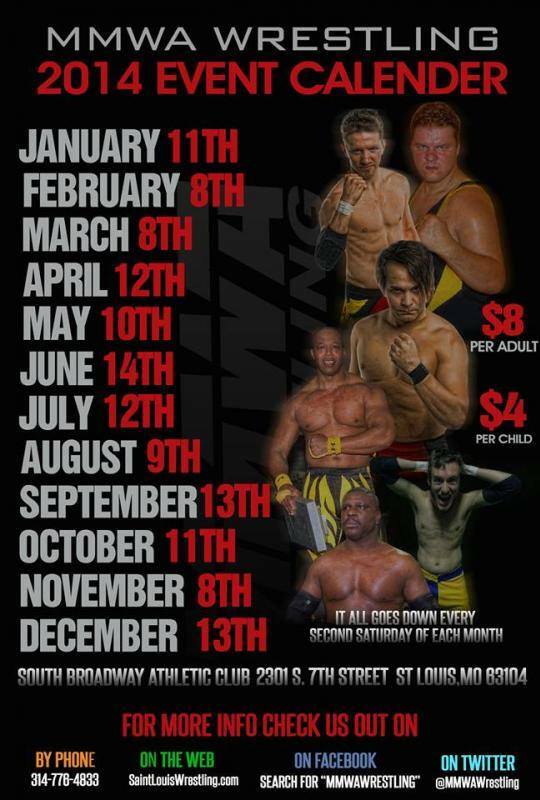 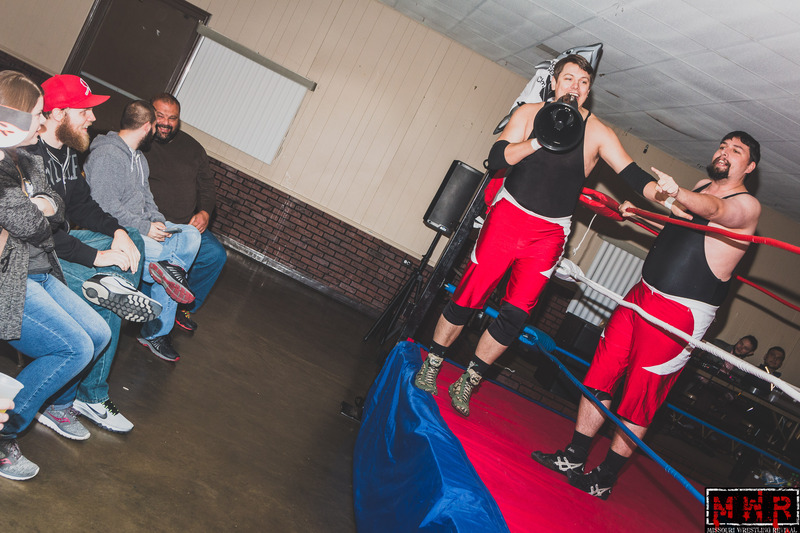 Those were the stories going into the first show of 2014 for the Mid-Missouri Wrestling Alliance. 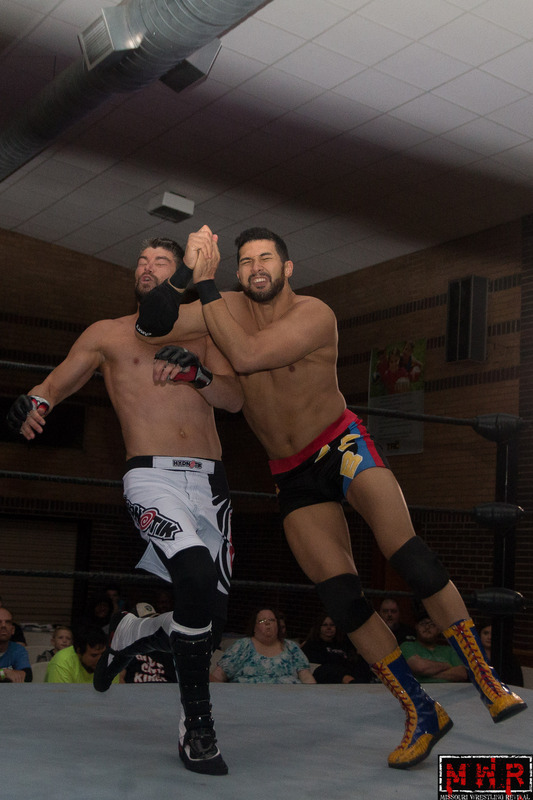 Brandon Espinosa and Lynn Mephisto continued their habit of kicking off the show. 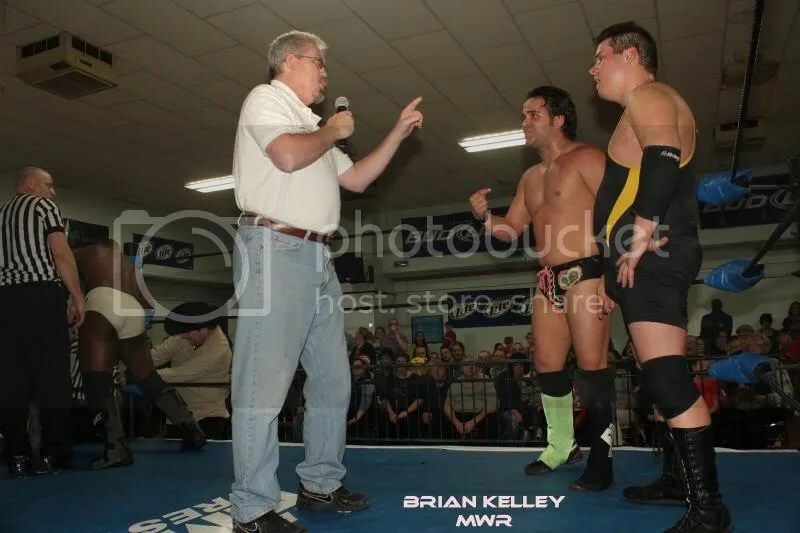 As the two ran their mouths in the usual fashion, they took the time to hurl insults at former senior official Jim Harris in the audience. 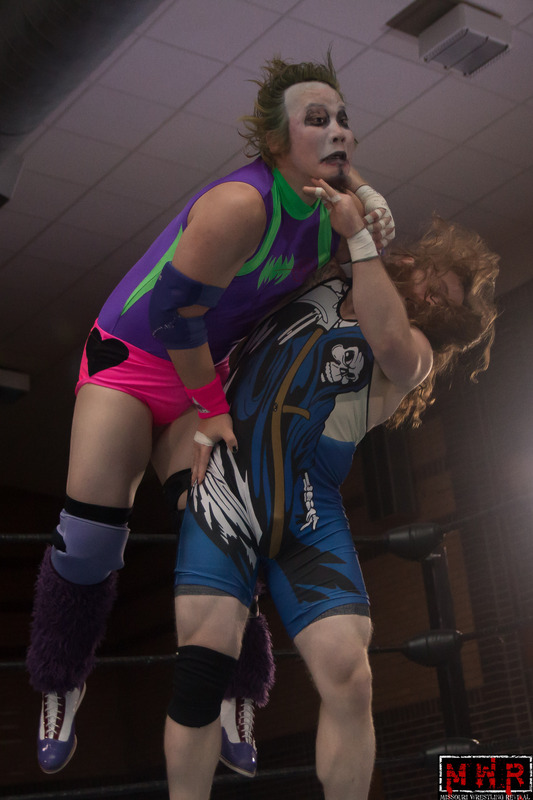 They were no strangers to the retired referee as Mephisto had manhandled Harris at previous shows. 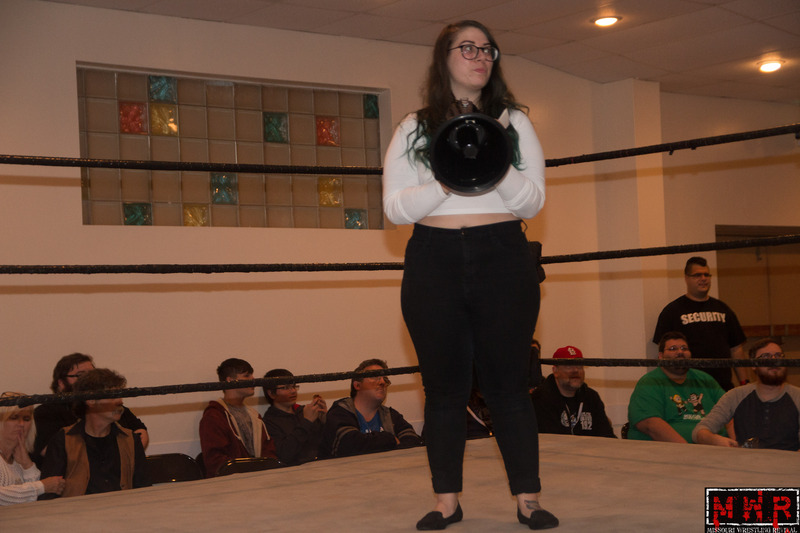 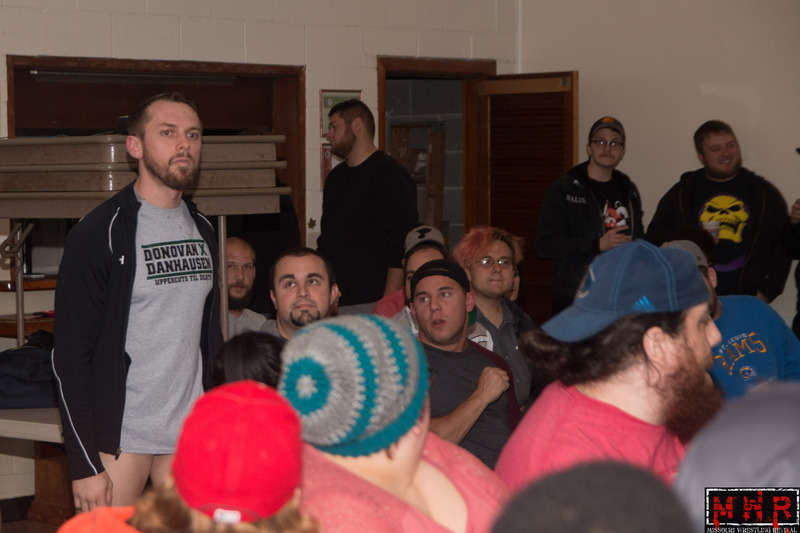 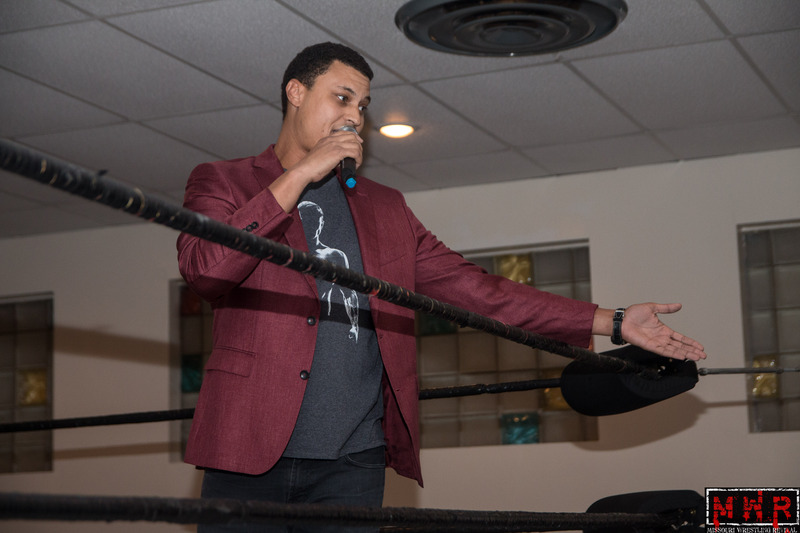 At that moment, ring announcer Ben Simon got a text message from the as-yet-unrevealed new commissioner…the two would have to participate in the night’s battle royal as well as their scheduled tag match. 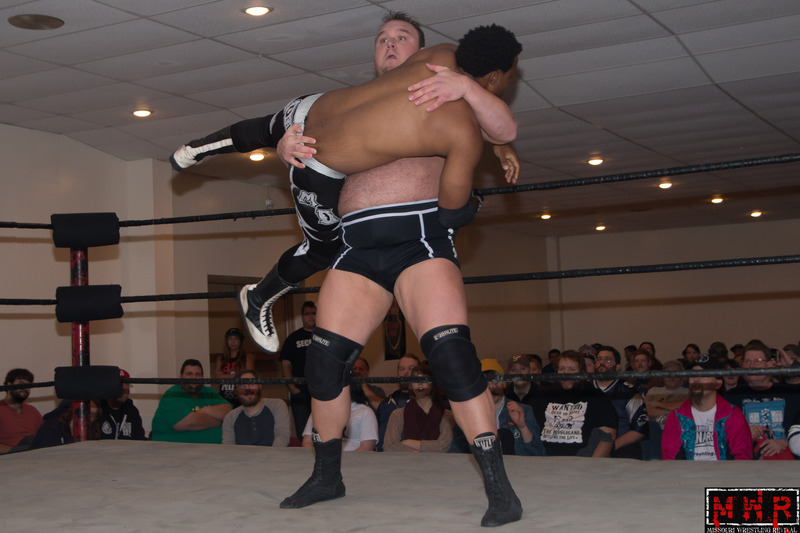 Da’Marius Jones had a rough night ahead of him as he was the first opponent for the huge Barackus. 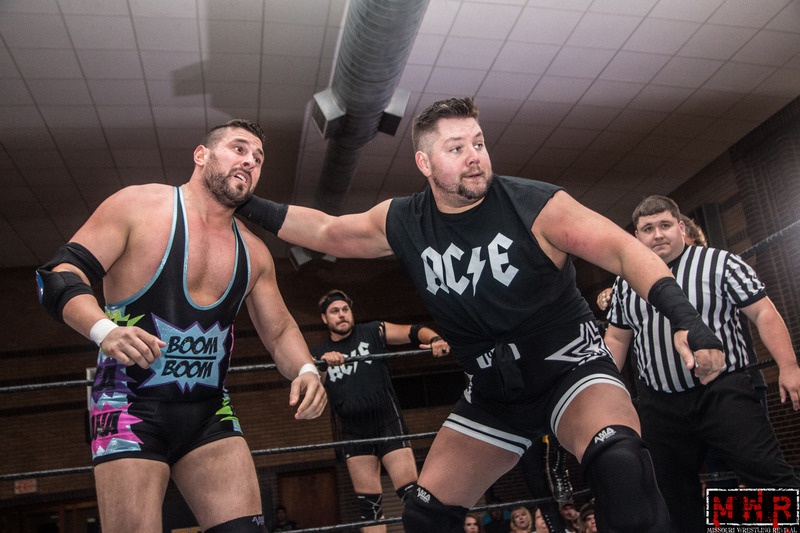 The super heavyweight had made his first appearance at the December show by costing Dave Osborne his shot at then-champion Espinosa. 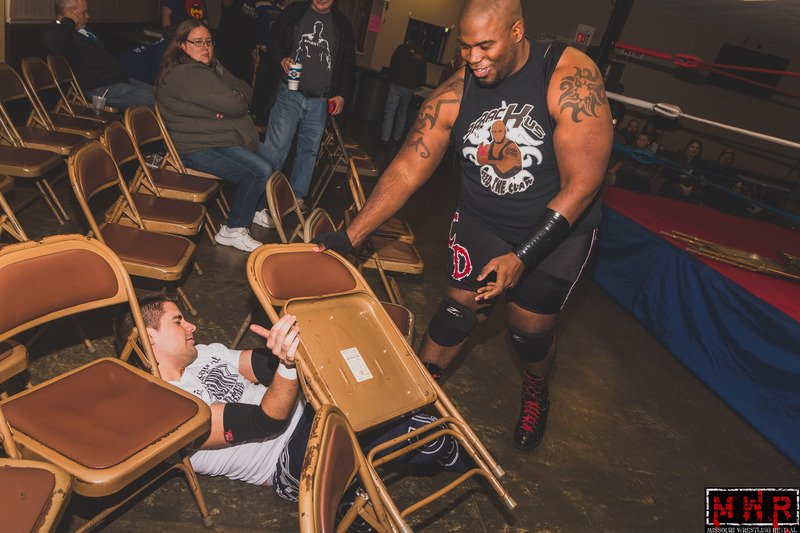 Jones gave it his best shot but couldn’t overcome the size disadvantage…Barackus dropped him with a clawhold Flatliner and the referee stopped the match, awarding it to the big man by way of a knockout. 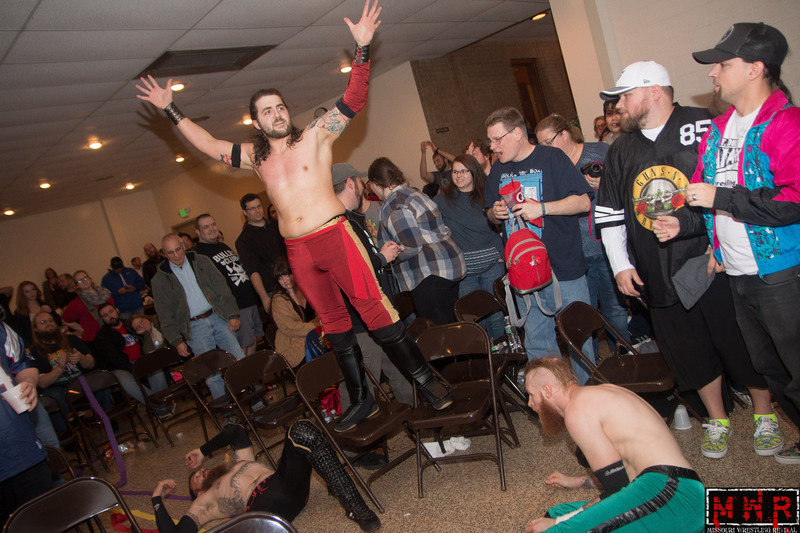 Mephisto had an opportunity to regain the Battle Royal Title he lost in December…and earn a shot at Television Champion Jimmy D in the process. 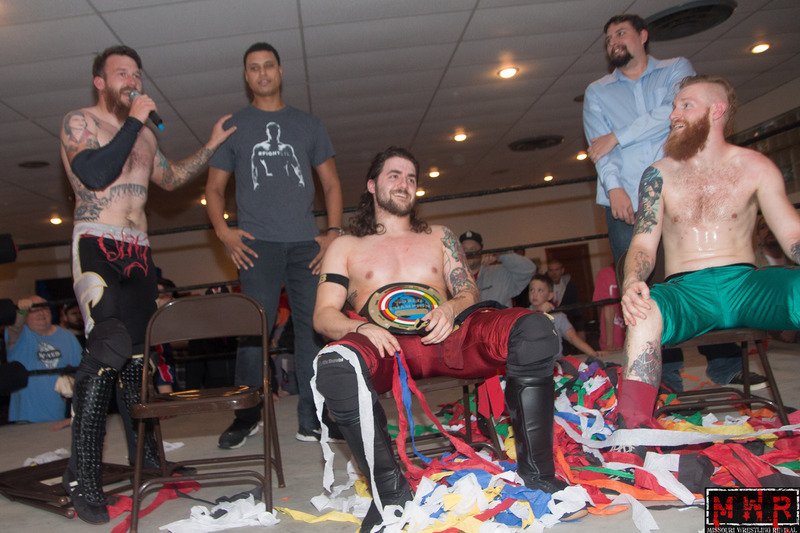 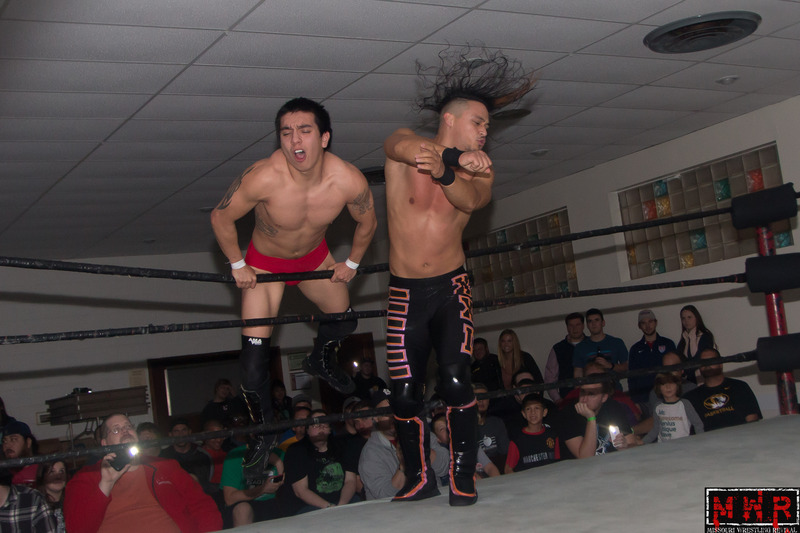 However, five other men had the same goal, including defending Battle Royal Champion Stevie K and Mephisto’s own partner Espinosa. 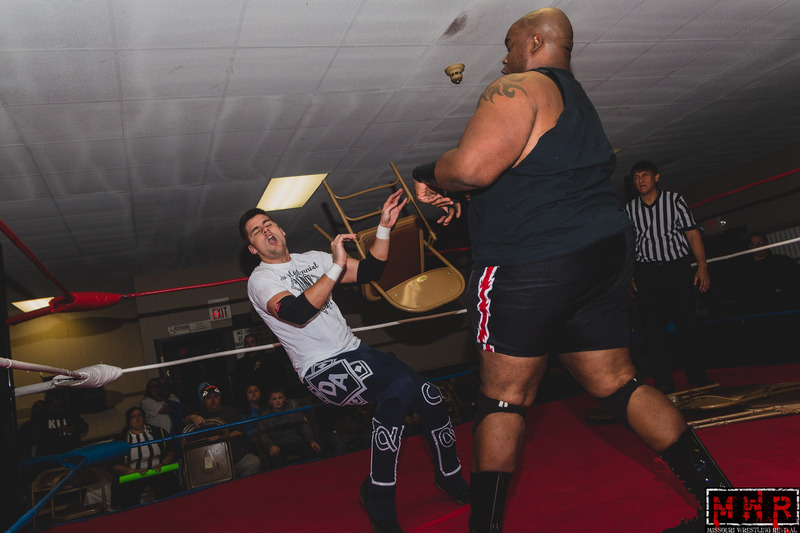 This time around, Gary Jackson would not be an outside factor…The Webmaster earned the victory with no questions asked. 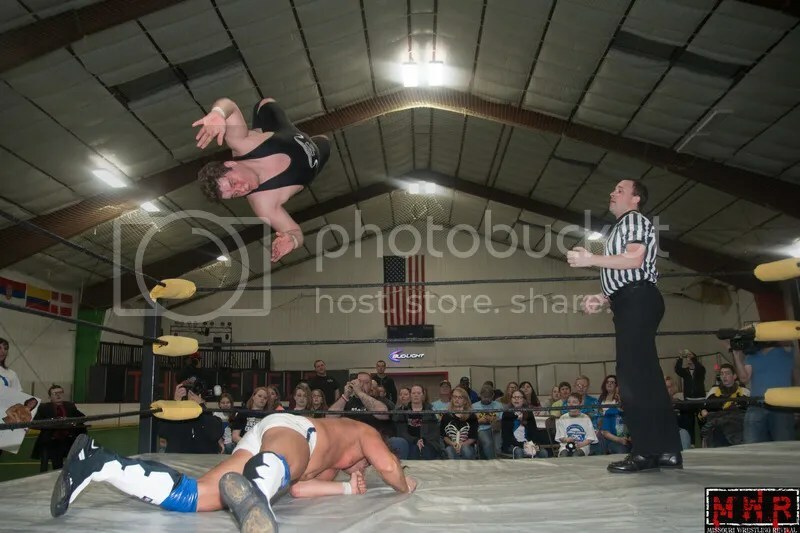 He took advantage of several instances of miscommunication to eliminate both Mephisto and Espinosa, retaining his title and moving on to a shot at Jimmy D.
With his manager Sean Orleans absent due to a suspension, Jackson Whitechapel had to fly solo against his recent rival Moondog Rover. 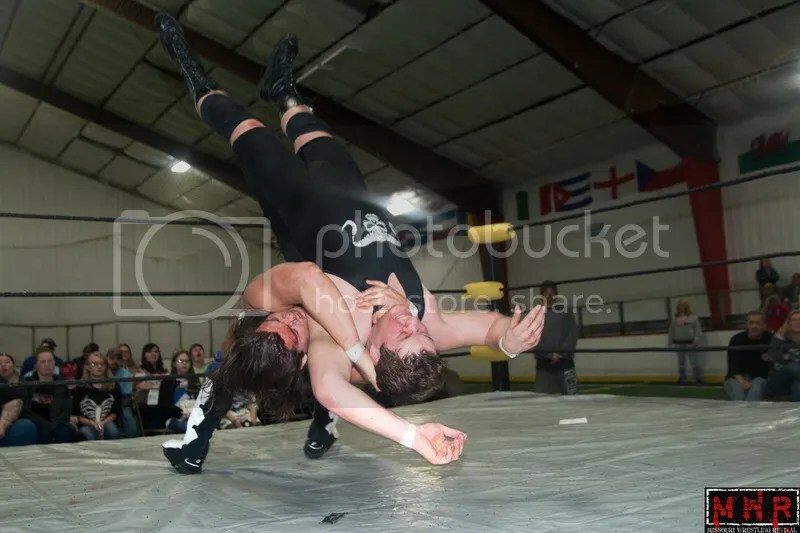 The lack of focus on Whitechapel’s part may have been his undoing as the fan favorite cruised to victory, getting the pin after a huge spinebuster. 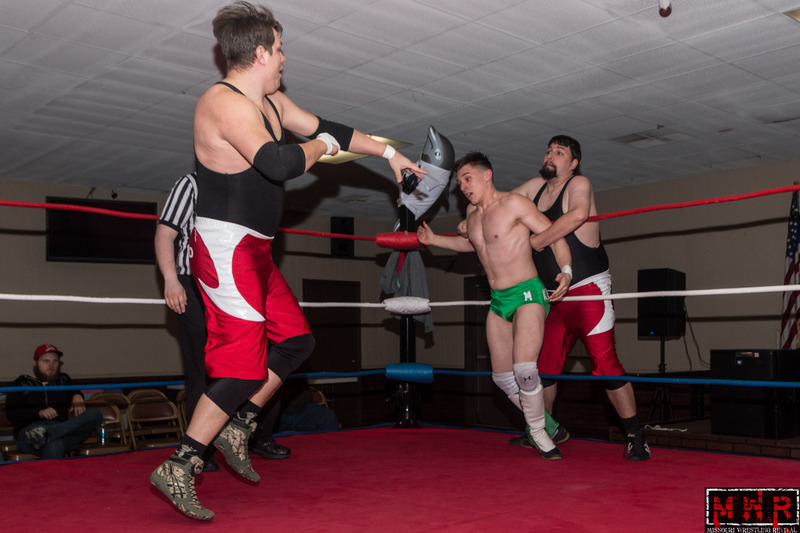 Junior Heavyweight Champion had been dealing with challenges from Ace Hawkins for several months. 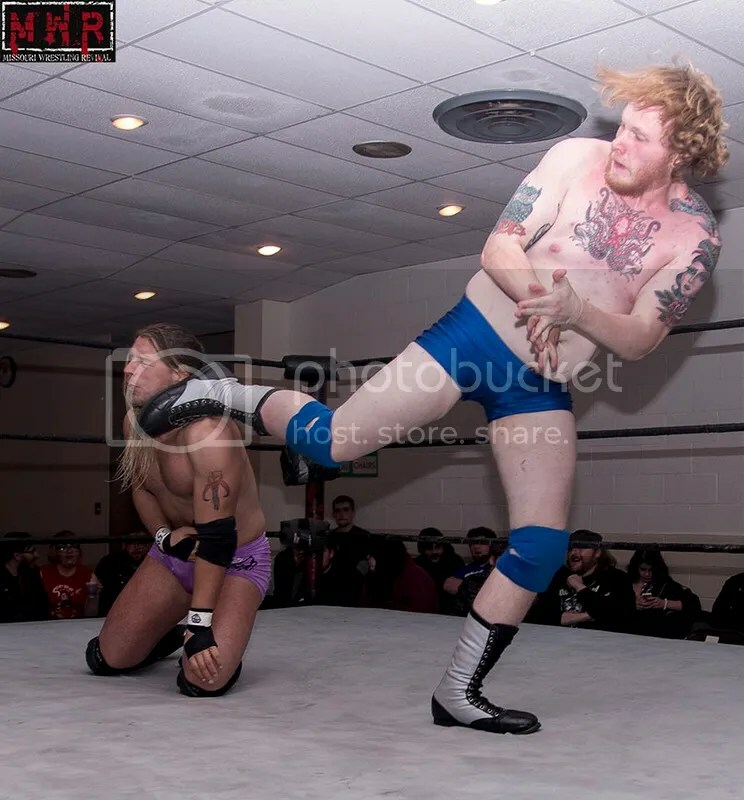 He scored a tainted victory over Ace in October, then lost to him in a non-title King Of St. Louis Cable Tournament bout in November. 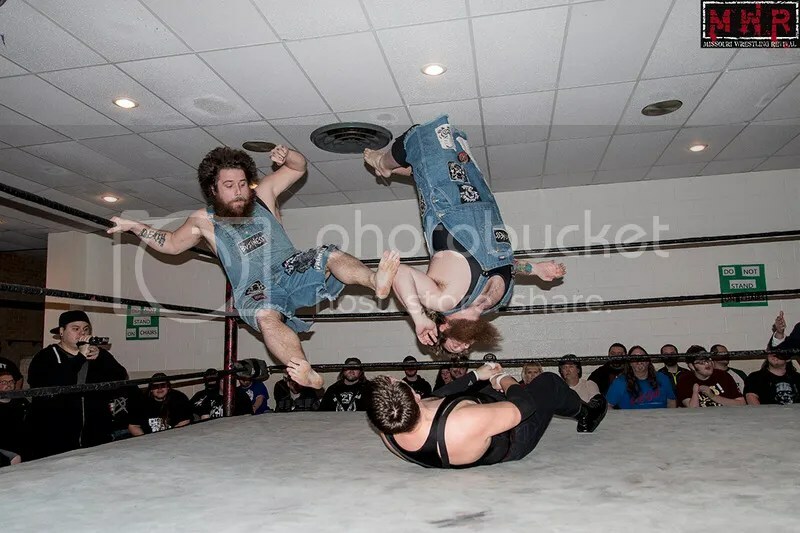 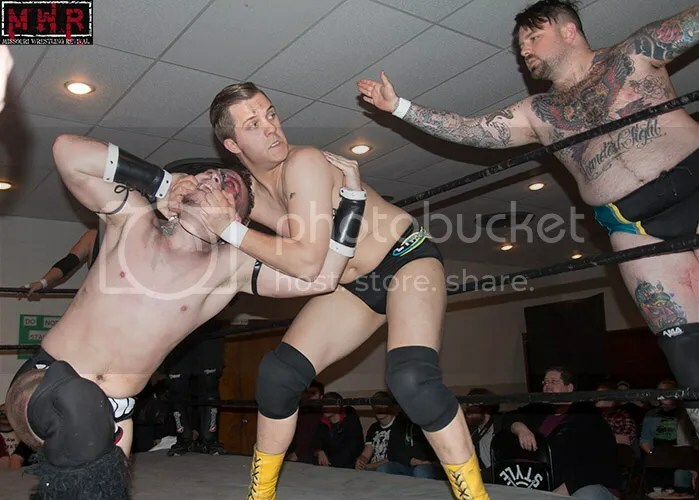 Wilder battled Hawkins and Da’Marius Jones in a triple threat matchup in December; the opportunistic “Wolf” got a cheap pin on Jones, but Ace remained in contention. 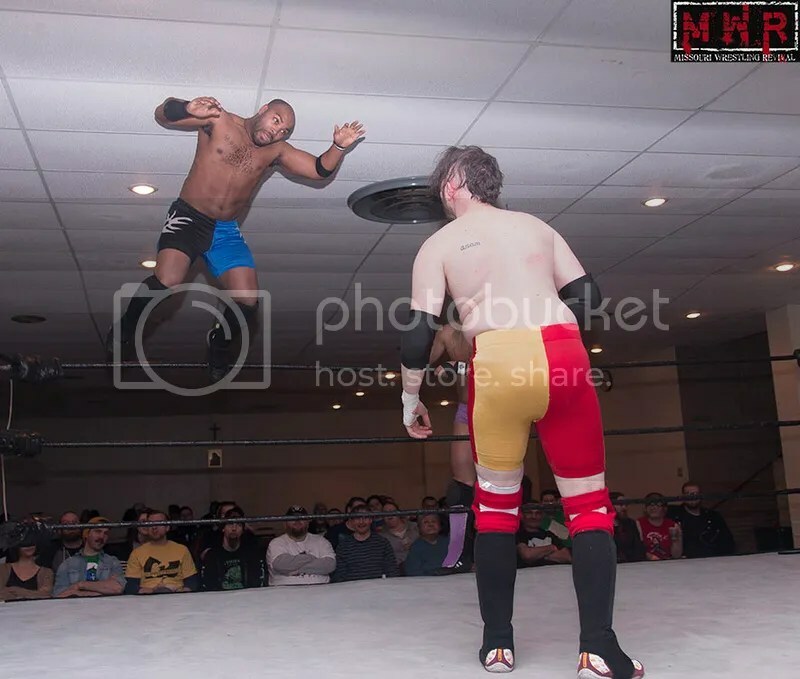 Hawkins teamed with J-Mal Swagg against the unusual team of Wilder and Flaming Freddie Fury. 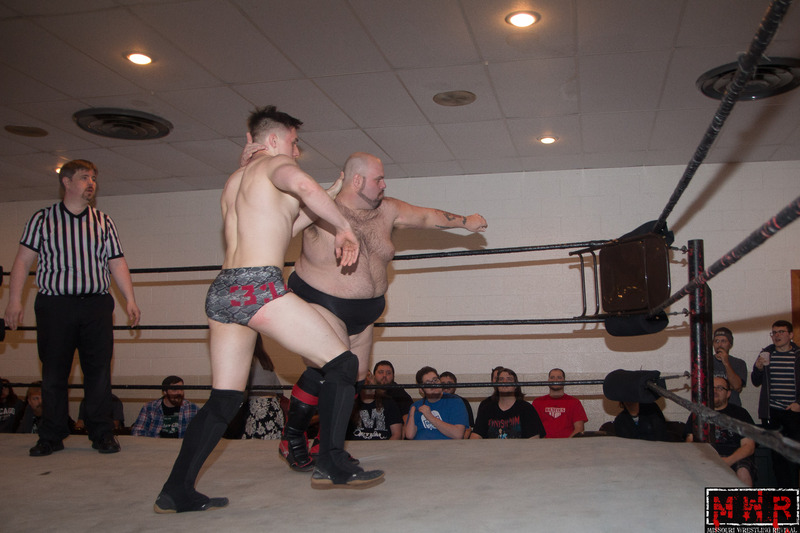 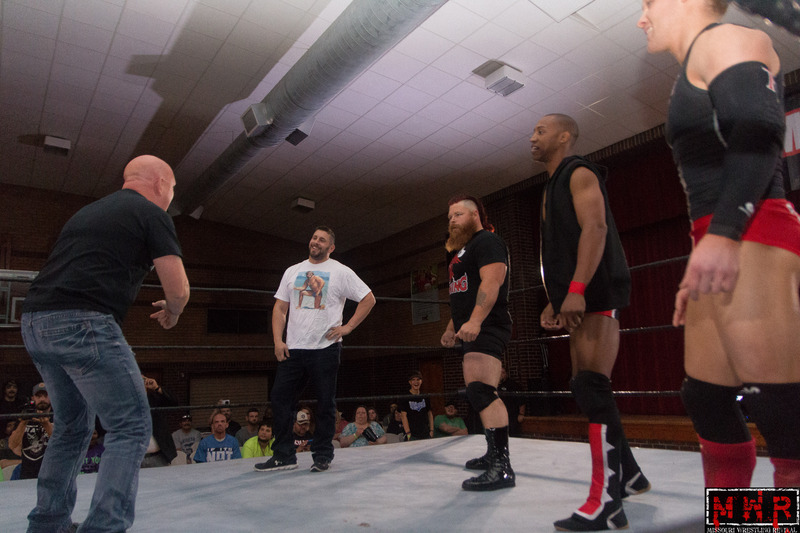 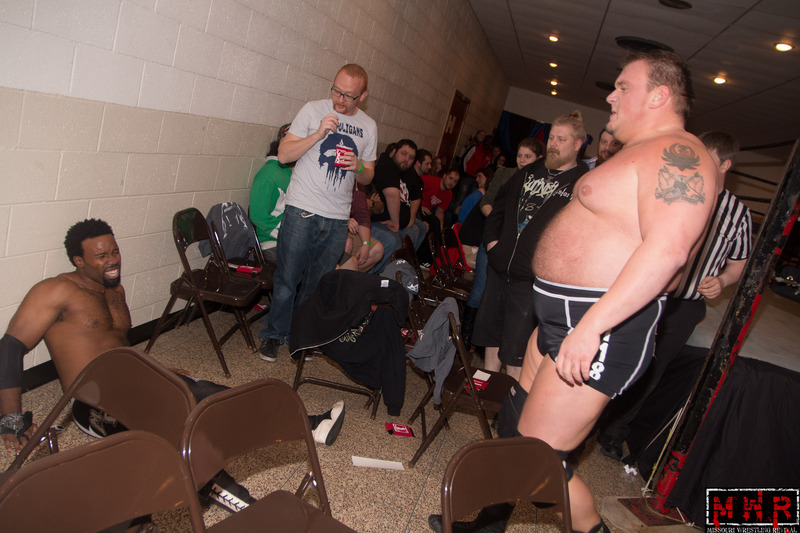 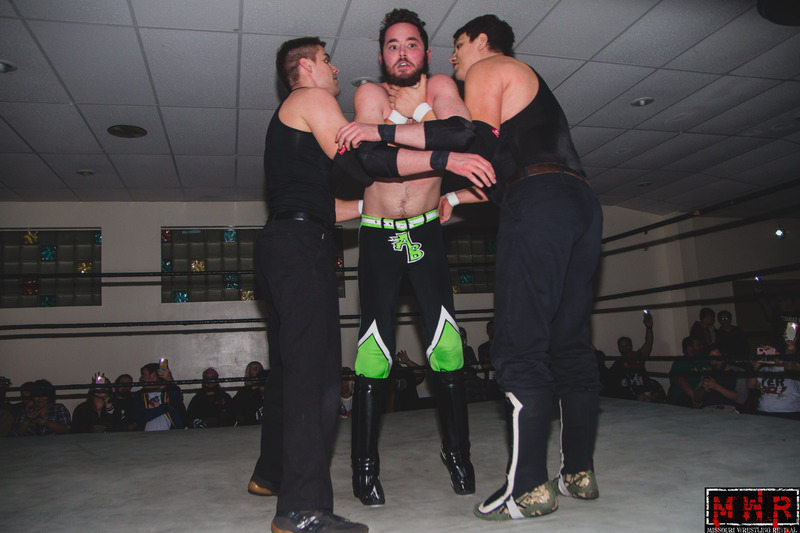 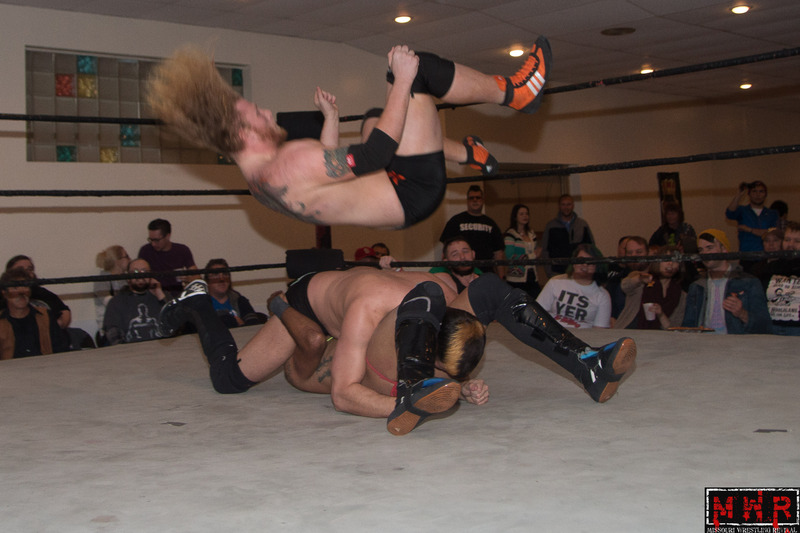 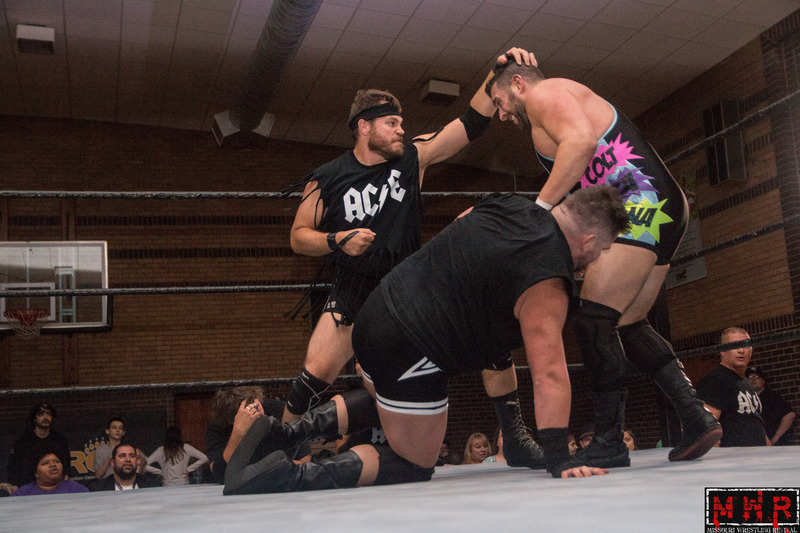 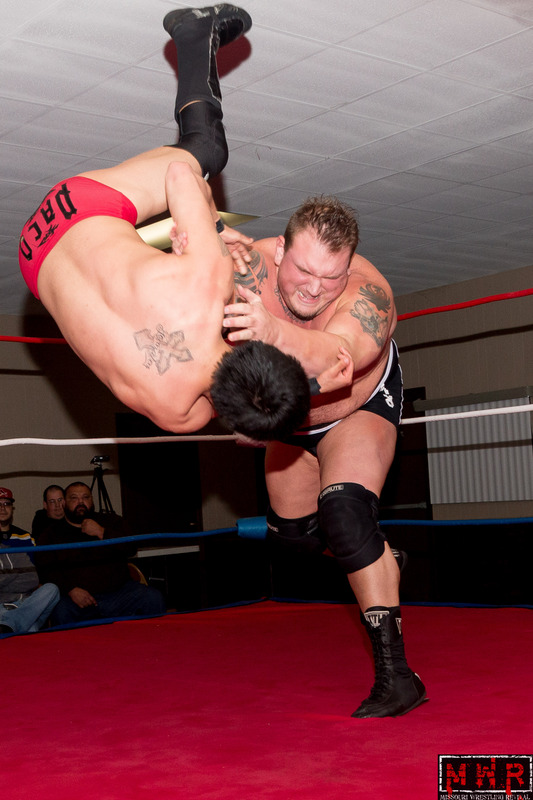 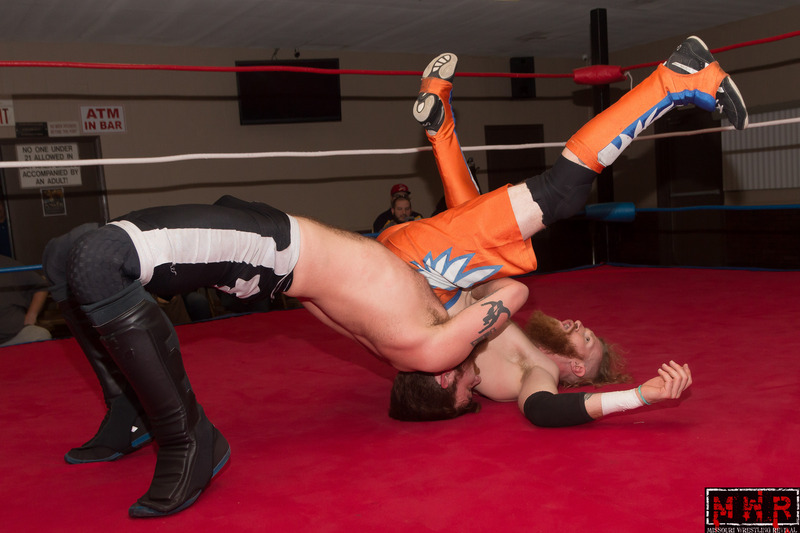 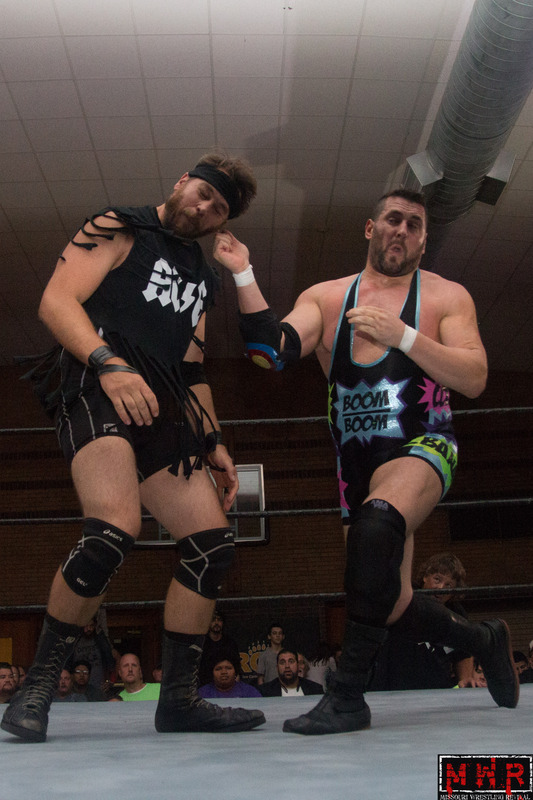 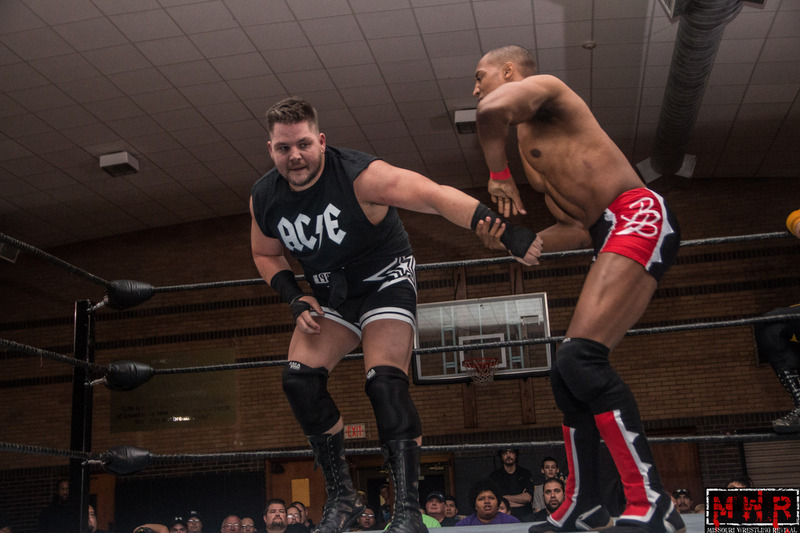 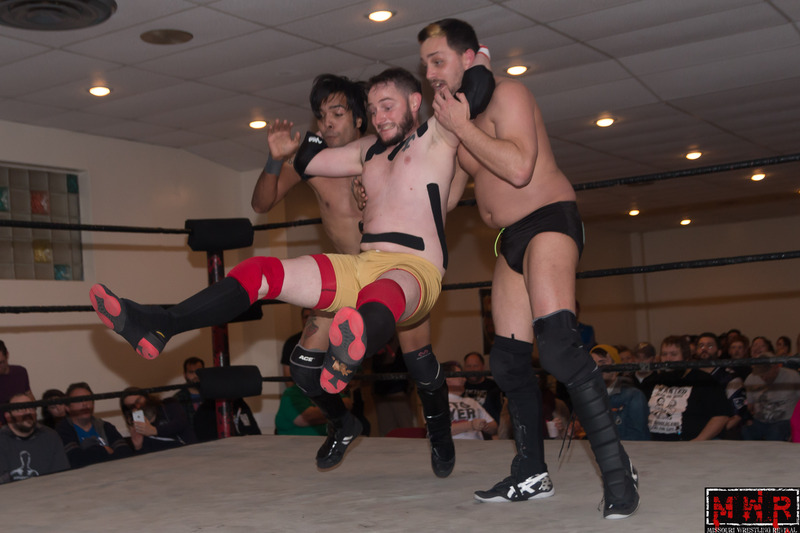 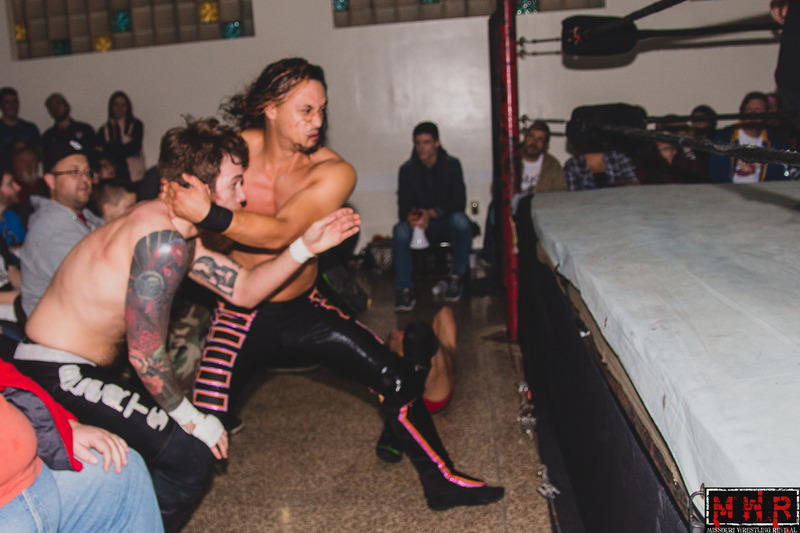 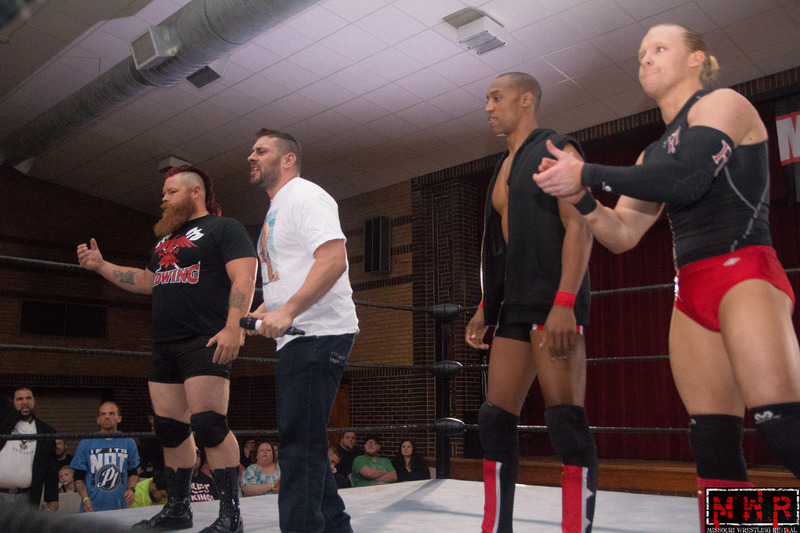 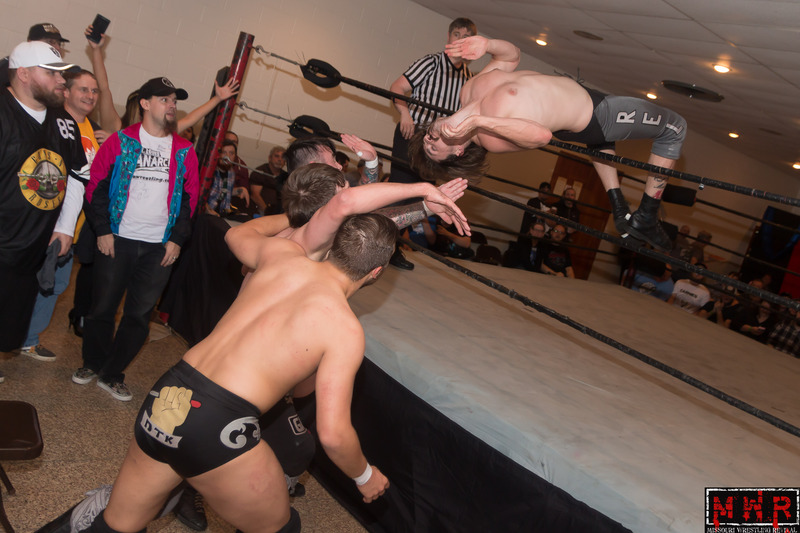 The bout started fast as all four men brawled, not giving Ben Simon the opportunity to announce the match stipulation. 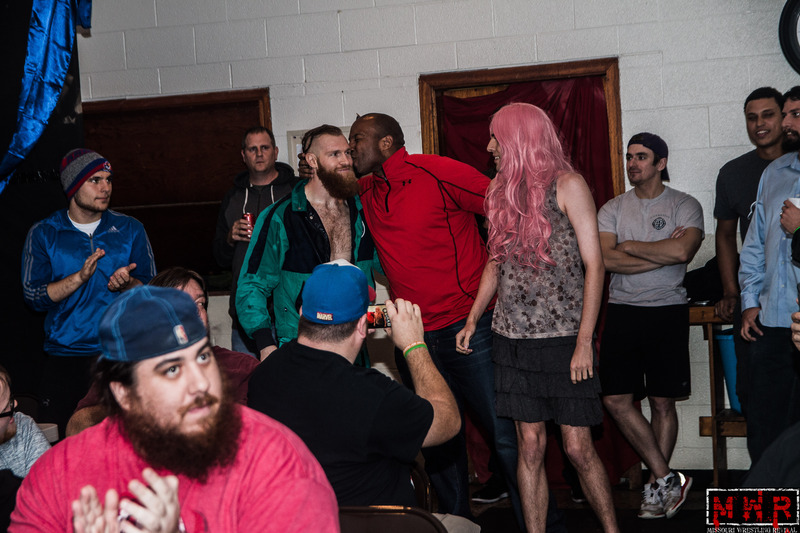 In the end, Wilder resorted to a low blow on Hawkins and got disqualified…he may have escaped from a worse beating on that night, but cost himself a different opportunity. 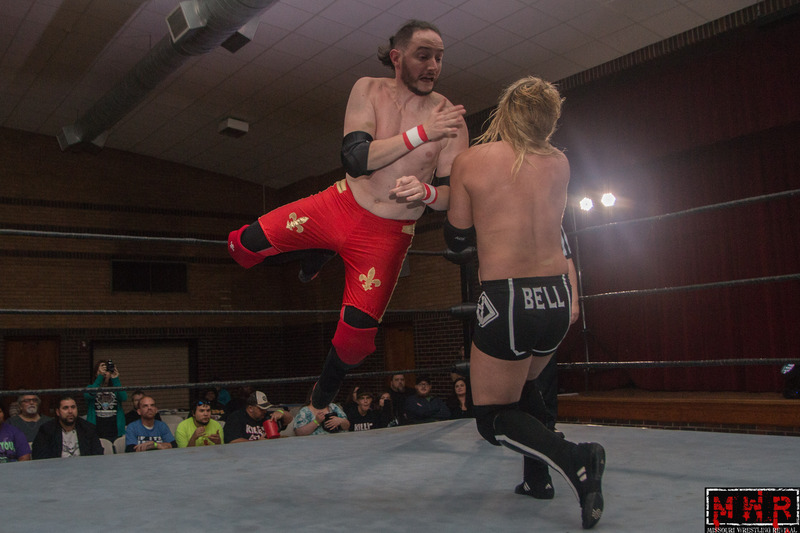 As Ben announced after the bell, the winners of the match would name the stipulation for February’s Wilder-Hawkins title match! 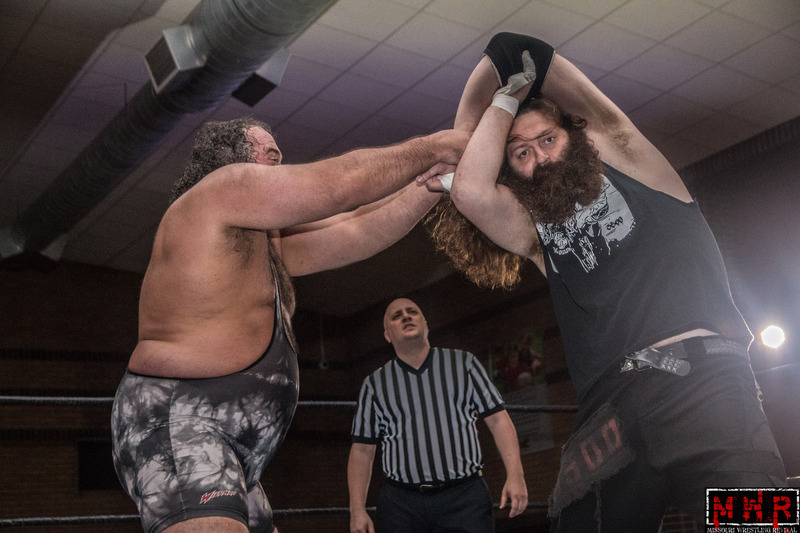 Hawkins wanted a no-disqualification match, thus keeping Wilder from taking the easy way out of another title defense. 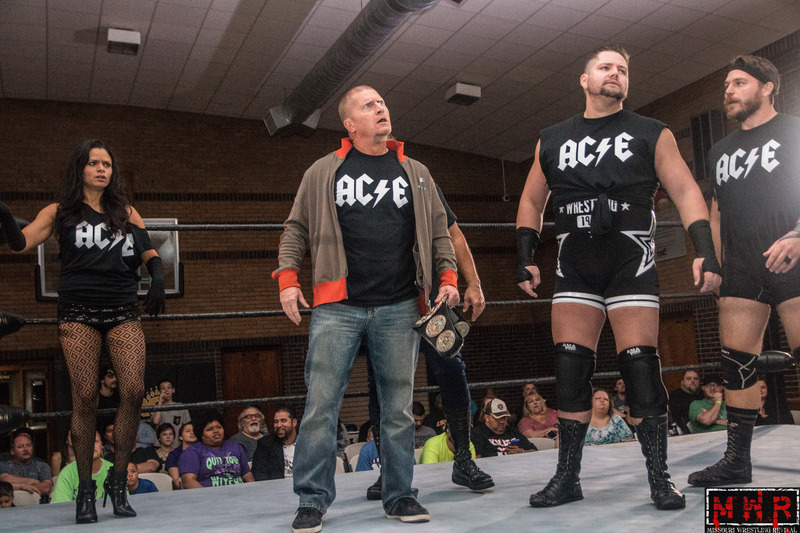 However, Wilder felt he had already proven himself to be the better man and wanted Ace to put something on the line as well: His Missouri Wrestling Revival “Sexiest Wrestler” award! 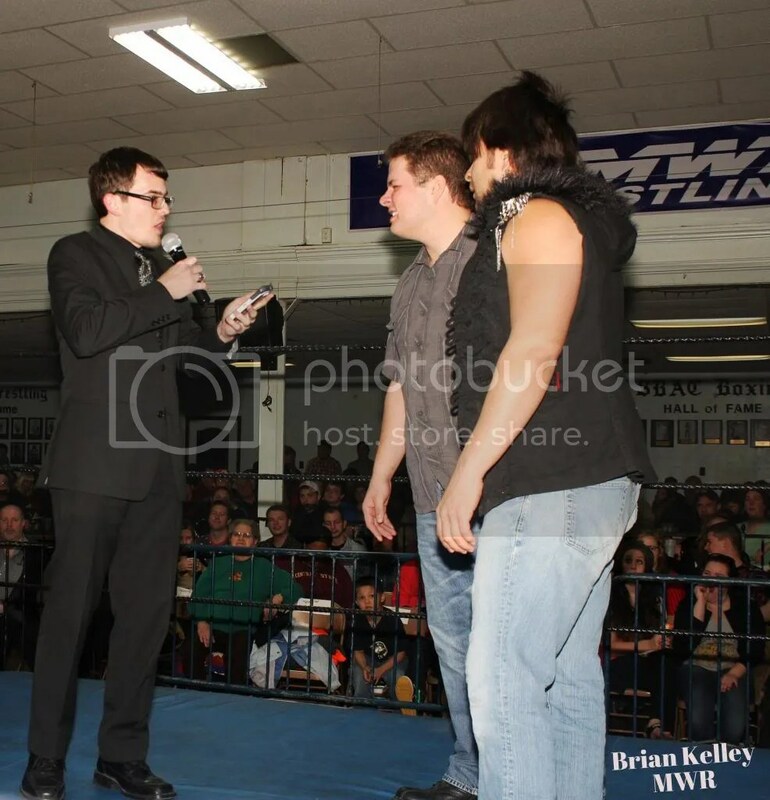 The February matchup will be title belt vs. award plaque! 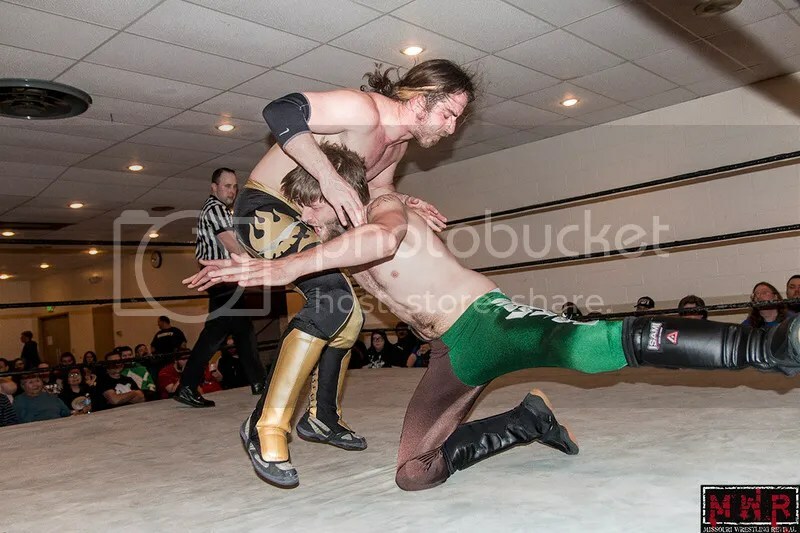 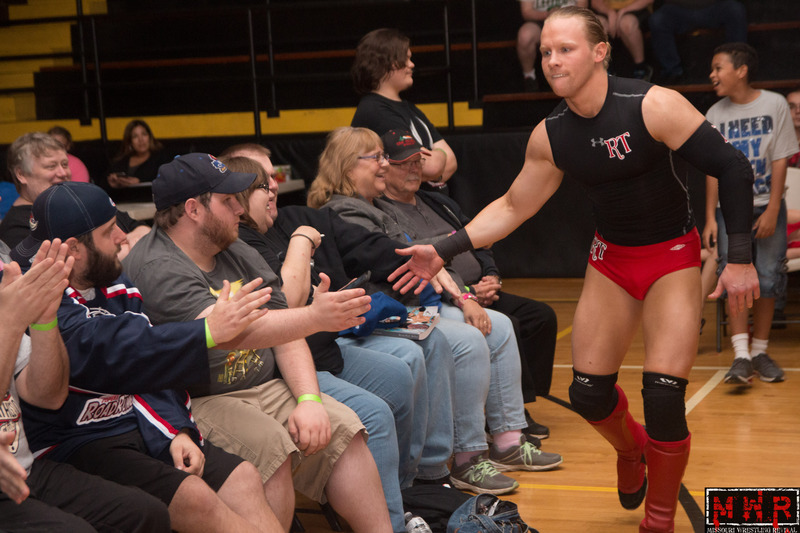 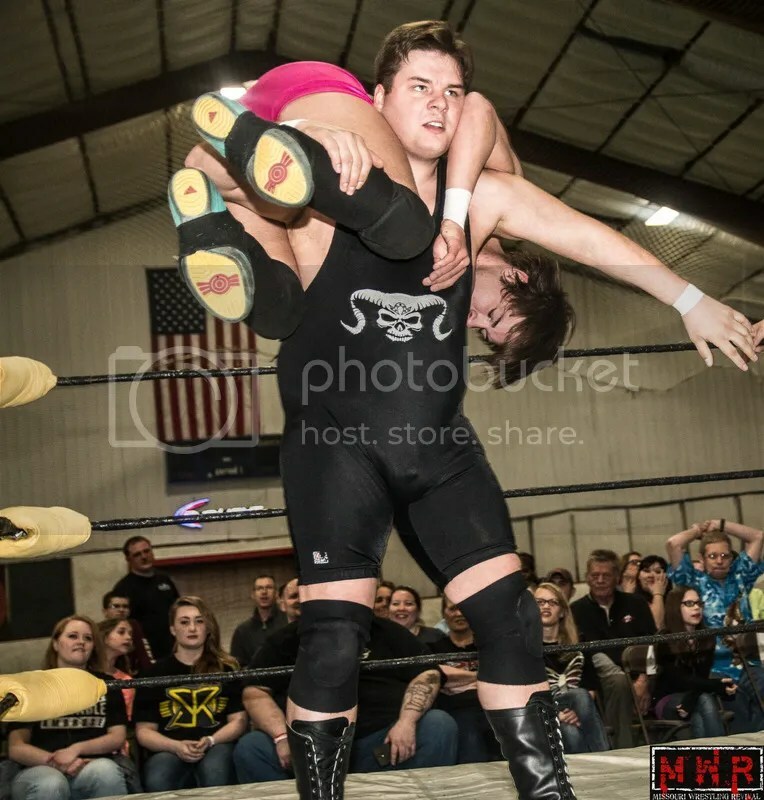 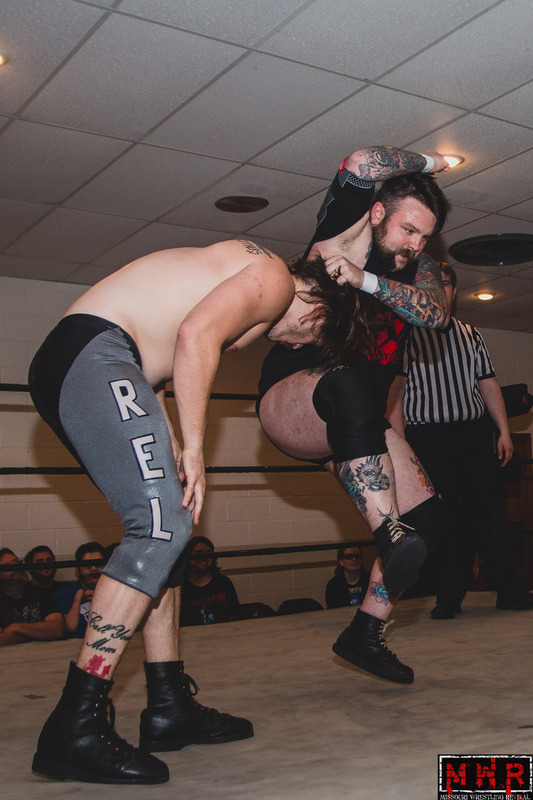 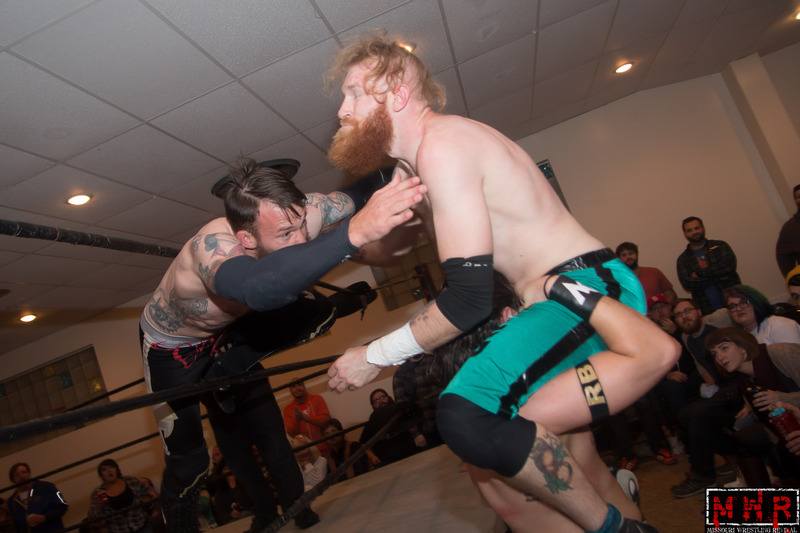 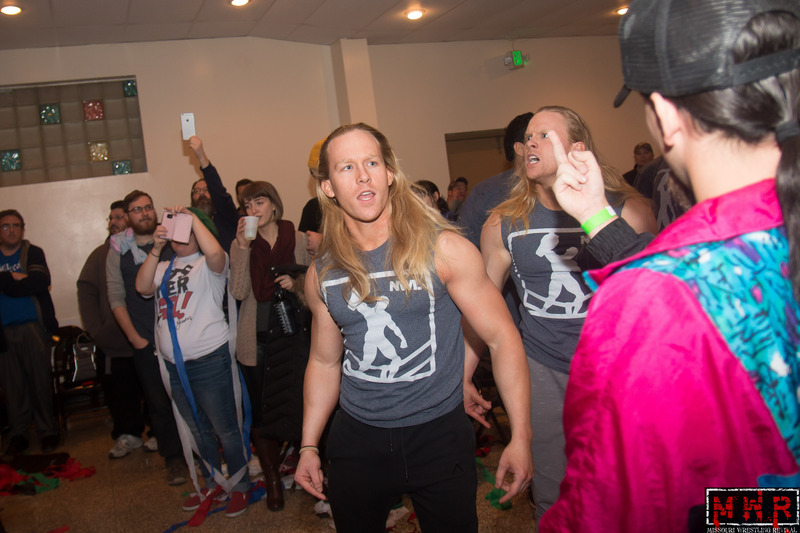 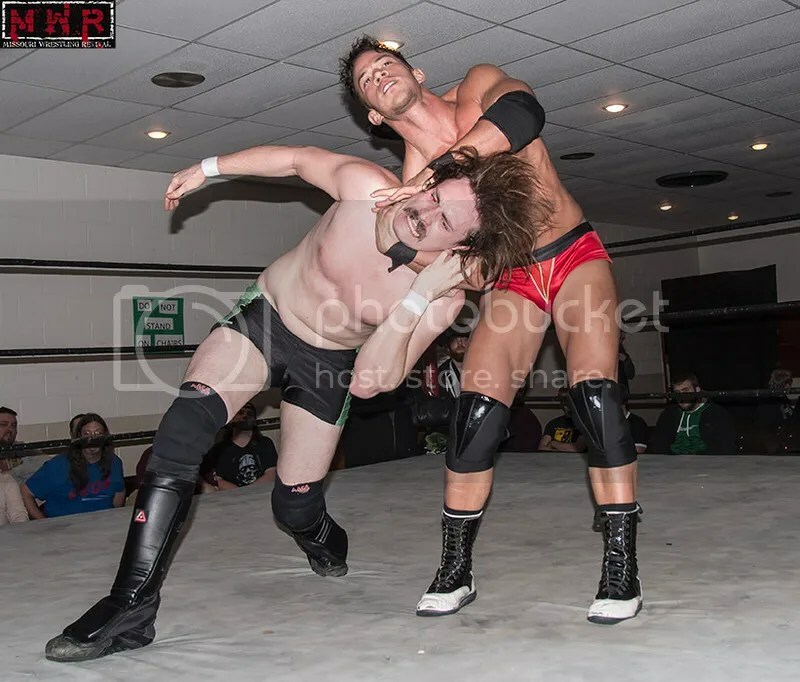 Webmaster Stevie K had a shot at double gold as he sought to add the Wild World Of Wrestling Television Championship to his Battle Royal Title. 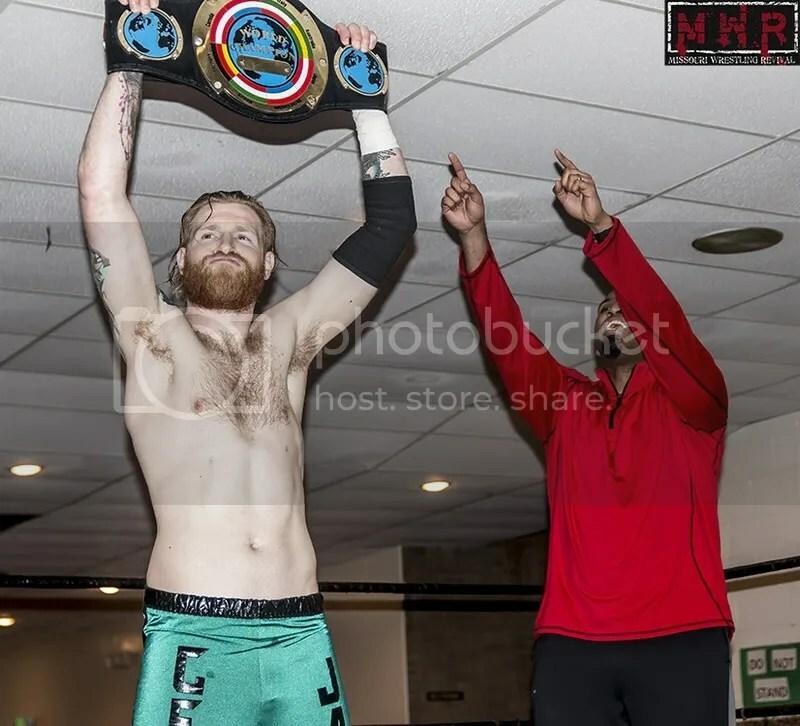 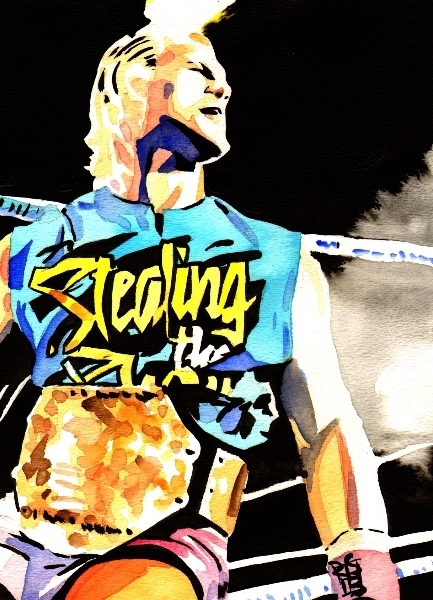 However, Jimmy D wasn’t about to let his third title reign end so quickly…when the going got tough, D took a walk and got counted out to save his title. 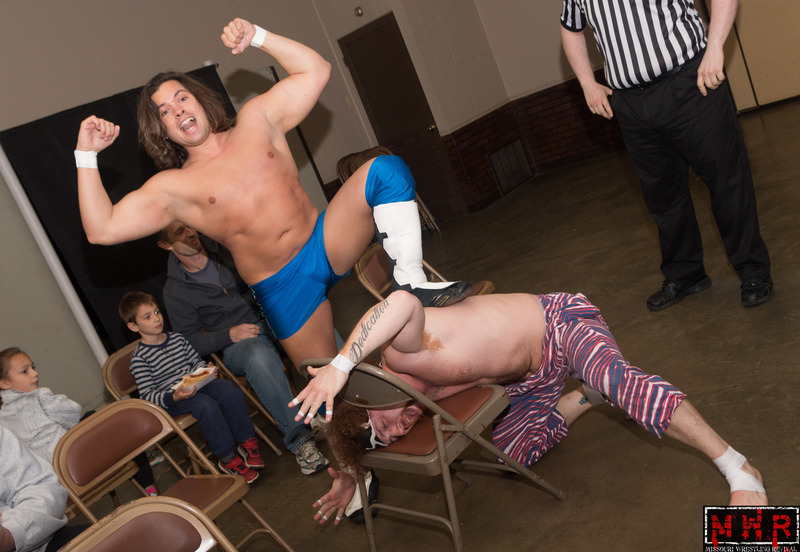 Big Dave Osborne seemed to be in a sportsmanlike mood as he took on A.J. 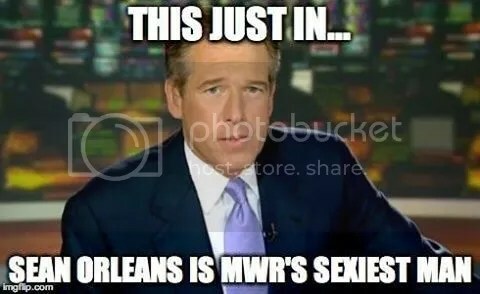 Williams. 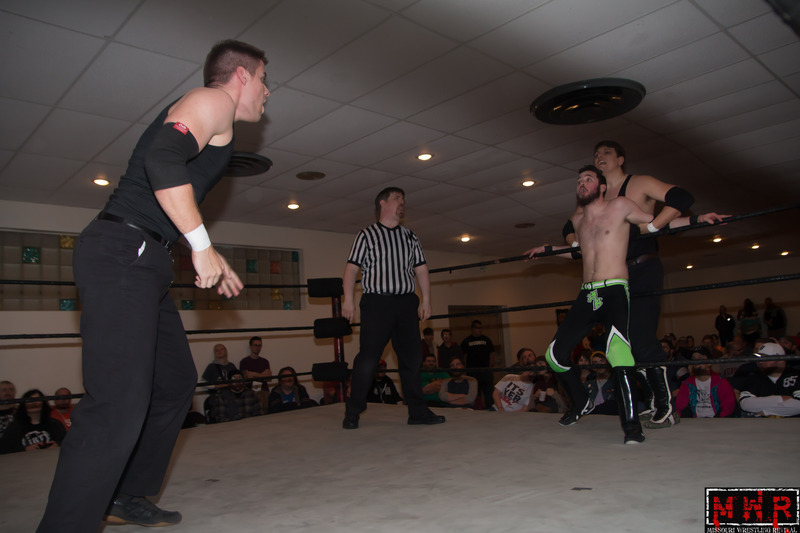 It was a battle of power and size against speed and agility, but an outside factor would decide the outcome. 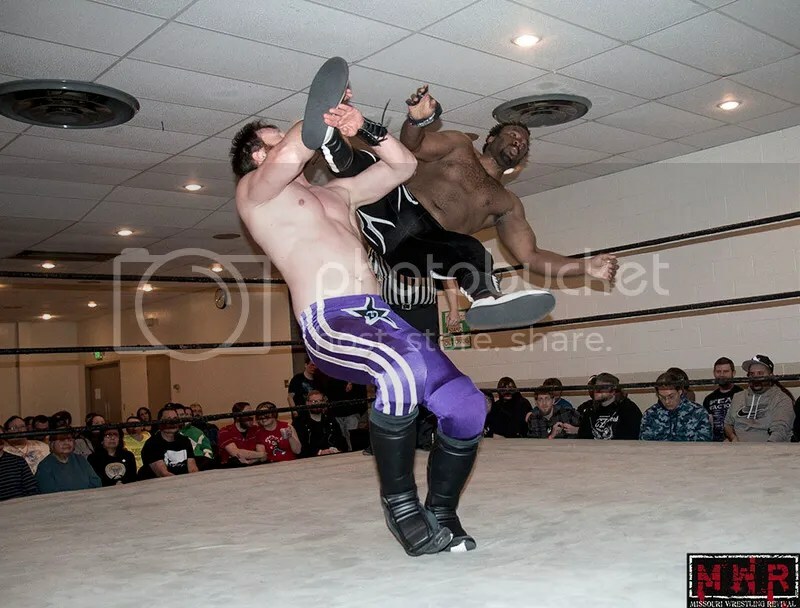 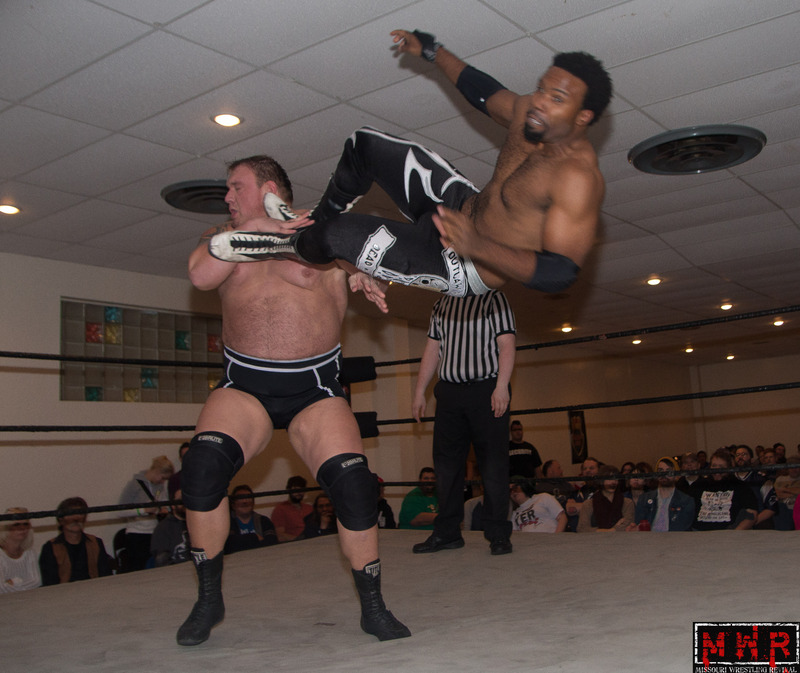 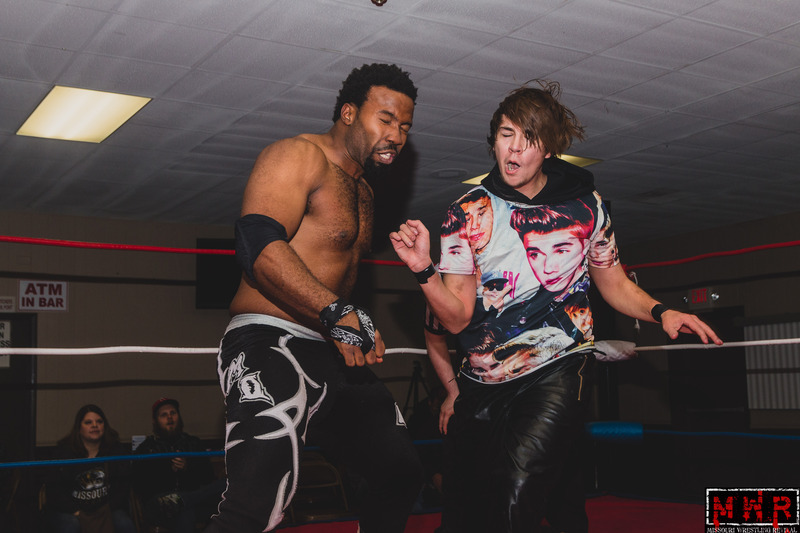 Barackus made another appearance and the distraction led to Osborne falling prey to Williams’ superkick. 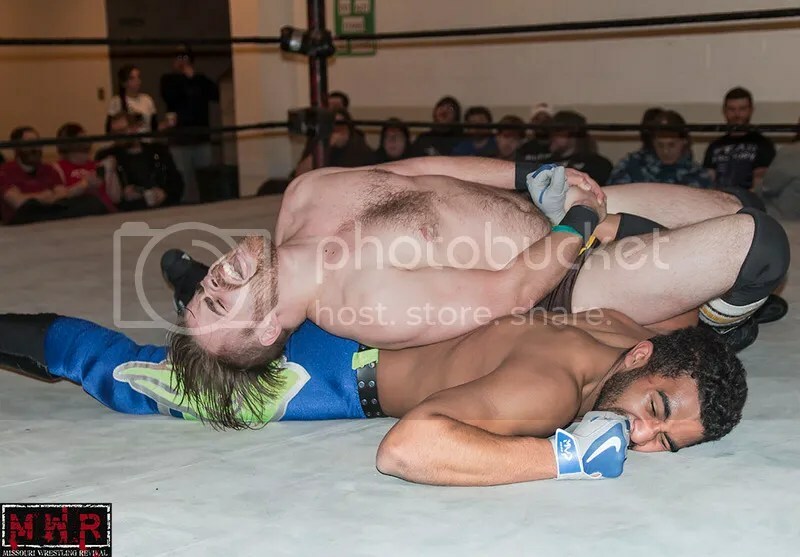 The big man laid out Osborne with his clawhold Flatliner after the match, making another statement at the expense of the former Heavyweight Champ. 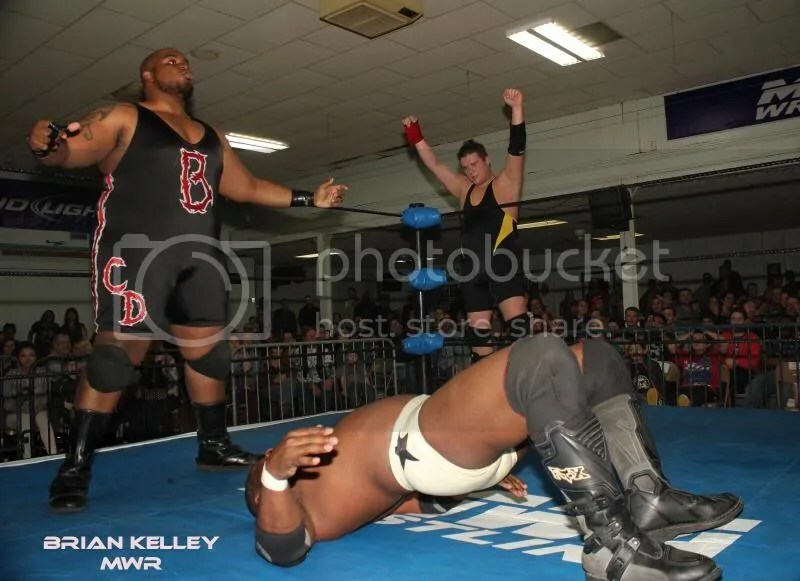 The main event of the evening had bad blood on all sides…new Heavyweight Champion Brian James teamed up with former titleholder Gary Jackson against Espinosa and Mephisto. 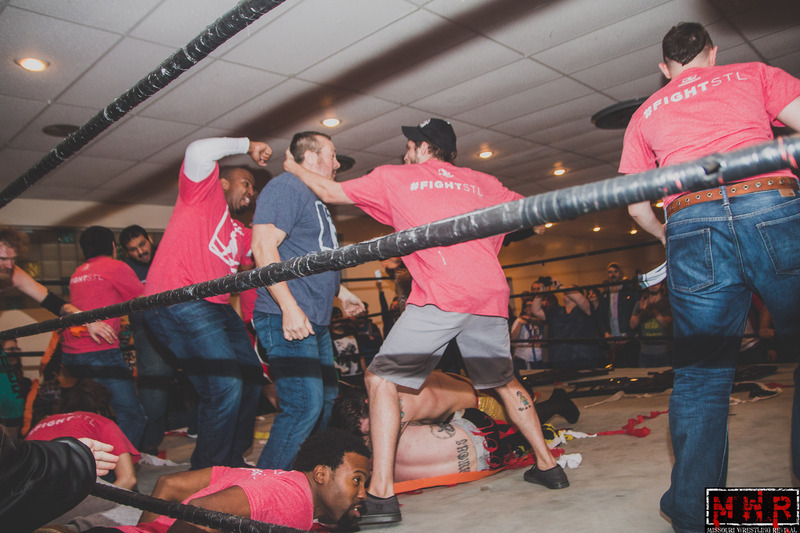 The referee had trouble maintaining law and order and soon it erupted into a full-scale fight. 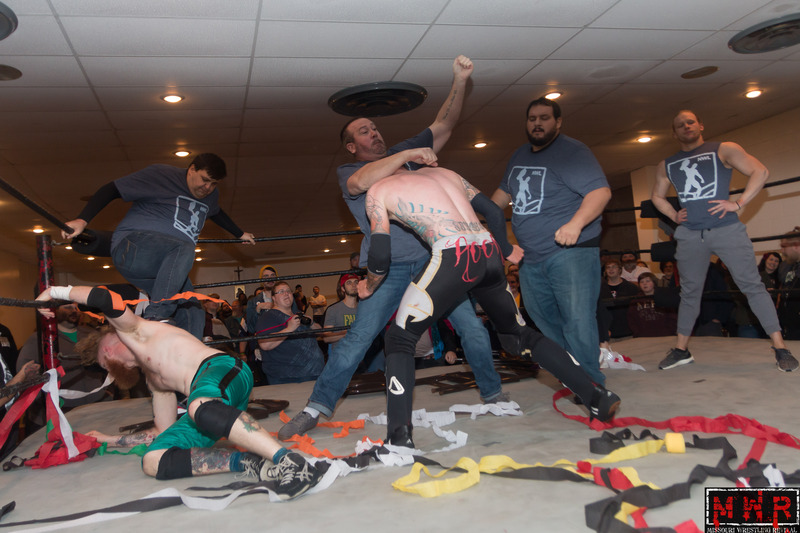 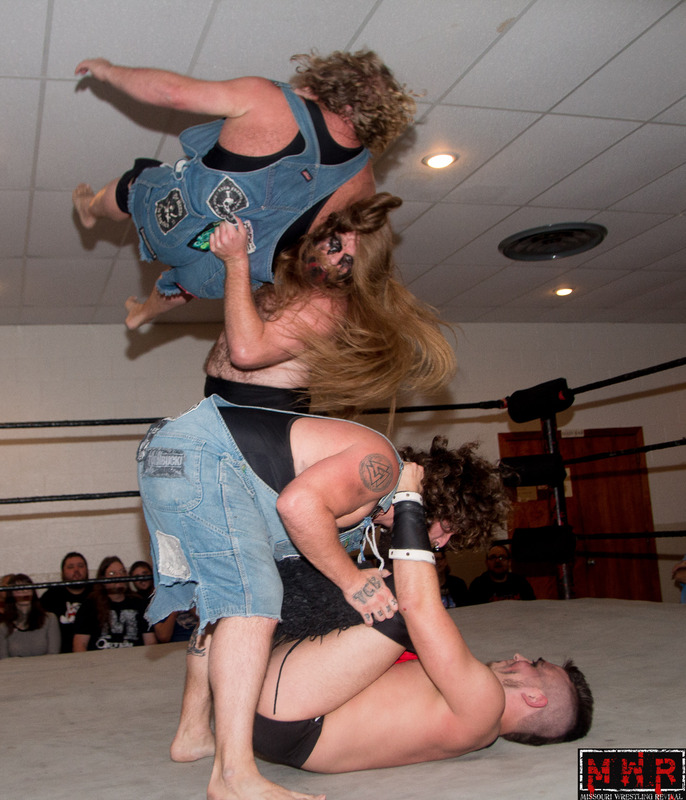 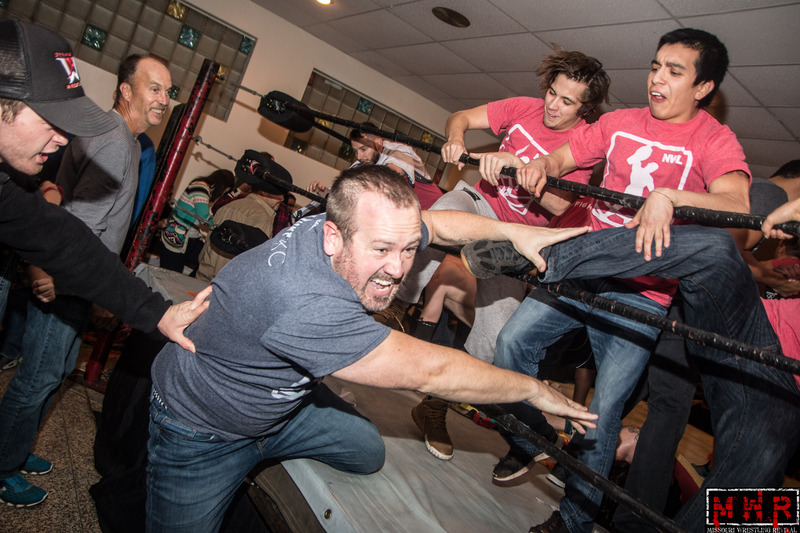 The official counted all four men out of the ring but that didn’t end the war by a longshot! 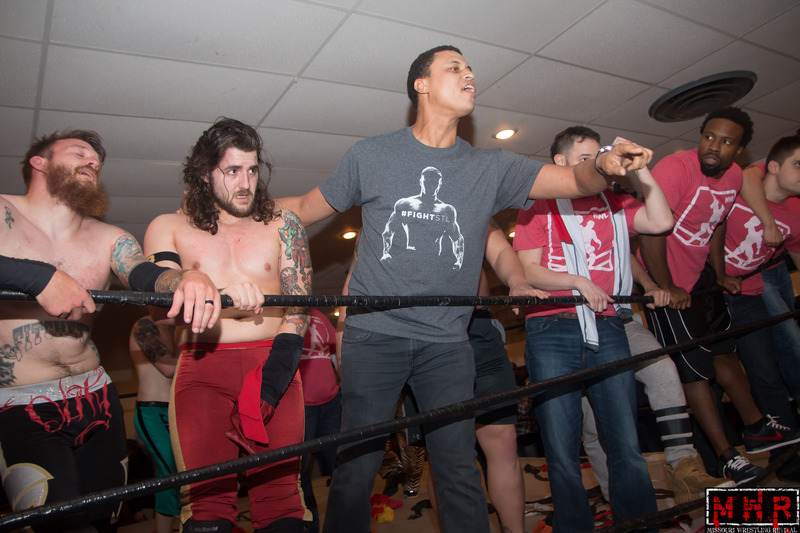 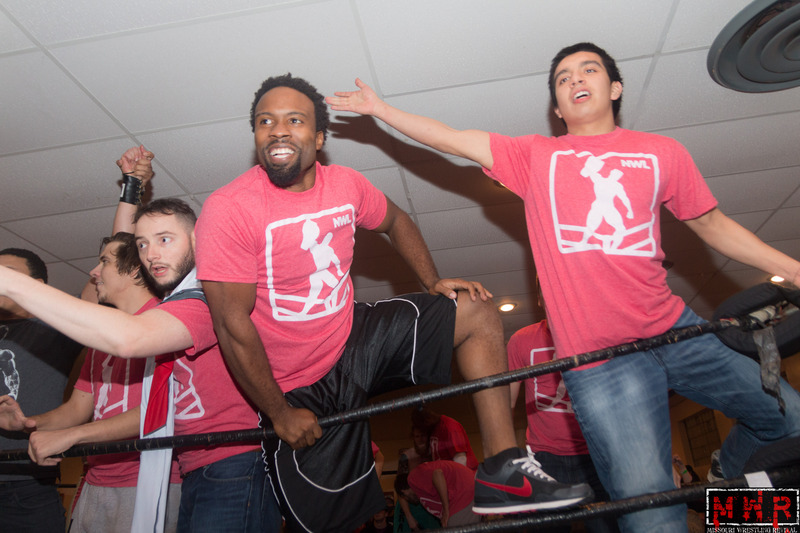 Barackus entered the ring and assisted Espinosa and Mephisto in their assault on James and Jackson, revealing his allegiance to the self-proclaimed young guns of the promotion. 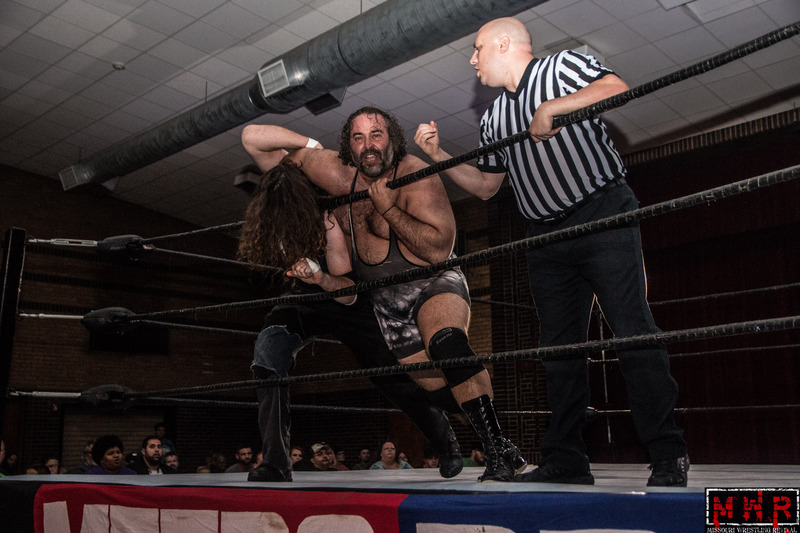 Jackson was handcuffed to the ropes as the trio focused their attention on Brian James, but the new commissioner finally revealed himself and ordered a stop to the attack: It was Jim Harris! 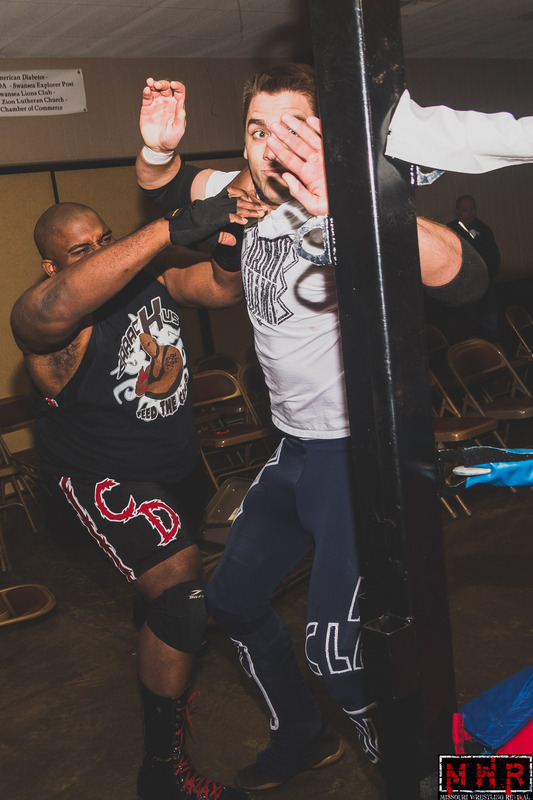 Harris acted swiftly, suspending Barackus for a month after his repeated interference in matches. 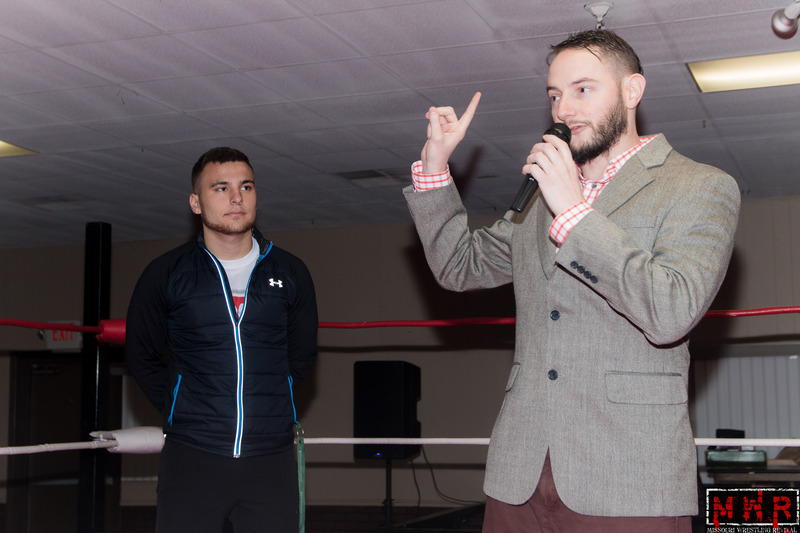 He announced that Espinosa would get a title rematch with James in February, but it would be his ONLY rematch for the gold. 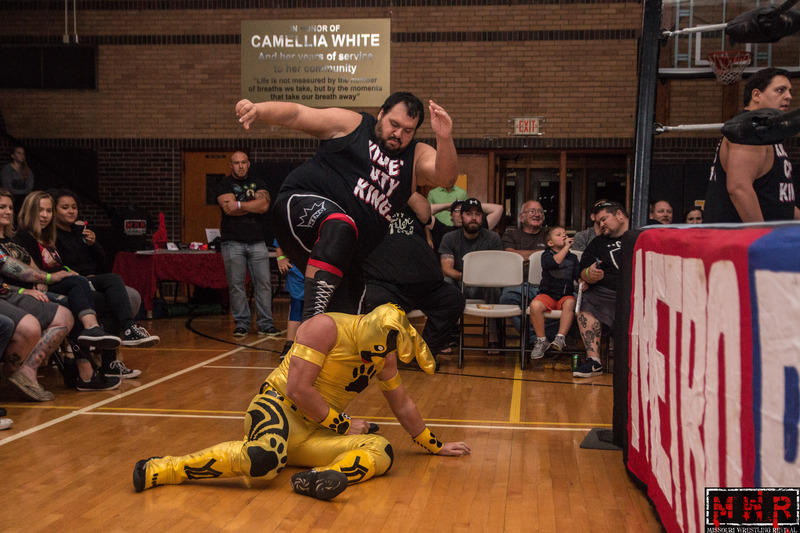 Finally, he announced that he had a surprise for Mephisto…and we would all have to wait until the February show to find out what that surprise is! 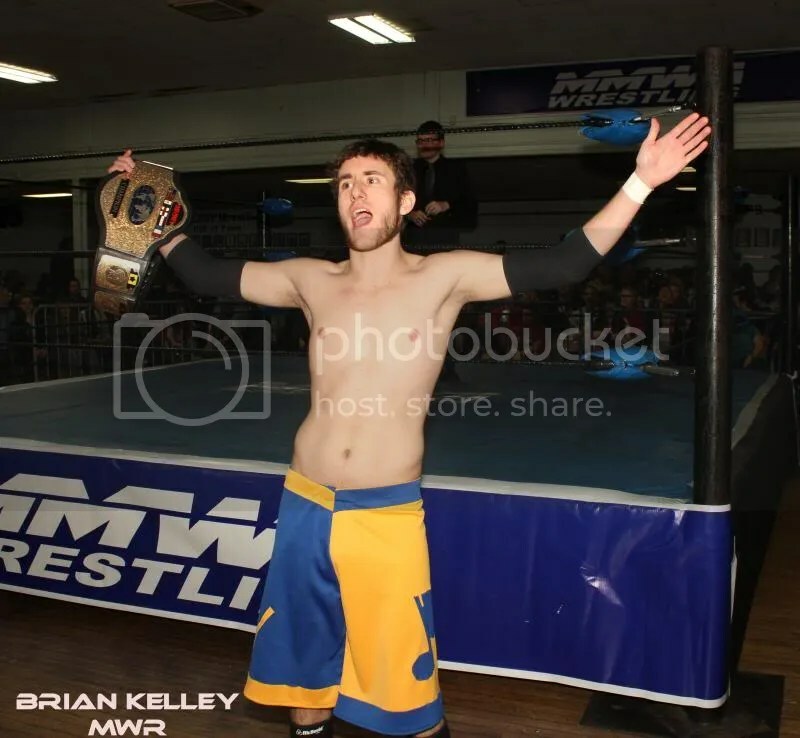 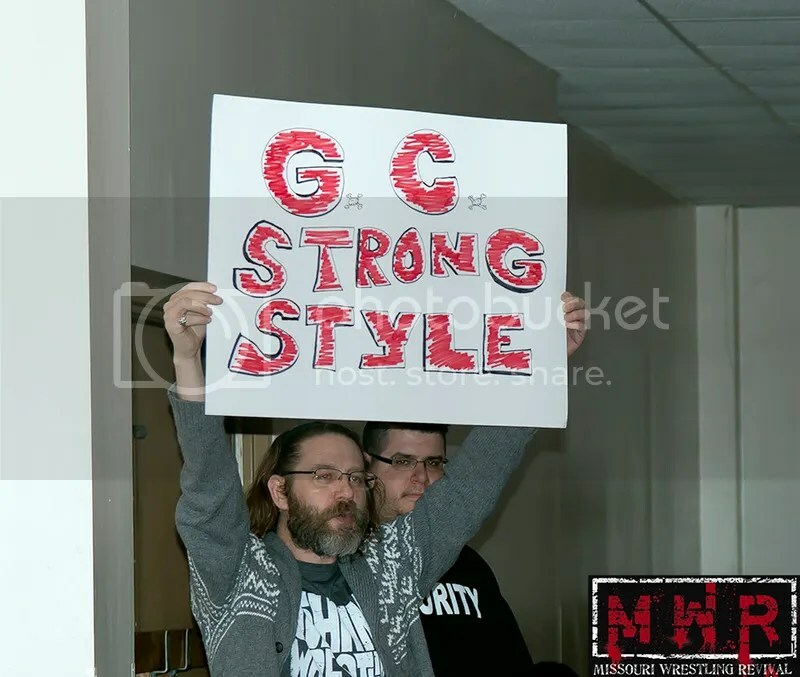 February 8th is already shaping up to be a major event with two titles on the line…new Commissioner Jim Harris has already made his first step in restoring law and order to the MMWA!